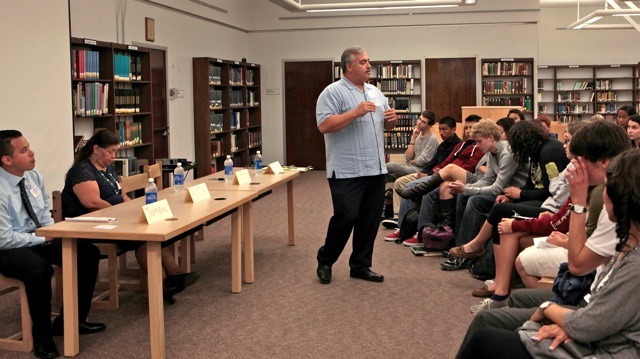 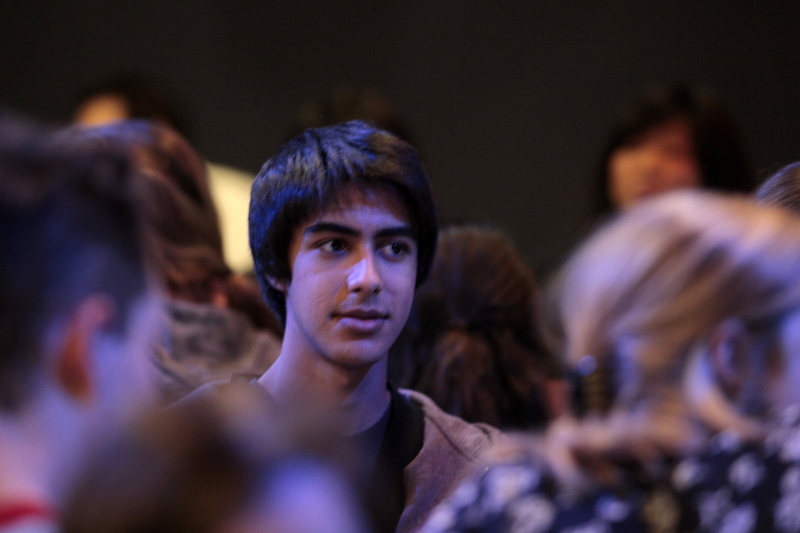 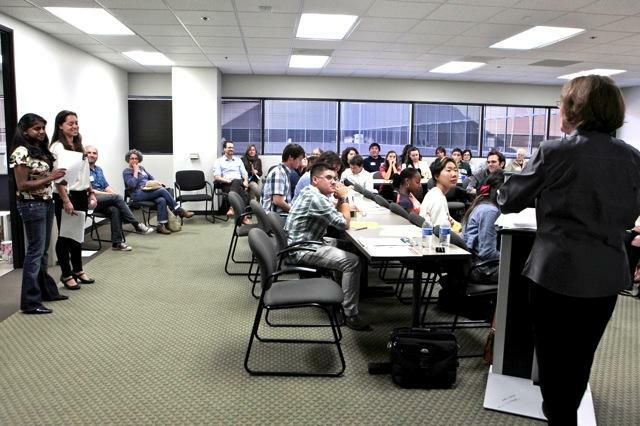 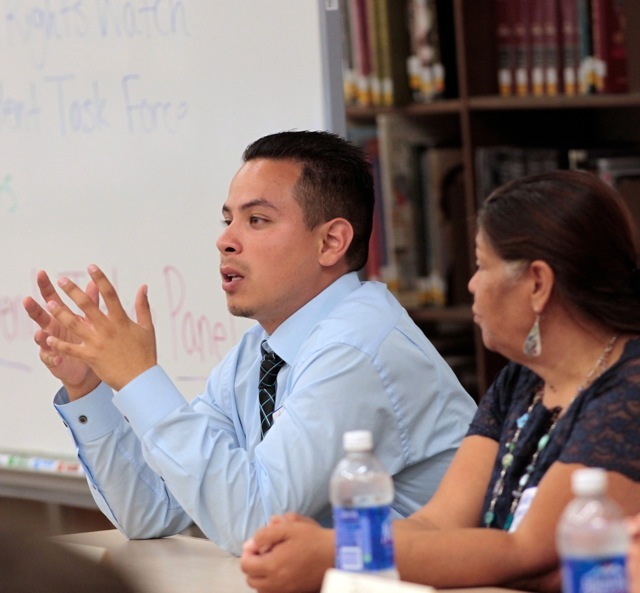 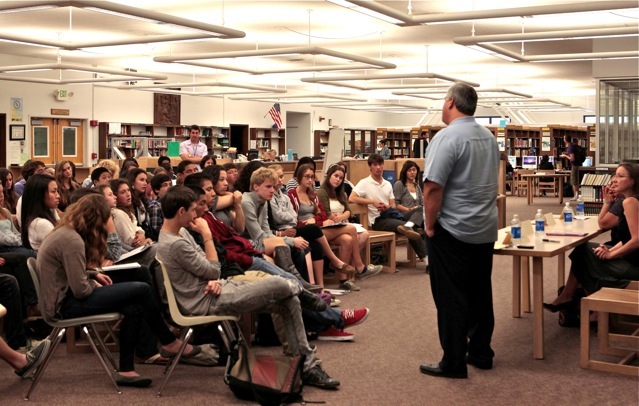 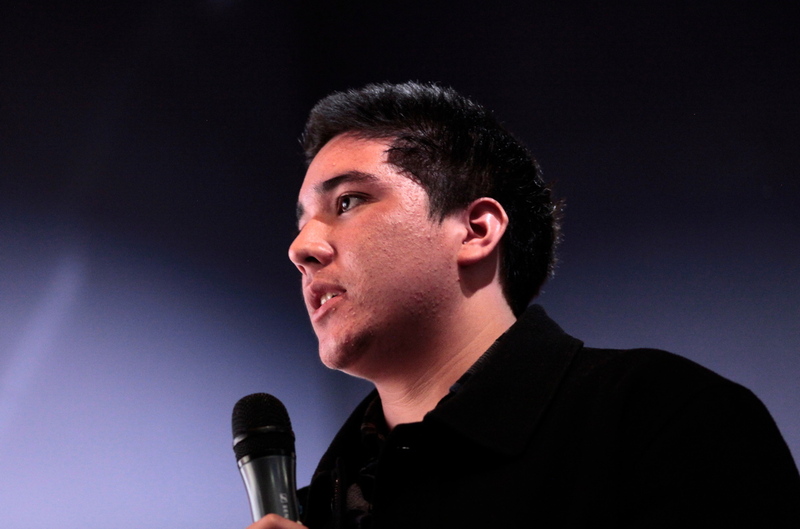 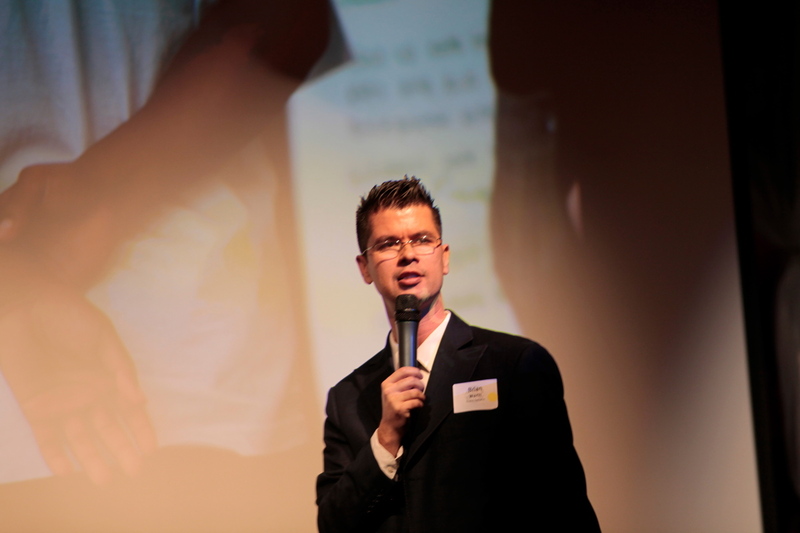 June 6, 2011: Santa Monica High School STF concluded the year with a speakers’ panel on juvenile justice. 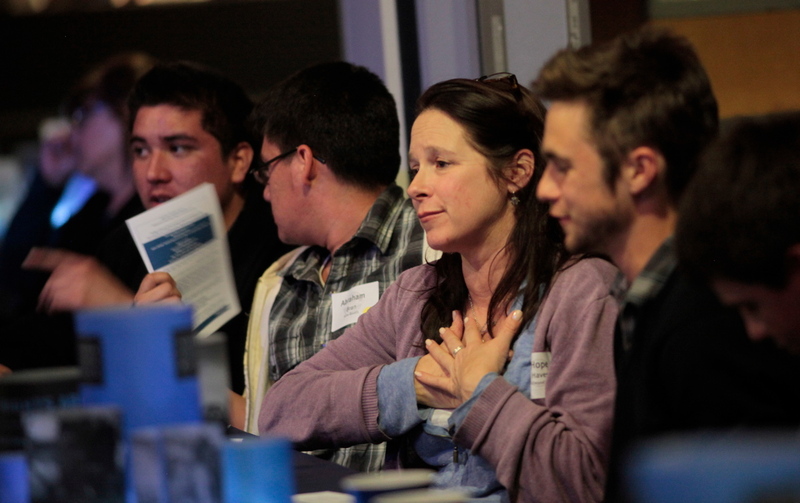 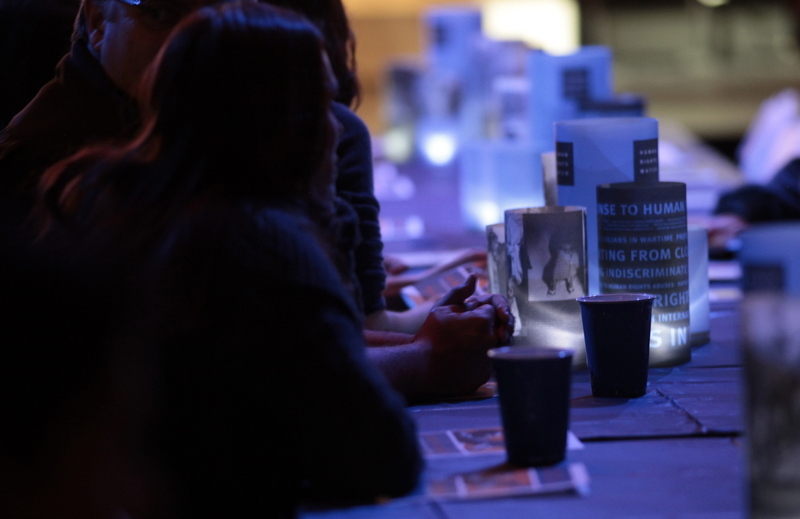 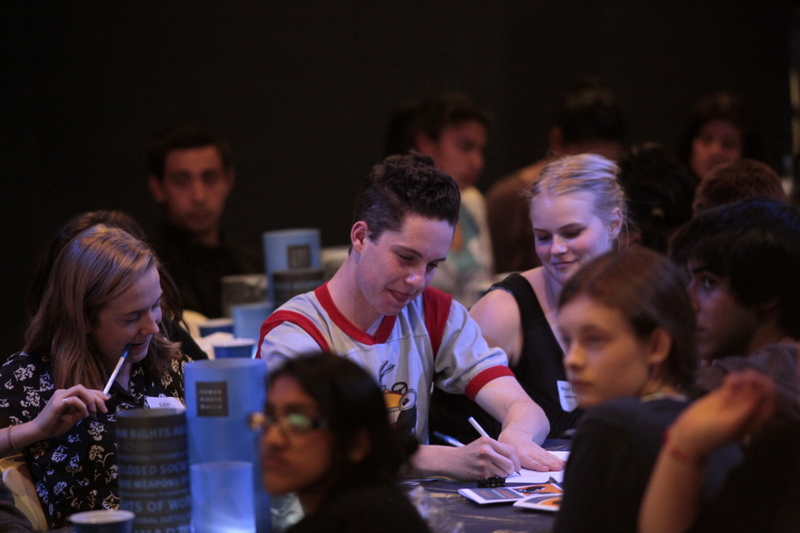 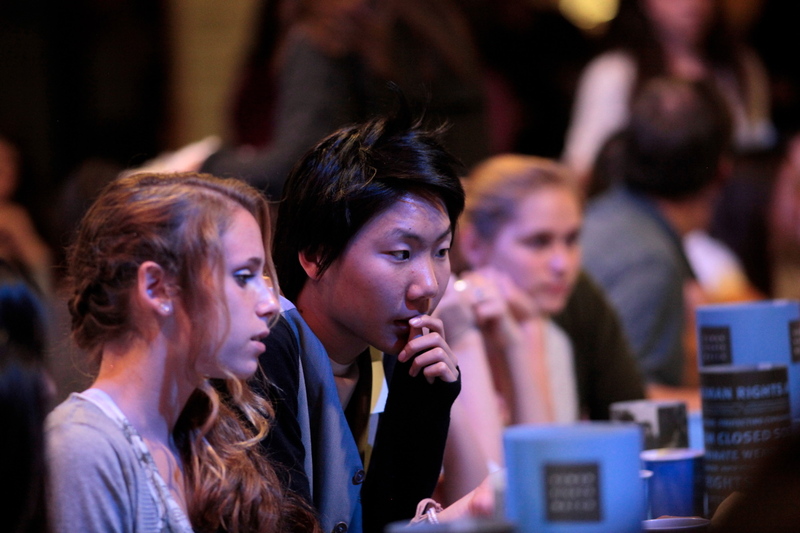 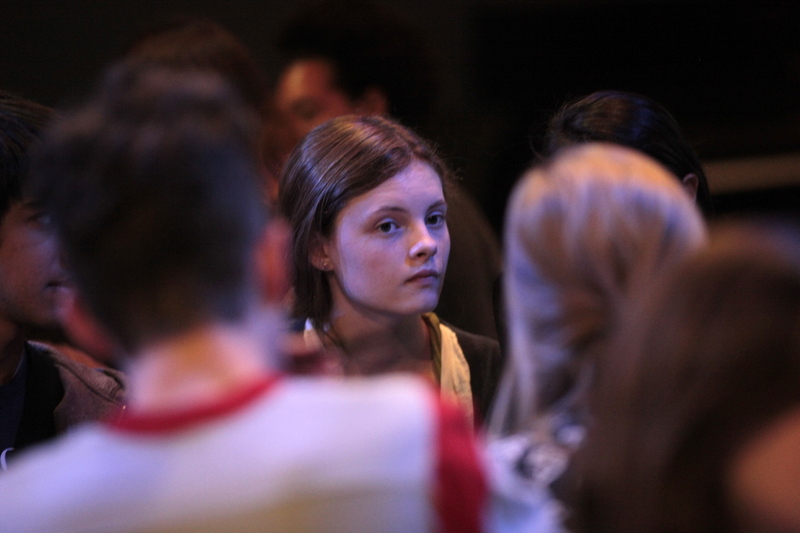 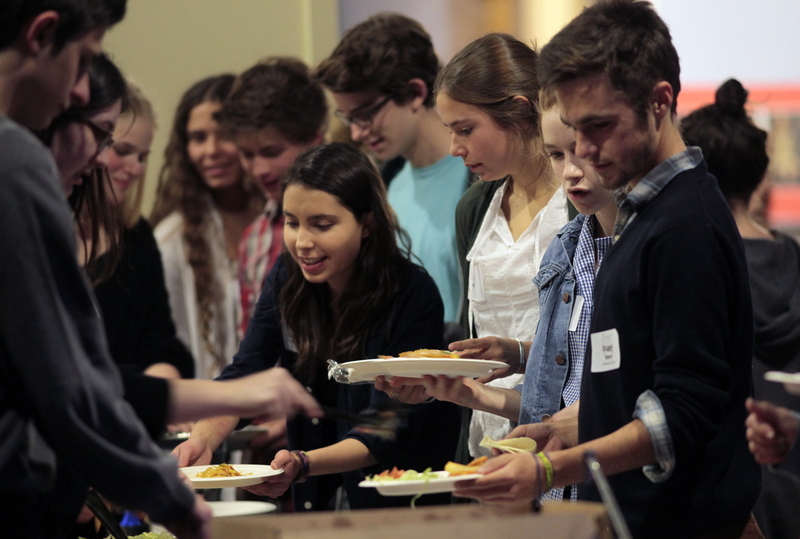 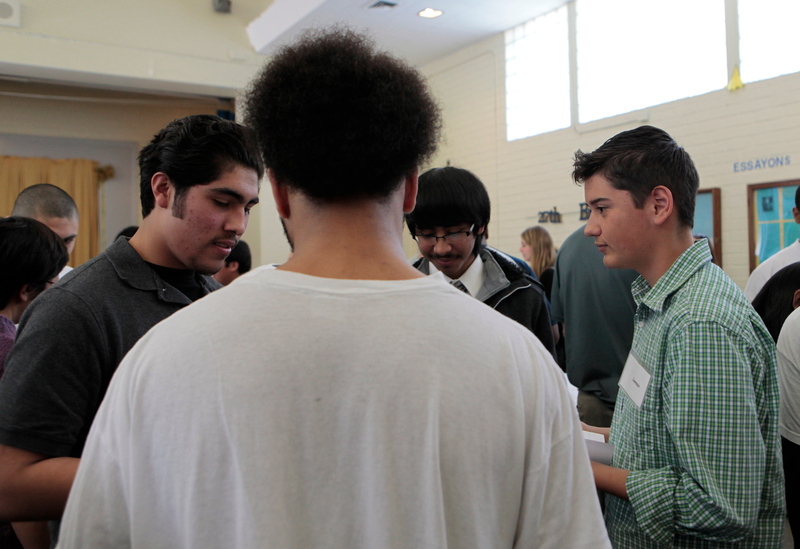 Over 80 students attended the event featuring viewpoints on reconciliation and forgiveness for juvenile crime. 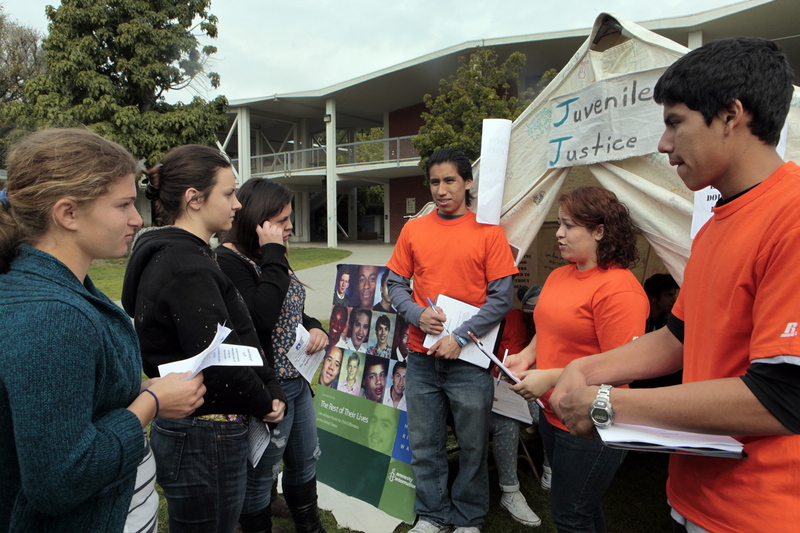 Facilitated by Chaplin Javier Stauring, speakers included: Jermaine Subia, formerly incarcerated youth, now Los Angeles City employee, writer and filmmaker; Brandy Novak, relative of juvenile life-without-parolee; and, Rita Chairez, family member of victims of juvenile crime. 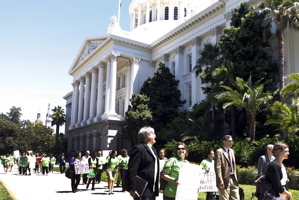 Currently, the California State Assembly Members are debating Senate Bill 9, a measure that seeks to give those serving juvenile life-without-parole a chance to have their case reheard and possibly resentenced. 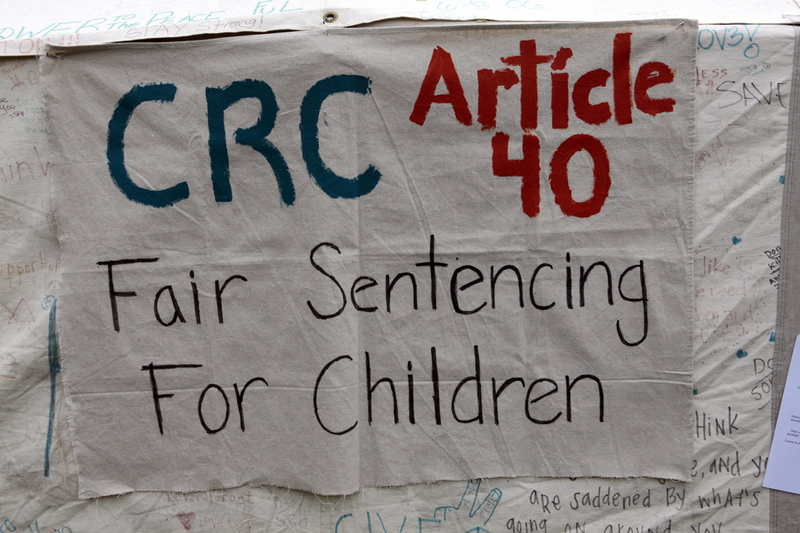 Passage of SB 9 would bring California one step closer to an international standard that states it is inhumane to give children life-sentences (Article 40, Convention on the Rights of Child). 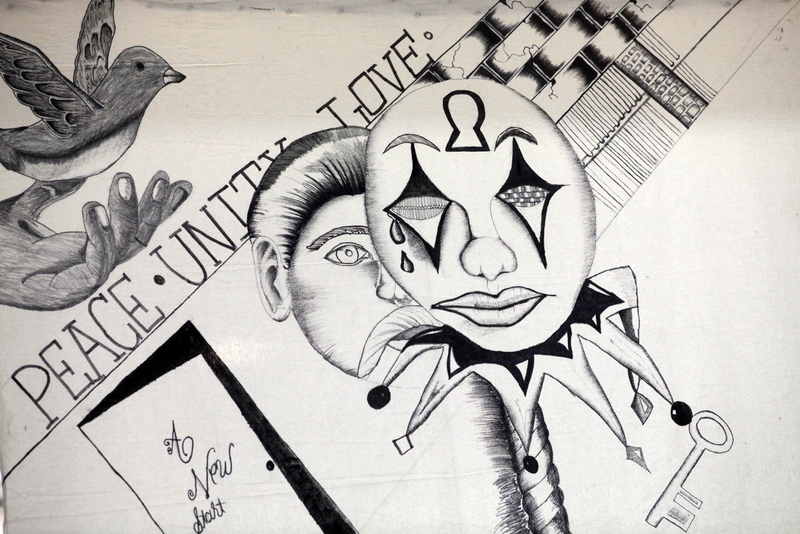 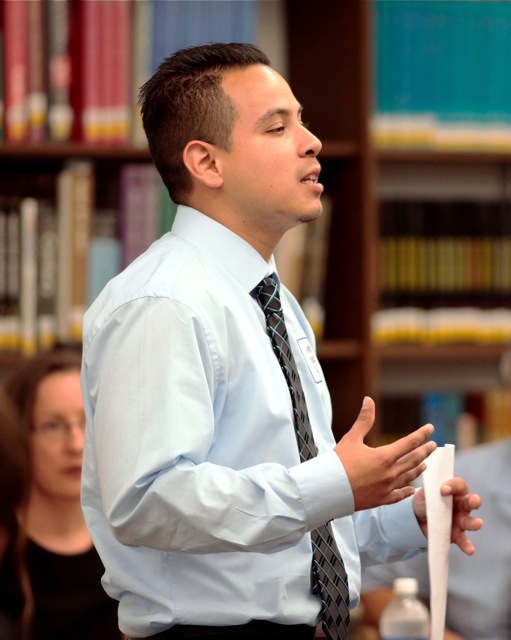 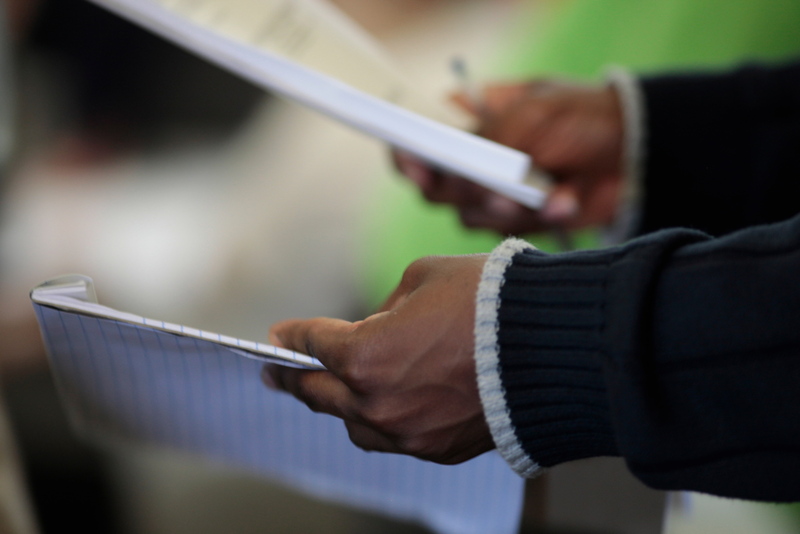 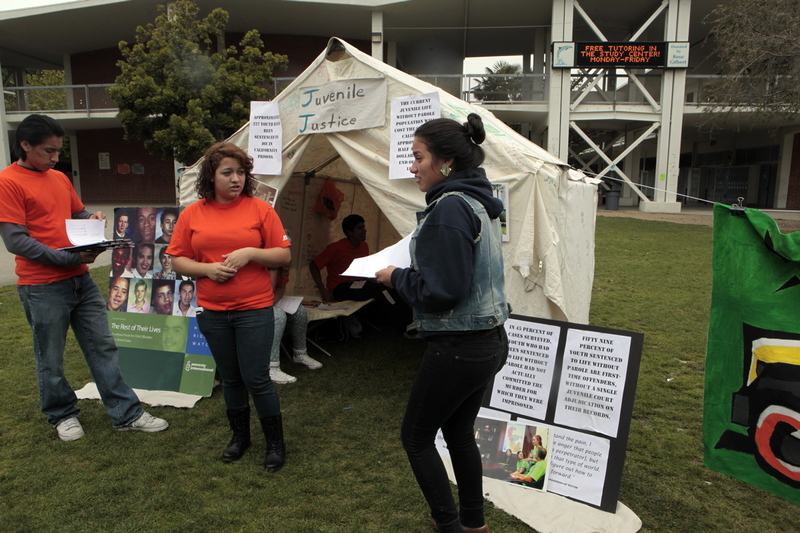 Read an excerpt from Jermaine Subia’s prison journal, as shared with SAMO students. 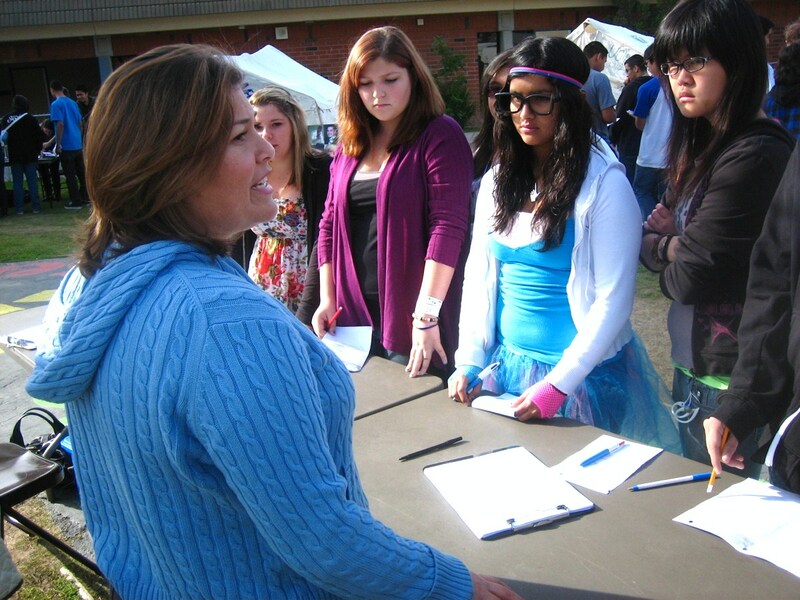 Carson HS STF meets with Senator Lieu’s Field Representative Jennifer Zivkovic. 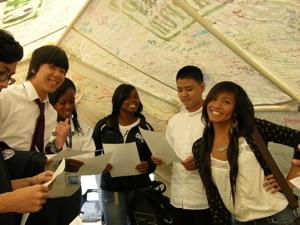 May 26, 2011: Despite pressures of AP exams and class finals, three seniors and one junior from Carson High School’s STF visited the district office of Senator Ted Lieu just hours after the California Senate Appropriations Committee passed Senate Bill 9 (SB 9) out of committee on a vote of 6 to 2, including an “aye” from Sen. Lieu. 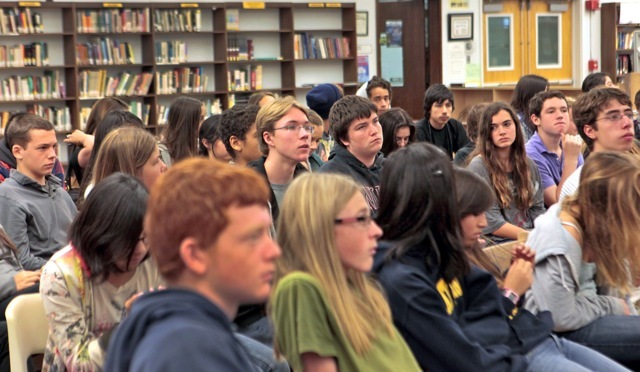 Although Senator Lieu voted “No”, SB 9 was passed the following week in the Senate in a 21 to 16 vote on Wednesday, June 1. 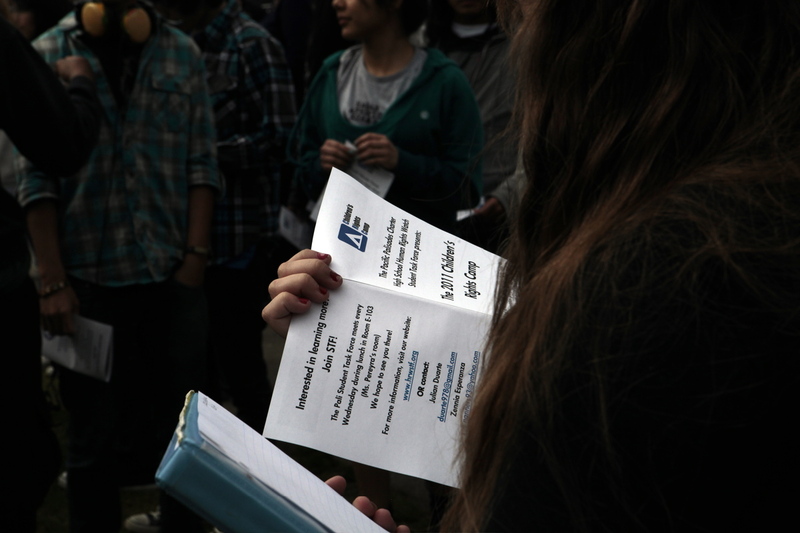 The CA Assembly is expected to hear SB 9 in the summer 2011. 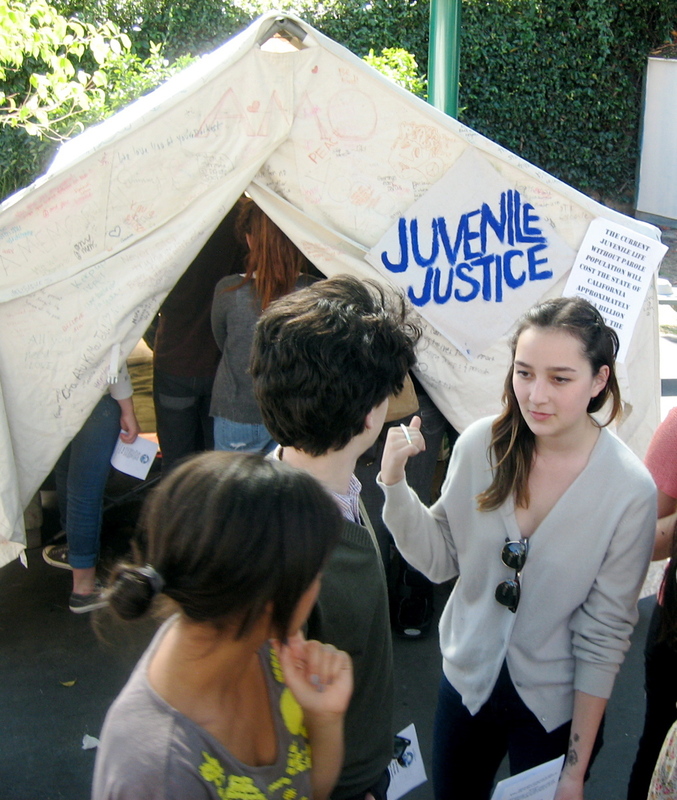 The STF student delegates thanked the senator’s staff for their support of SB 9 and presented 280 signatures urging for further reforms for youth serving juvenile life-without-parole sentences (JLWOP). 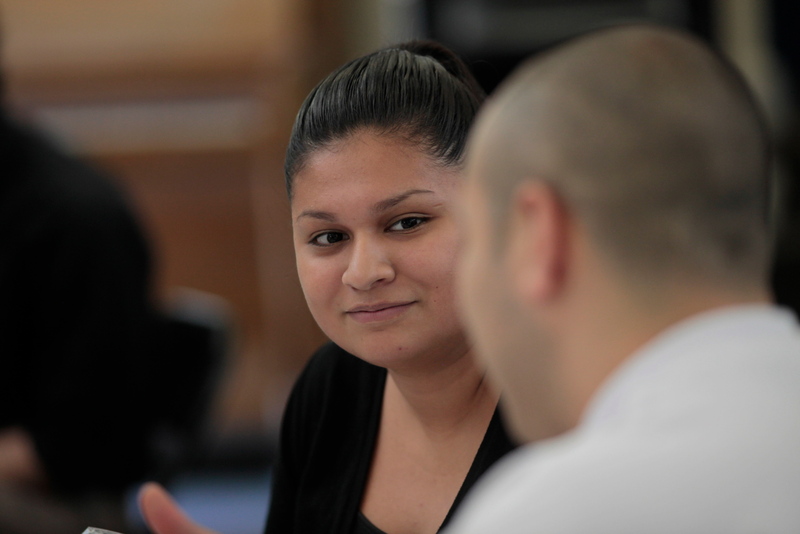 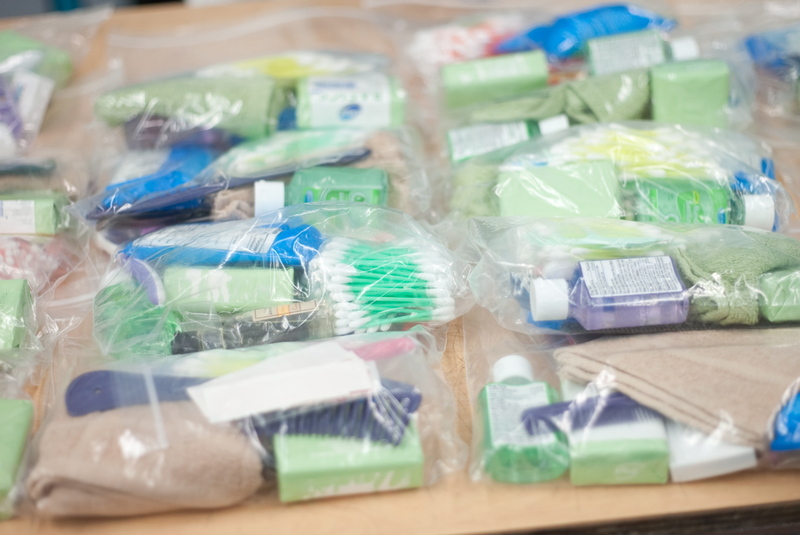 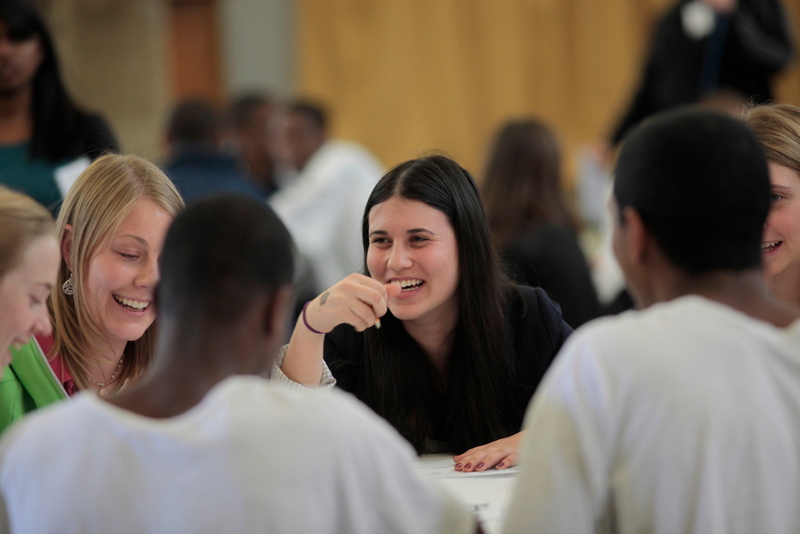 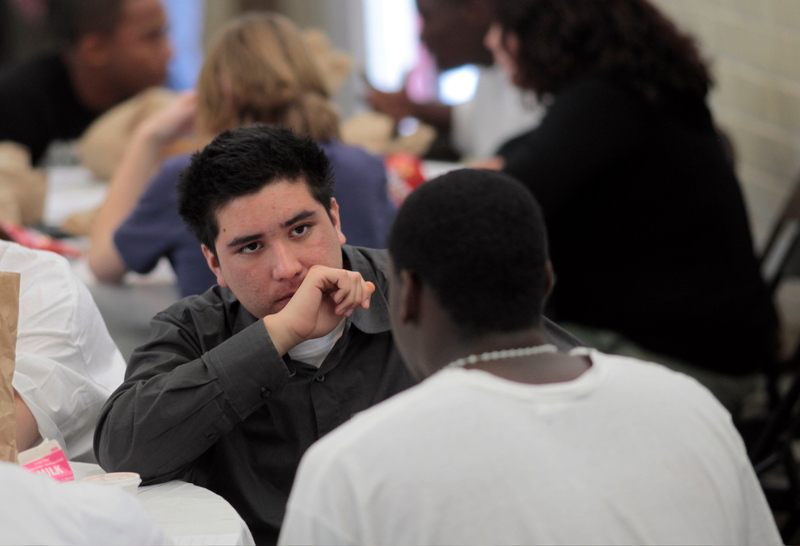 Currently, there are over 290 youth with JLWOP sentences in California, and over 2,500 youth in the United States. 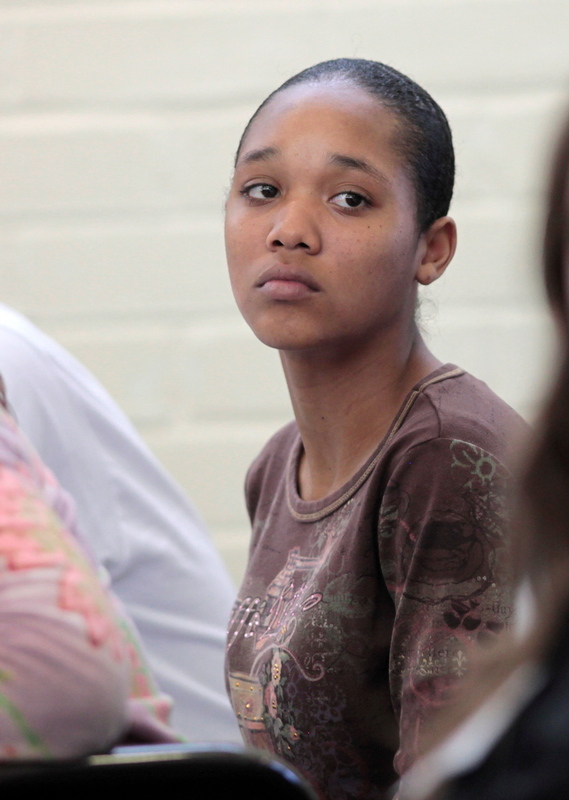 The US remains the only country in the world to give minors this extreme sentence. 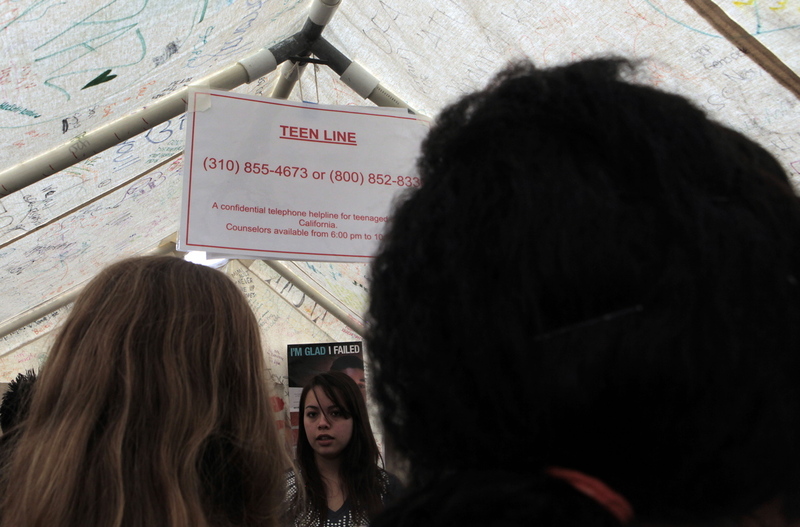 For more information, please visit www.FairSentencingForYouth.org. 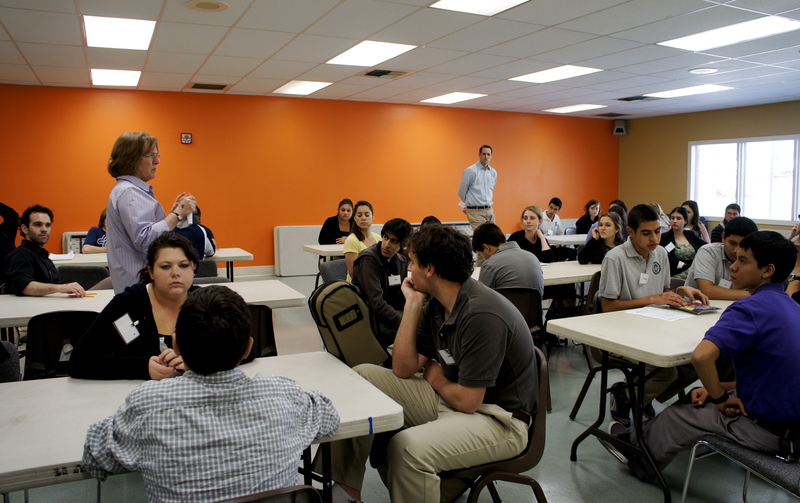 May 11, 2011: Current and incoming STF leaders and teacher advisors attended a final meeting to celebrate this year’s events, inspire new student leaders and teachers, and send off our graduating seniors. 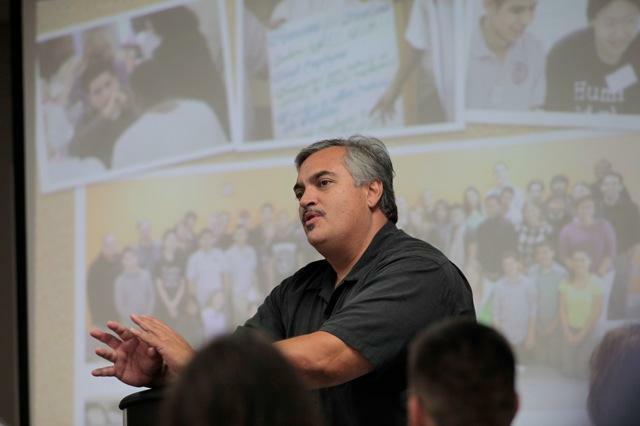 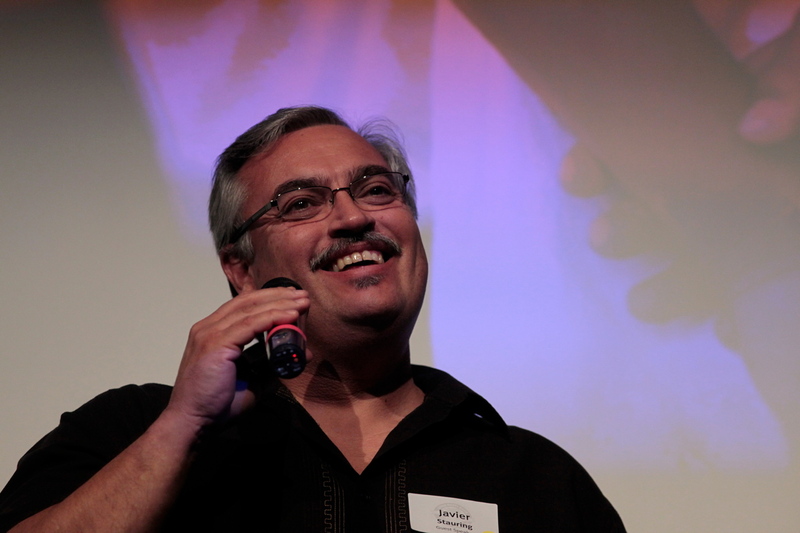 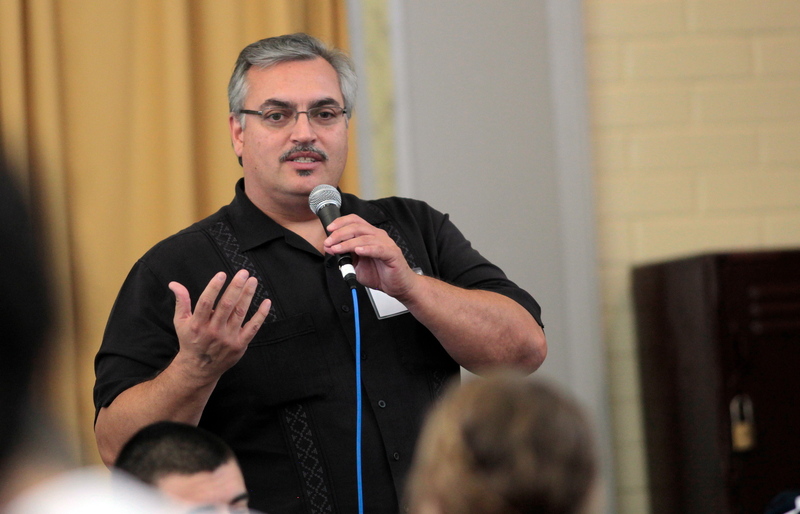 Guest speaker Javier Stauring, Co-director of the Office of Restorative Justice for the Archdiocese in Los Angeles, applauded STF’s efforts this year on Juvenile Justice. 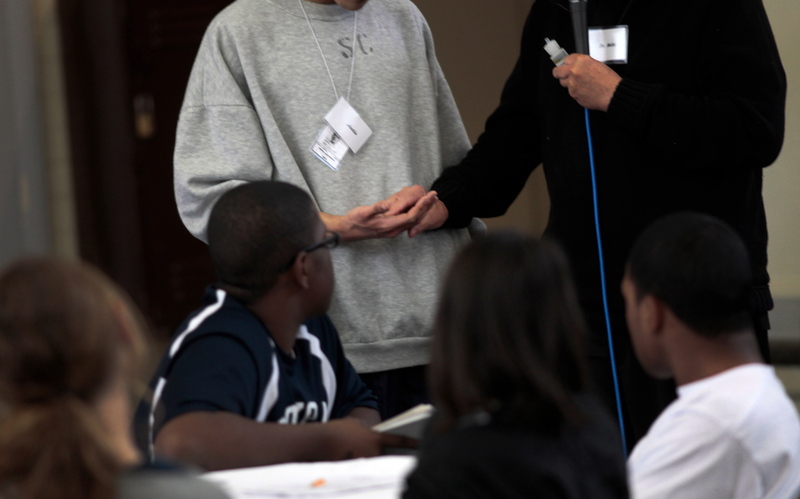 He discussed the importance of STF’s unprecedented visit to a juvenile state facility in February and his current efforts to garner support from victims of juvenile crime. 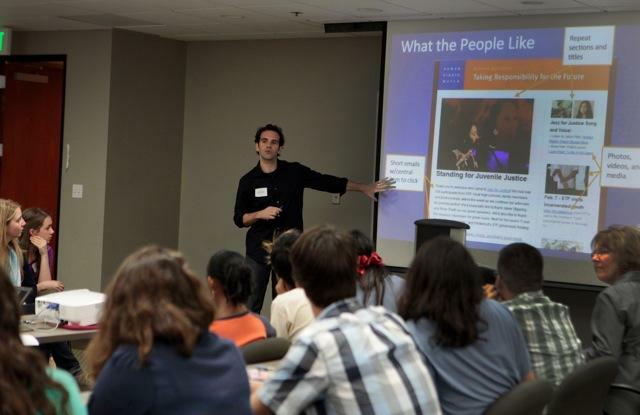 –STF hosted 2nd Annual Jazz for Justice Training, bringing together more than 130 educators, students, and human rights activists. 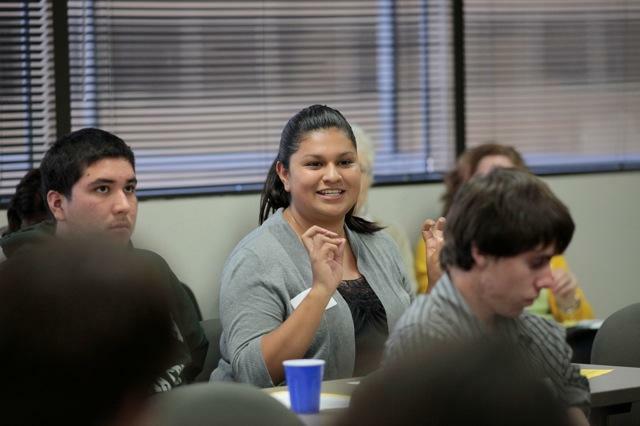 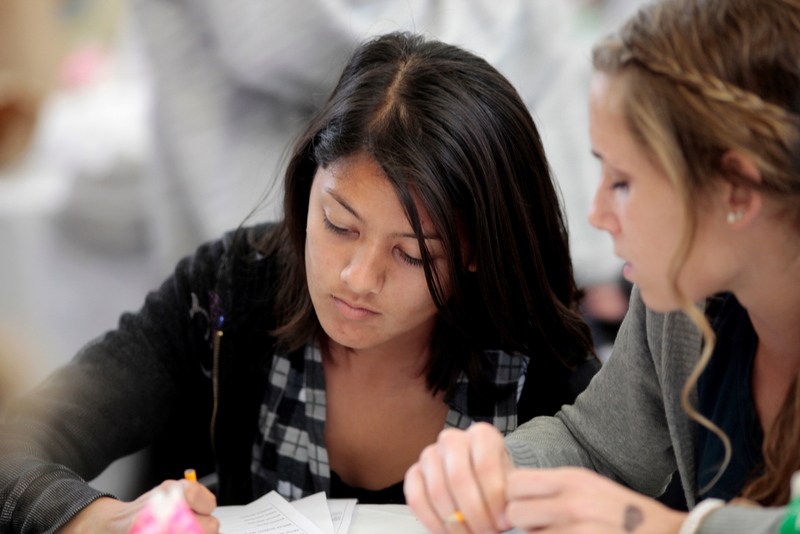 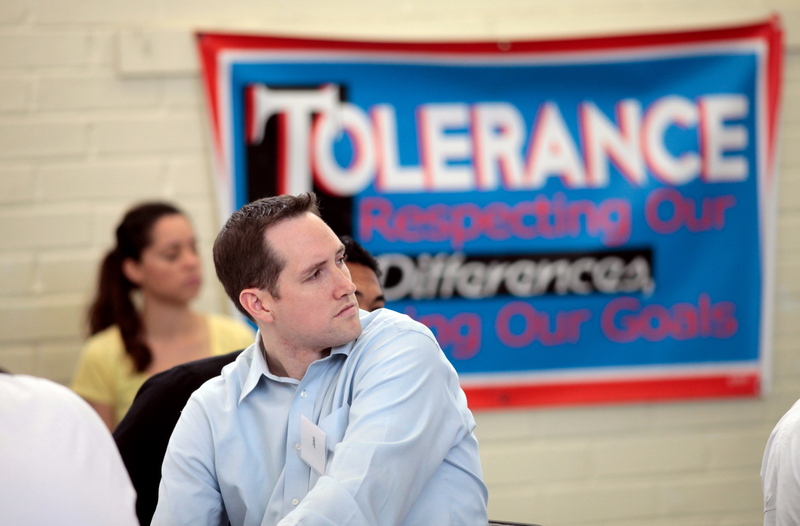 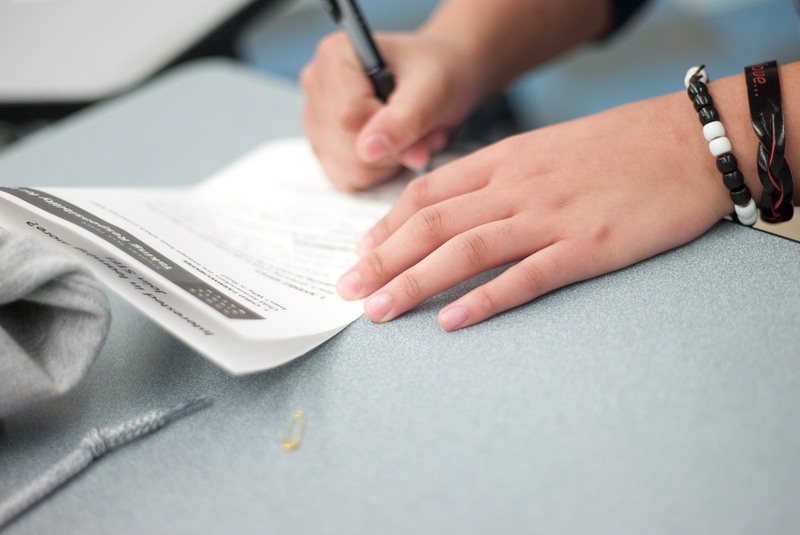 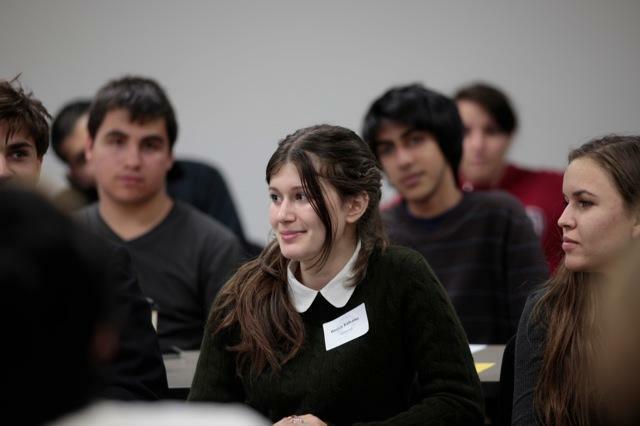 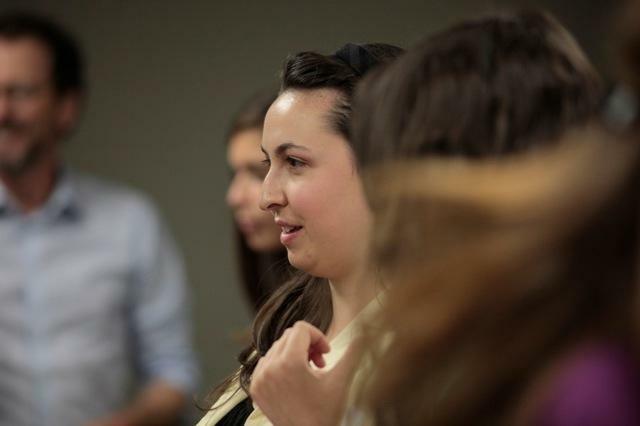 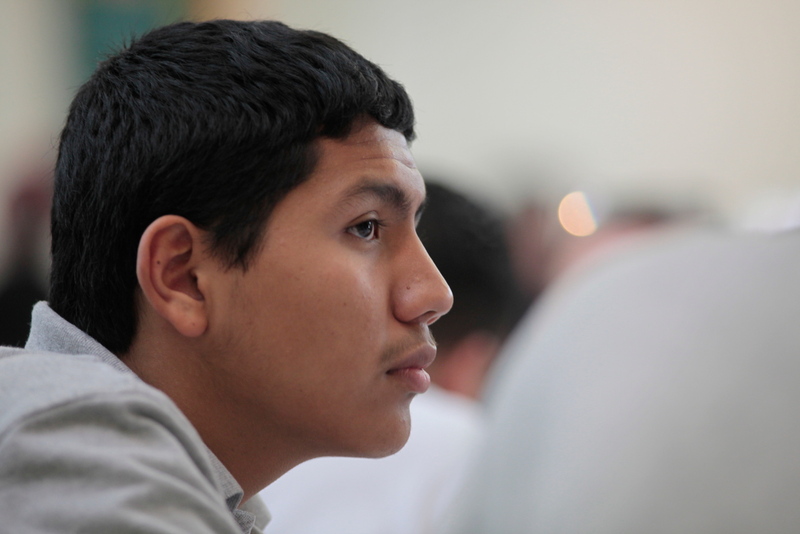 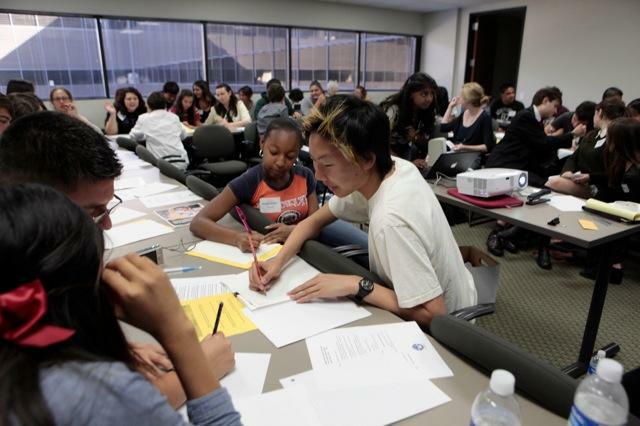 Looking ahead, STF will continue to build its presence in Southern California and beyond as we will be tackling the Right to Education in the fall of 2011. 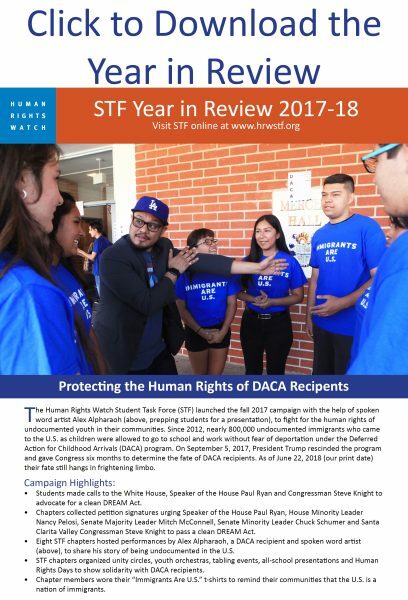 Thank you to all our students, teacher advisors, volunteers and community supporters who make STF possible. 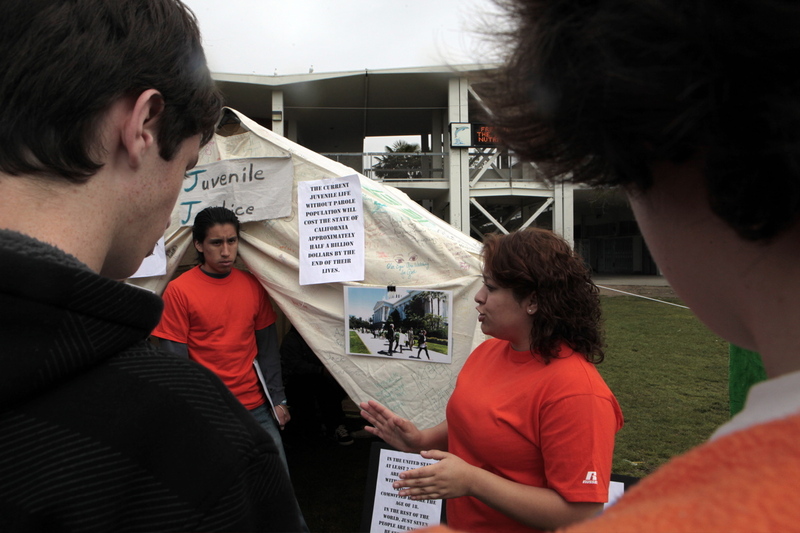 Please view our Year-in-Review video below. 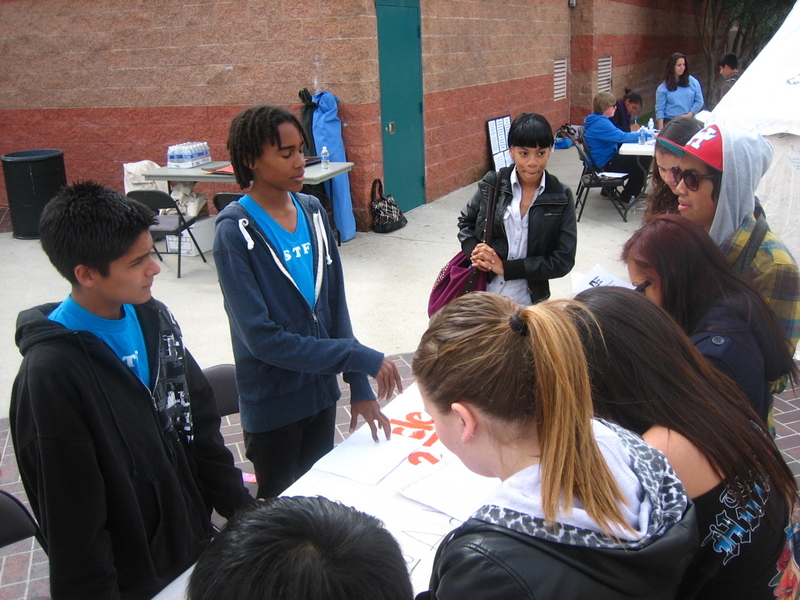 April 28, 2011: Unity Fest at Cal State Dominguez Hills featured a Children’s Rights Camp in collaboration with STF, YouTHink, and the Youth Justice Coalition, with assistance from Camp Darfur leaders Gabriel Stauring and KTJ Scott. 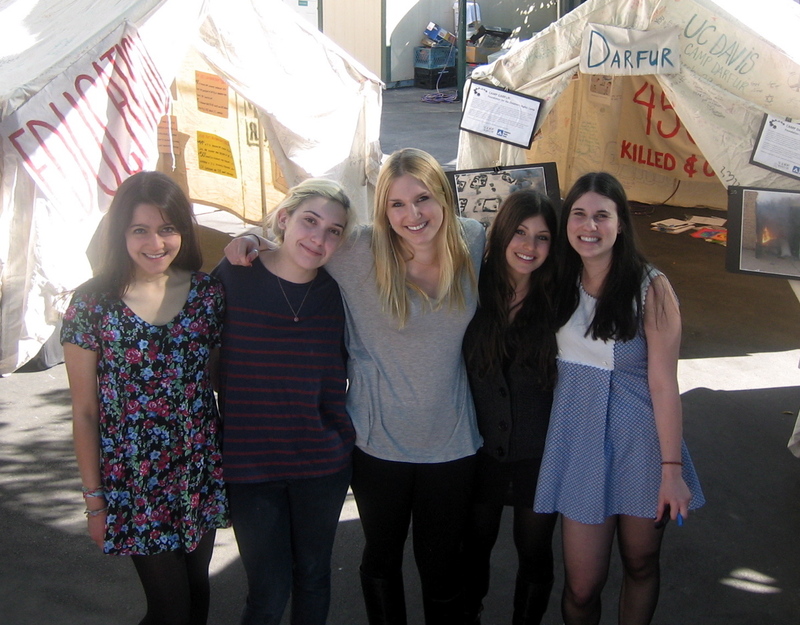 YouTHink directors Shifra Teitelbaum, Pia Schiavo-Campo and students kept busy educating visitors on the importance of access to education. 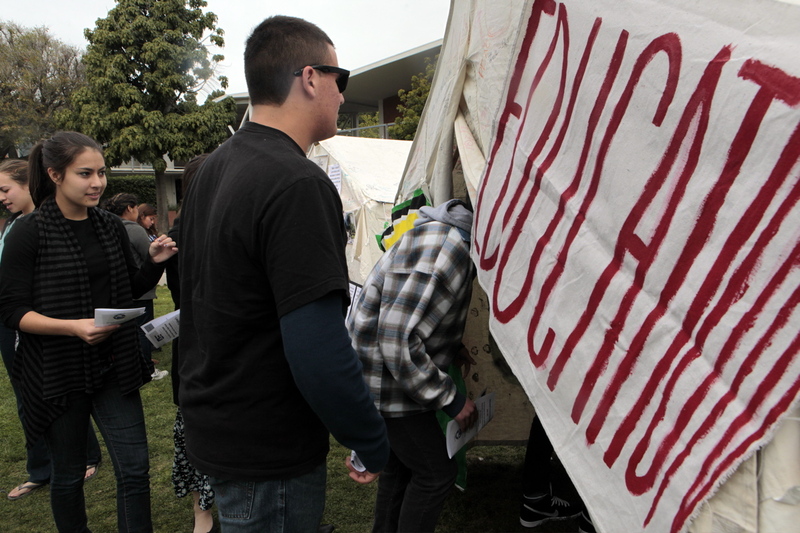 This is especially relevant in light of all the staggering state budget cuts this year. 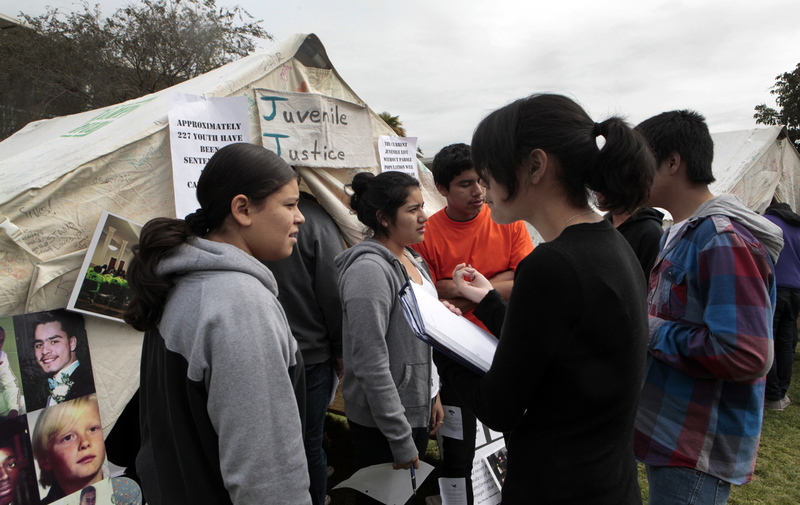 Kim McGill and the students from the Youth Justice Coalition were crucial to the success of the Juvenile Justice tent and gathered over 200 signatures for Senator Pavley and Senator Lieu in support of SB 9. 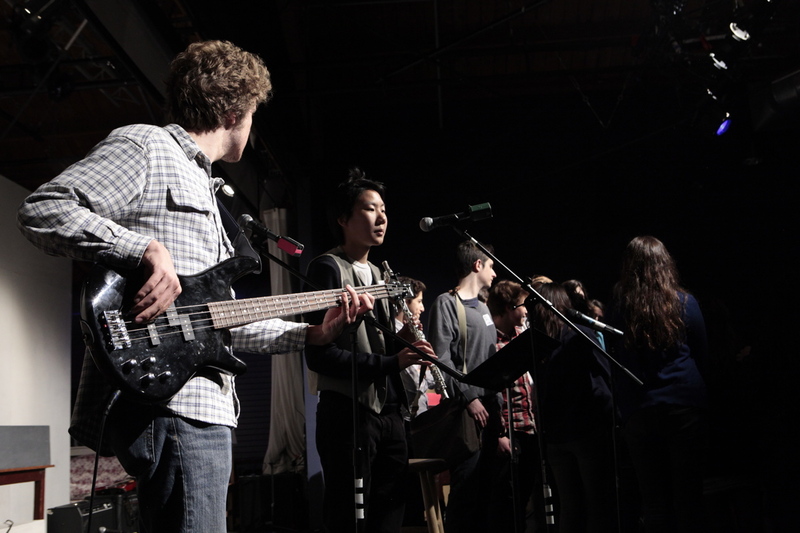 Unity Fest marked the last CRCamp of the year. 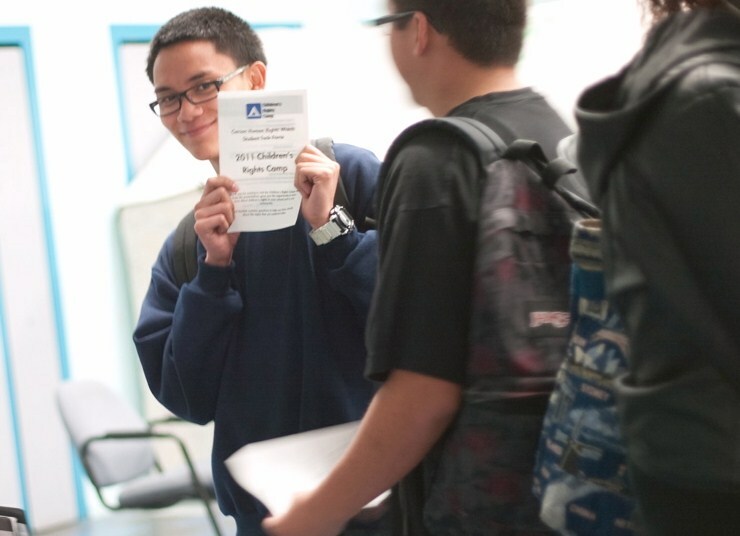 Congratulations to everyone who participated in any of the Camps! 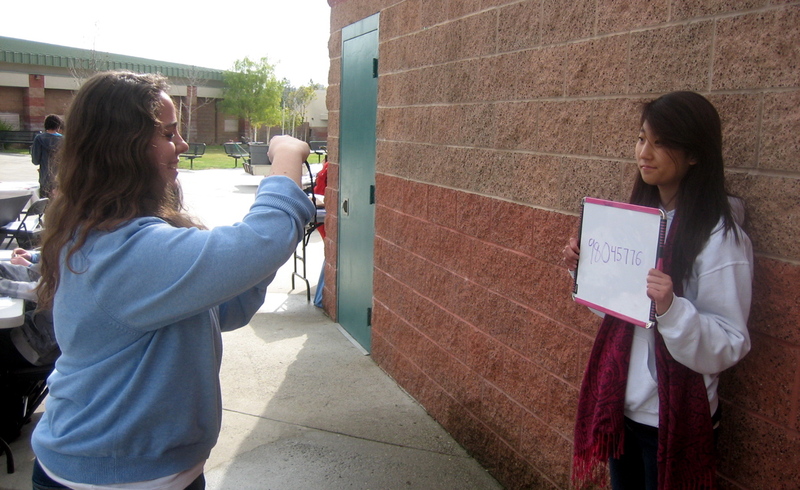 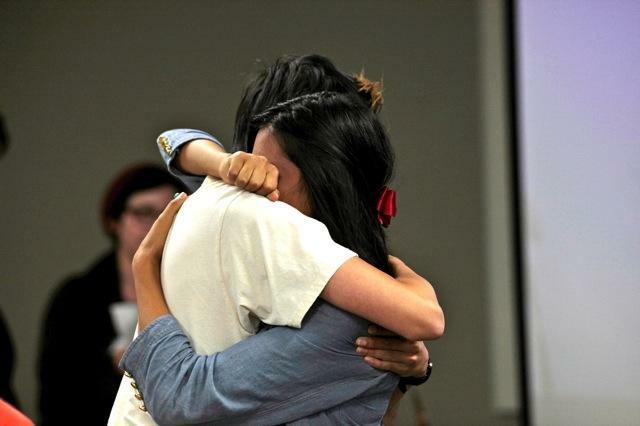 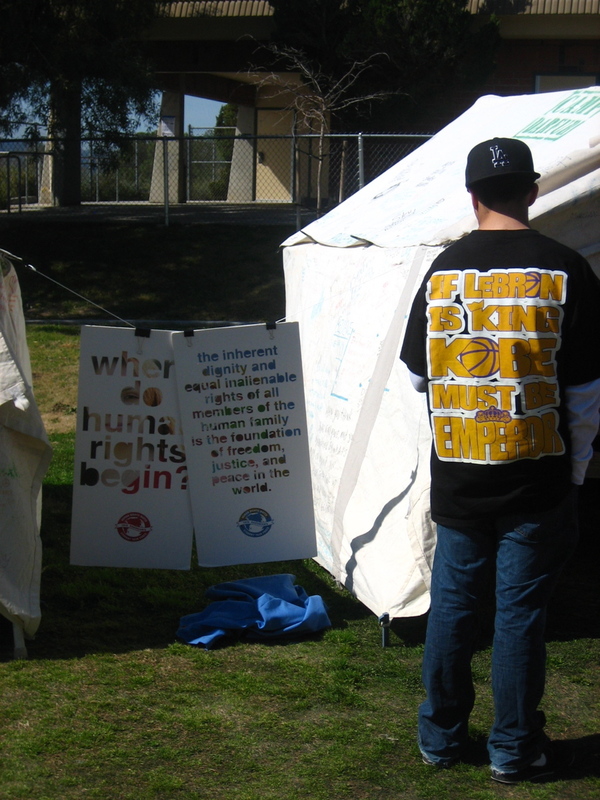 March 14-15, 2011: Carson High School hosted STF’s final school-specific Children’s Rights Camp of the year and it was a success! 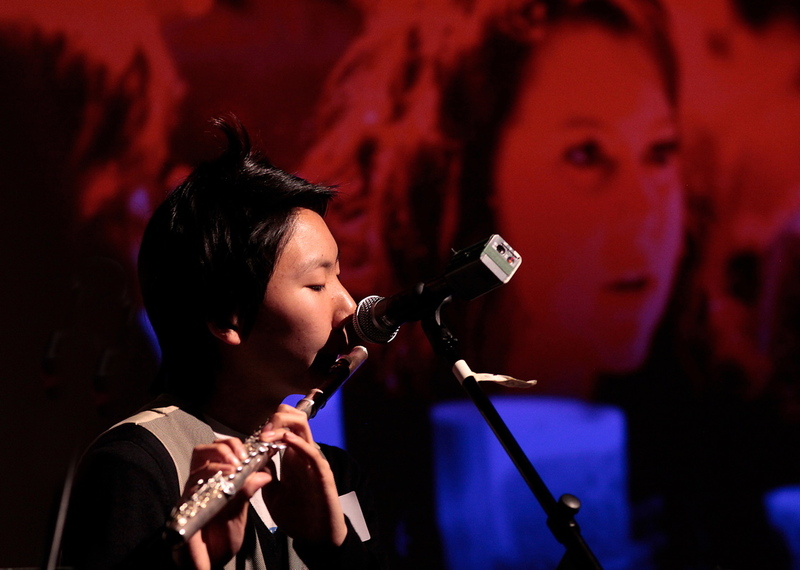 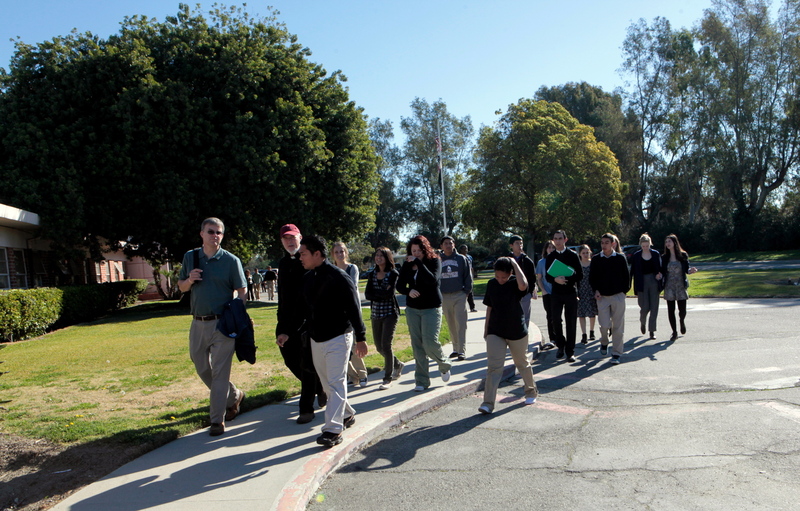 The Camp was a two-day event with an open house for parents on Monday, March 14 and class tours on Tuesday, March 15. 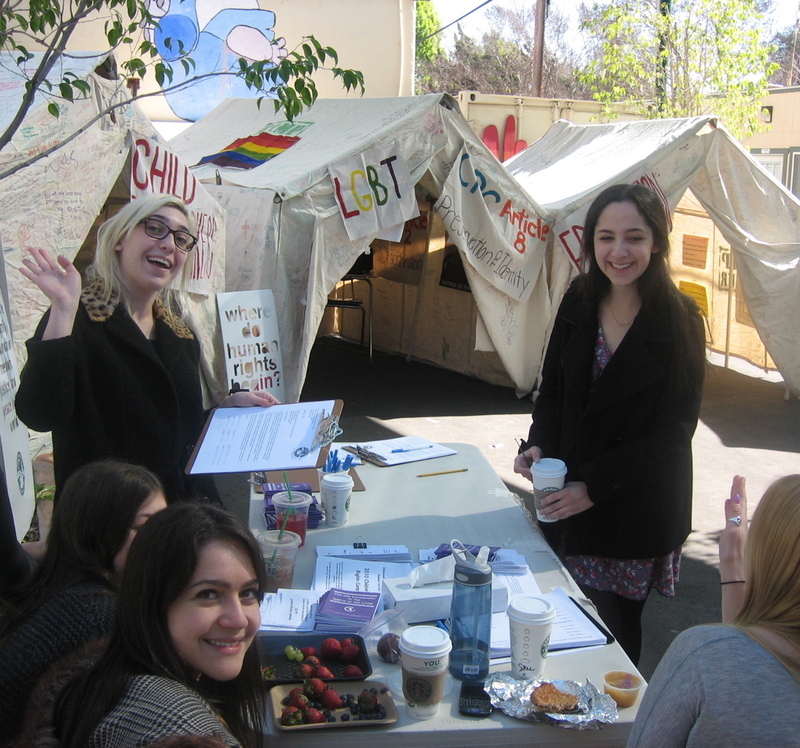 In addition to ongoing tent topics, the chapter sponsored a Health tent, that discussed childhood health threats in Los Angeles. 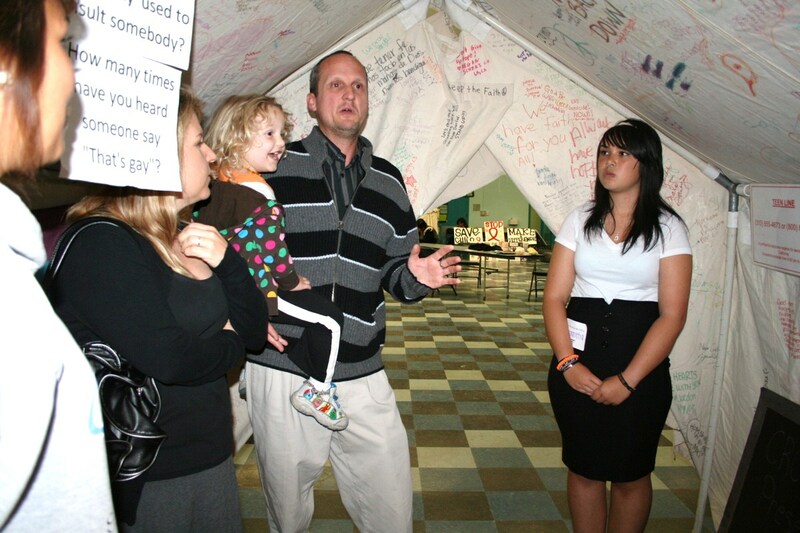 During the open house, Mayor Jim Dear of Carson made a surprise visit to tour the Camp and speak with students. 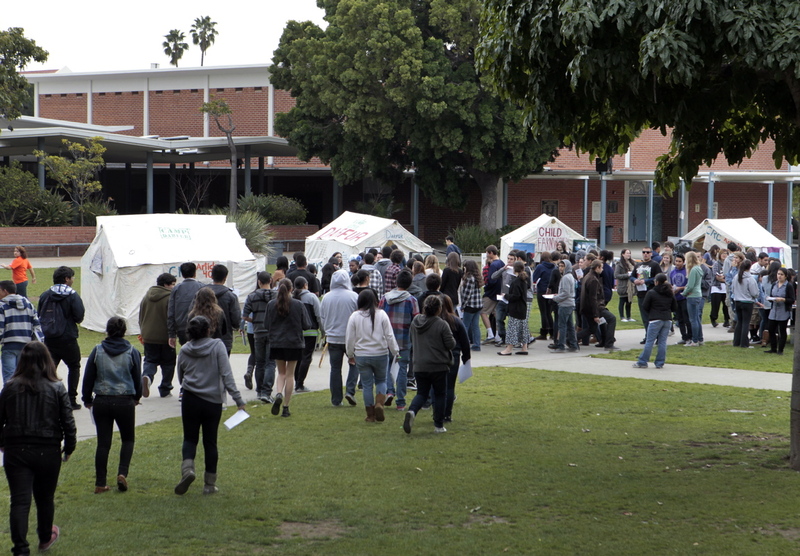 Over 500 students and guest toured the tents over the course of two days! 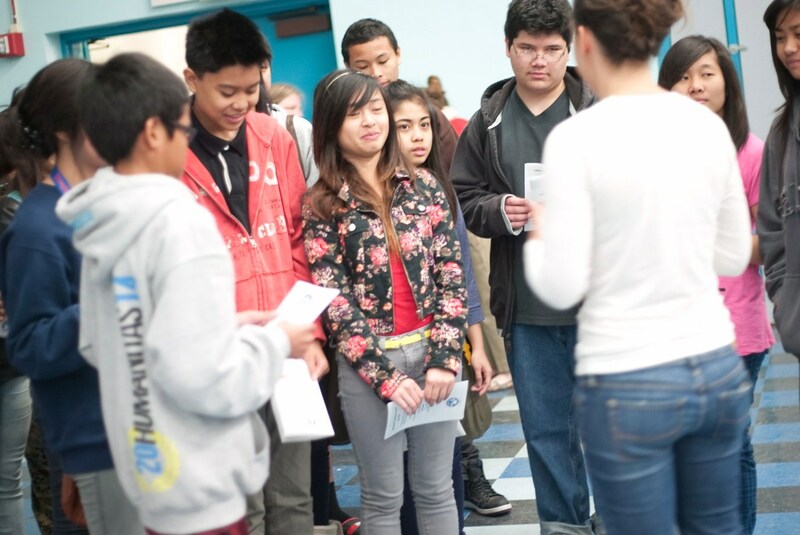 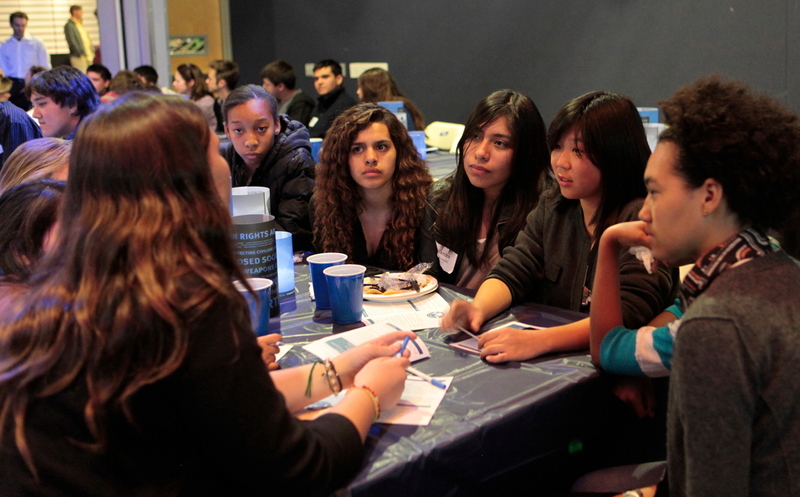 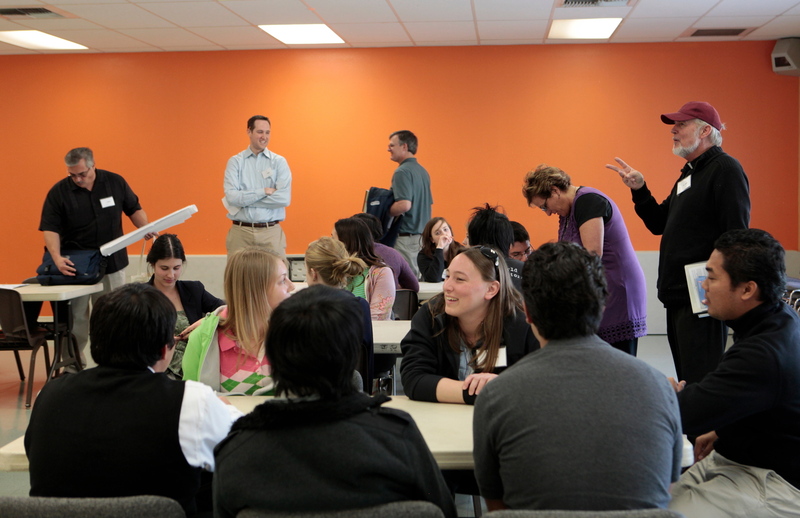 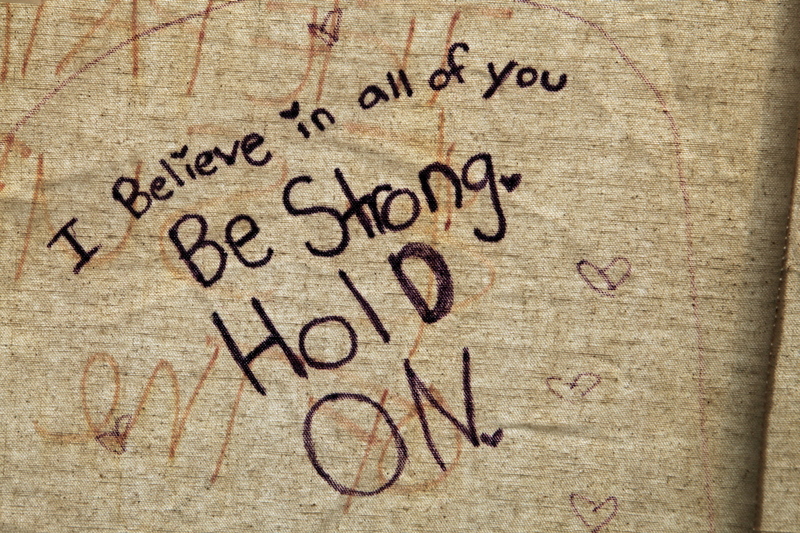 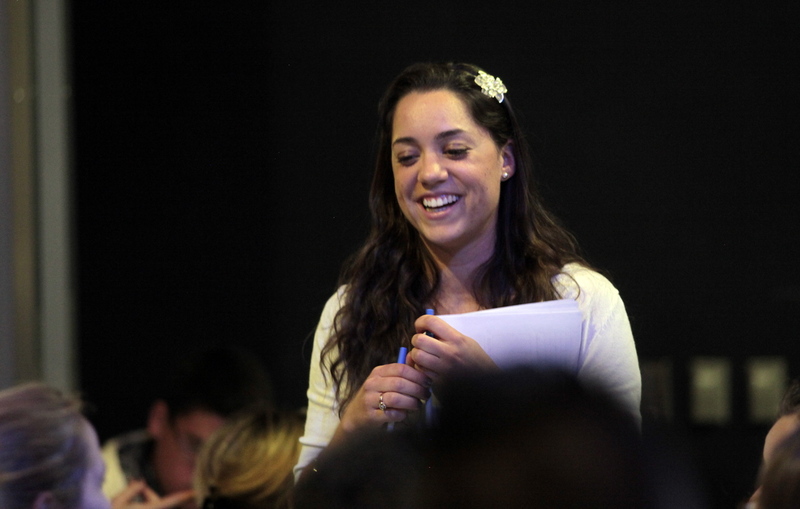 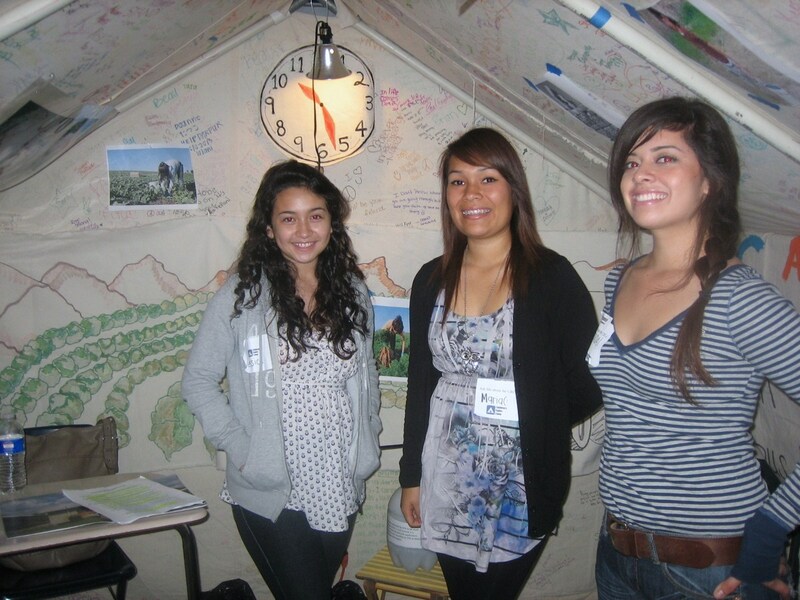 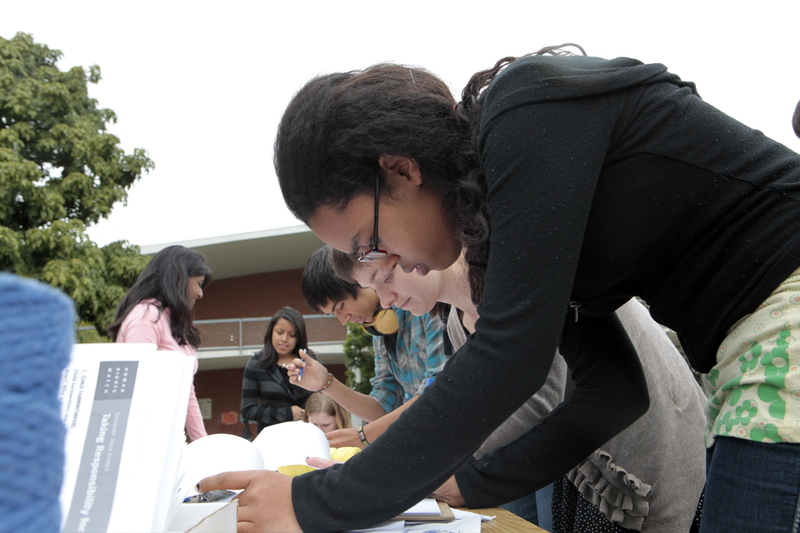 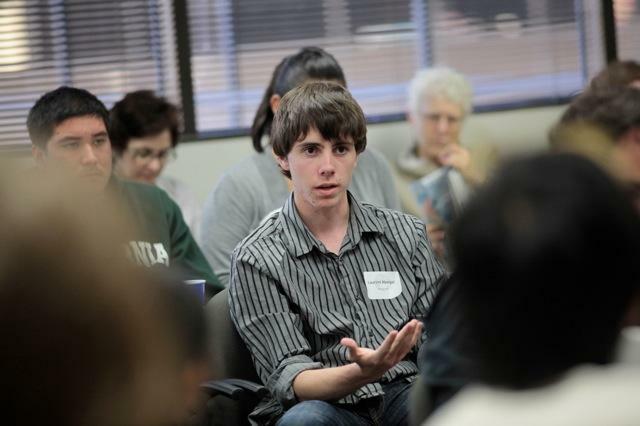 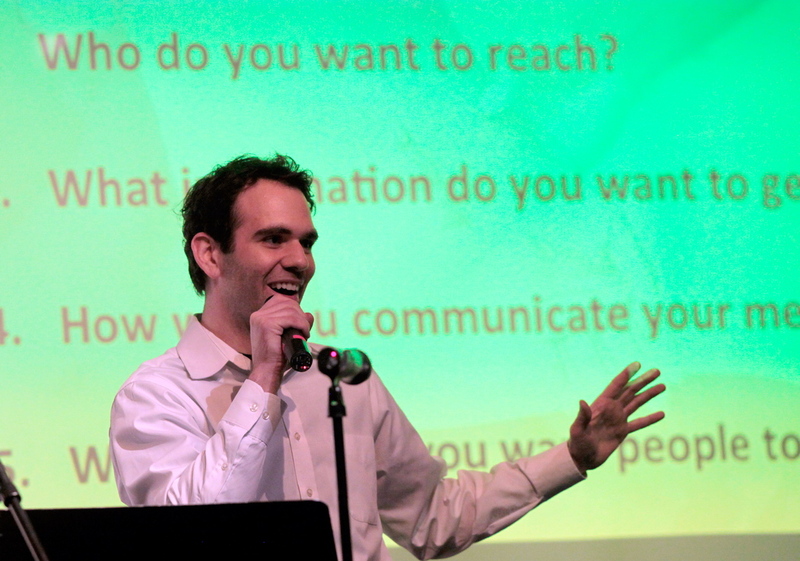 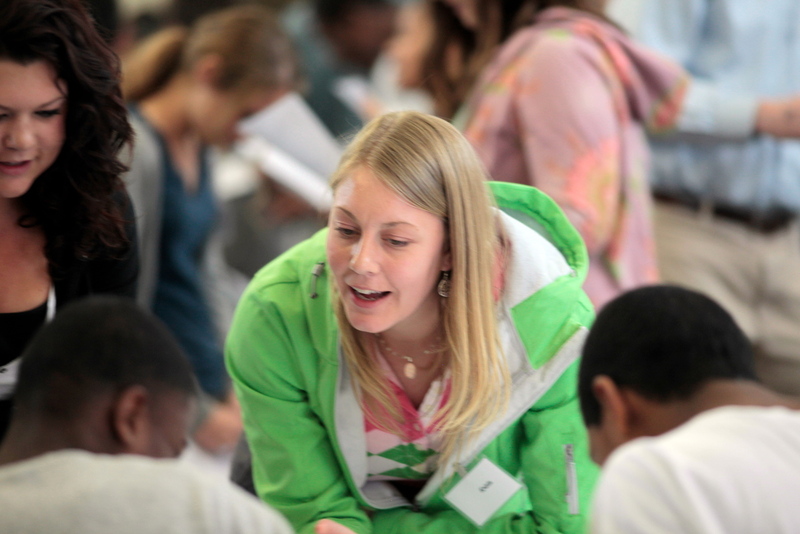 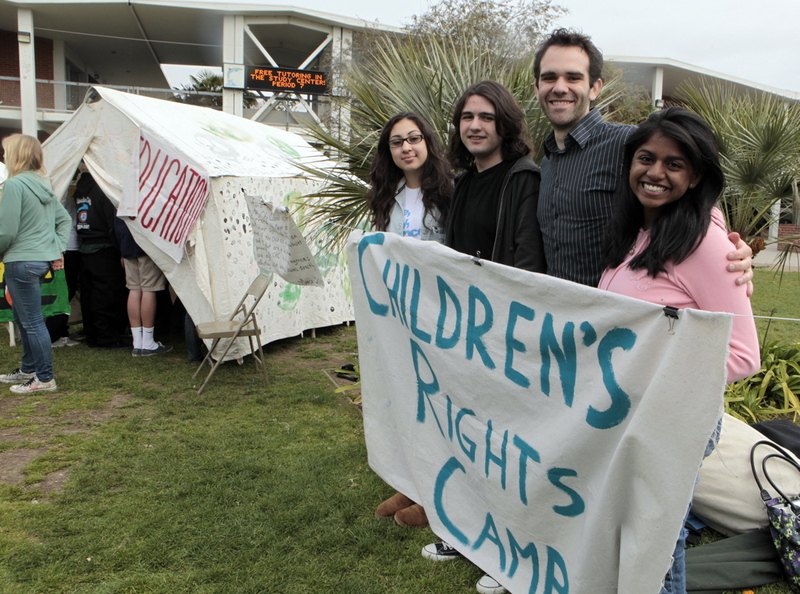 March 9, 2011: Sierra Canyon’s Children’s Rights Camp was open to students from grades 7-12. 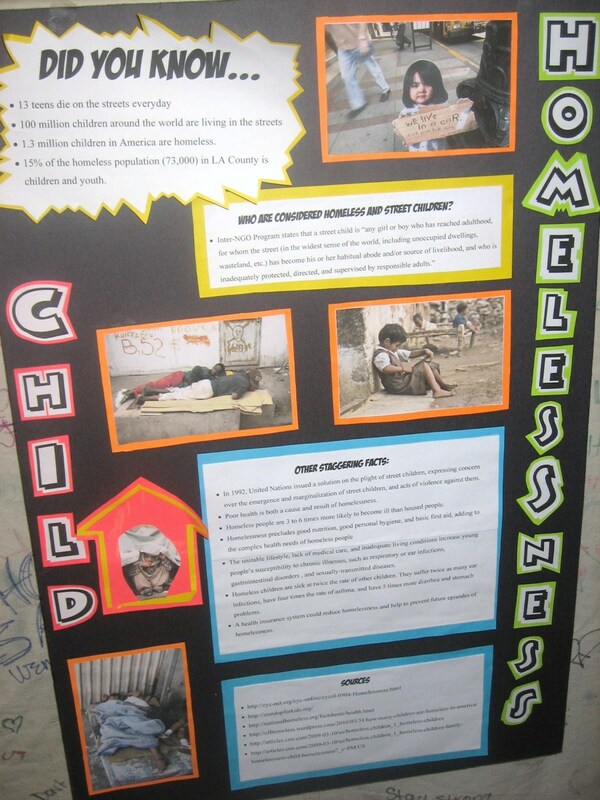 In addtion to the Camp, Sierra Canyon hosted daytime and evening assemblies with guest speaker, Betty Makoni, CNN Hero Nominee and founder of the Girl-Child Network, providing protection and support services to abused girls in Zimbabwe and South Africa. 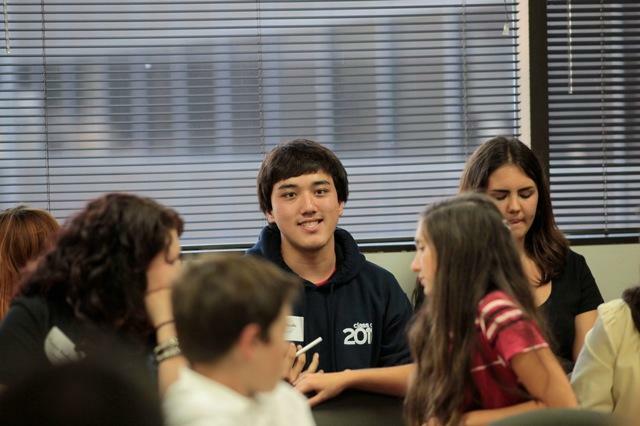 March 6, 2011: STF leaders from Palisades Charter High School and Valencia High School attended a strategy session for Senate Bill 9 (SB 9) held by Human Rights Watch’s LA Network. 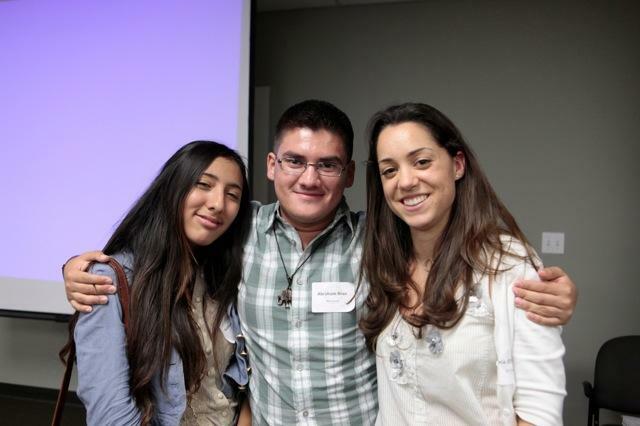 Palisades co-President, Julian Duarte, and Valencia co-Presidents Laurent and Audrey Abergel spent the day researching various organizations, important individuals, and groups who might support SB 9.Special guest and HRW California Advocate Elizabeth Calvin led the meeting with an inspirational speech about SB 9, fueling the drive to continue the intensive research. 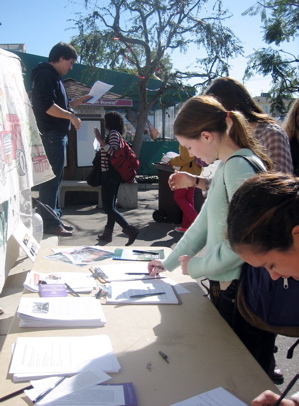 Though it was an early Sunday morning for these STF members it was an early start to creating change. 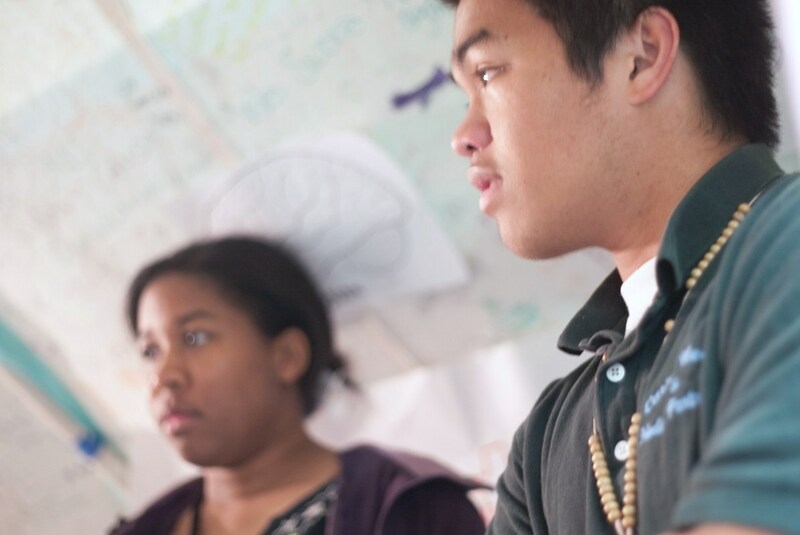 Download the STF Personal Advocacy Map to see how far your sphere of influence extends. 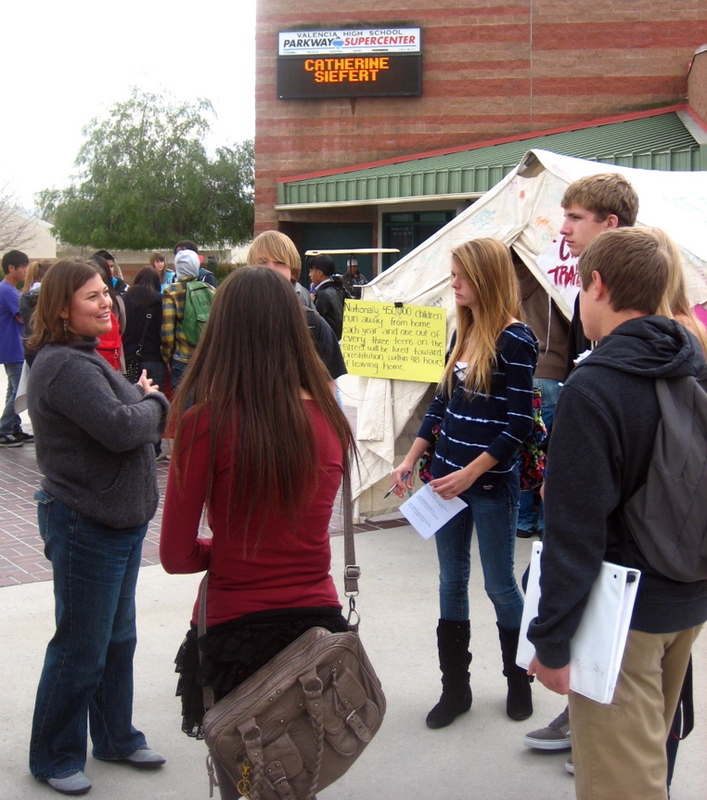 March 4, 2011: Canyon High School held its Children’s Rights Camp for over 500 students and faculty members who visited the throughout the day. 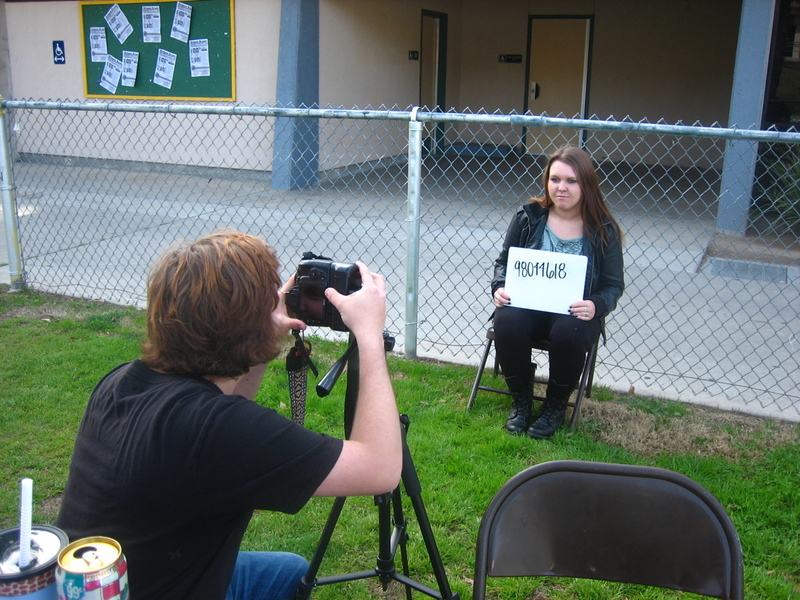 Canyonco-president Dakotah Rains took this opportunity to take photos of classmates that will be used in a future photo petition in support of Senate Bill 9. 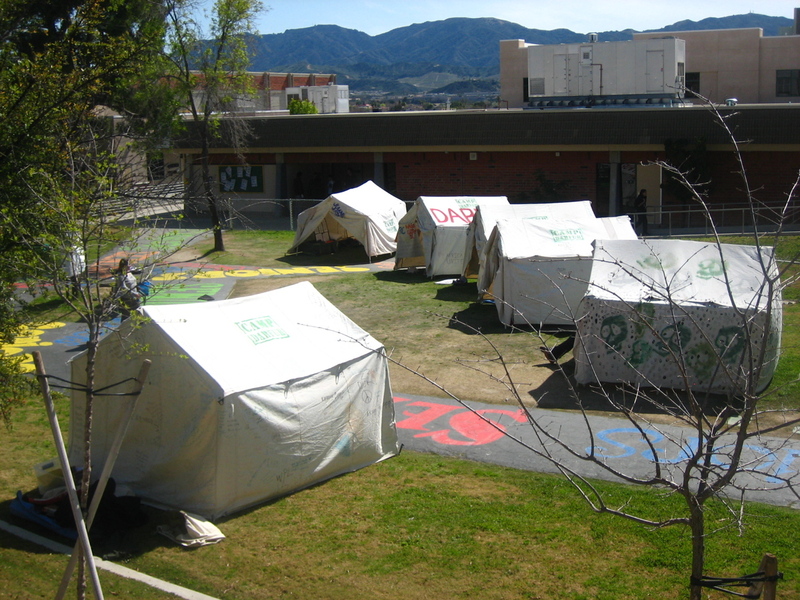 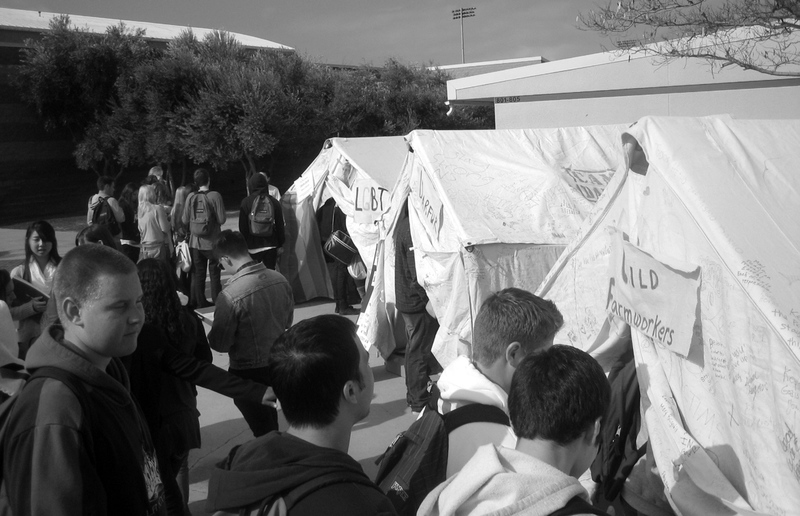 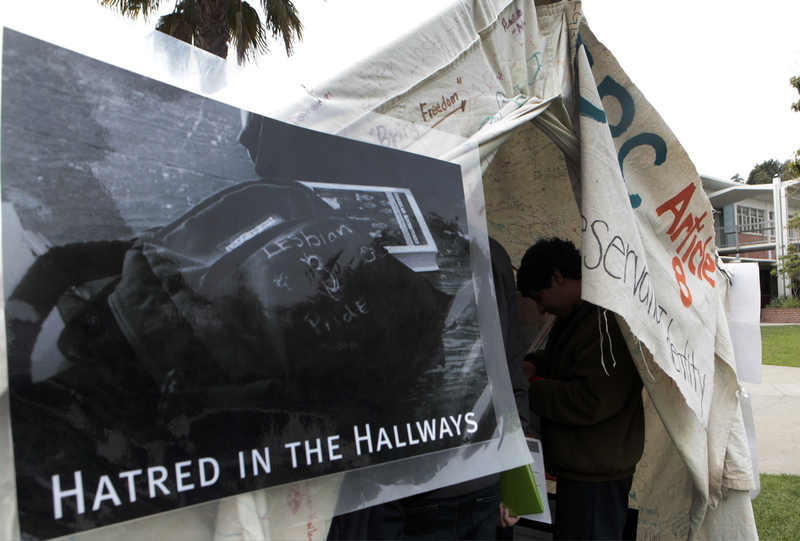 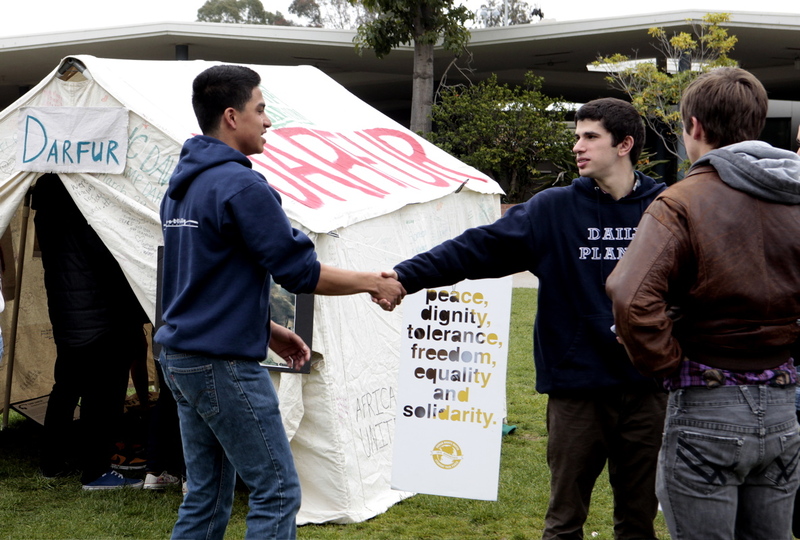 March 2, 2011: Last Wednesday morning, students at Palisades Charter High School (Pali) arrived on campus to find five large canvas tents set up over their regular lunch spot in the central quad. 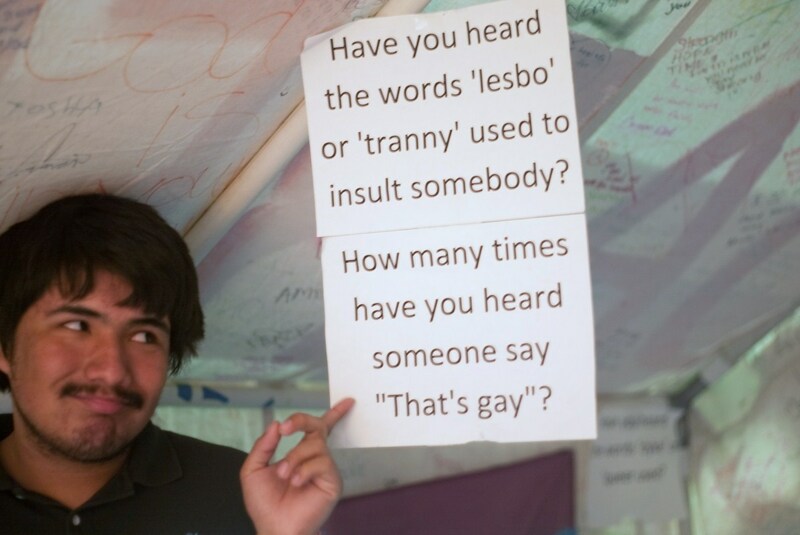 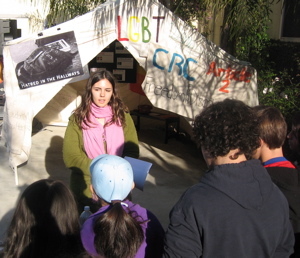 During the school day, about 450 students visited this Children’s Rights Camp, organized by the Pali Student Task Force (STF)…Pali’s STF partnered with student representatives of the Latino Student Union and the Gay/Straight Alliance to create and deliver short presentations in each tent. 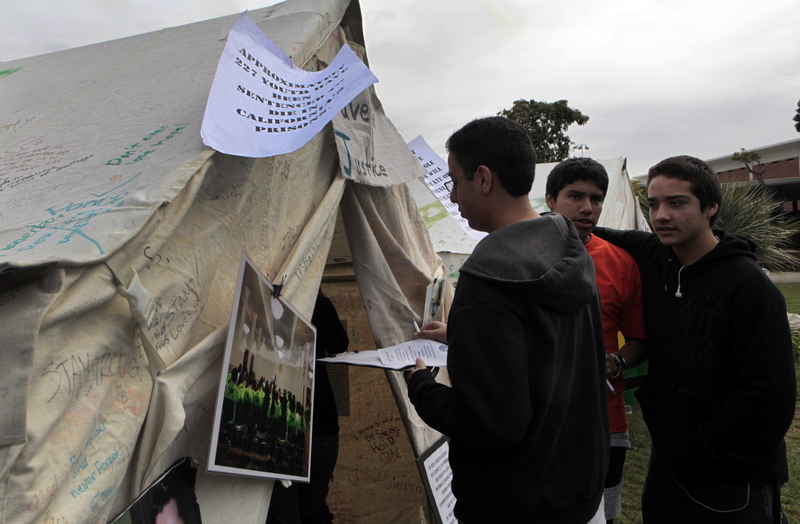 After educating their peers on these issues, STF offered ways for visitors to support the protection of children’s rights. 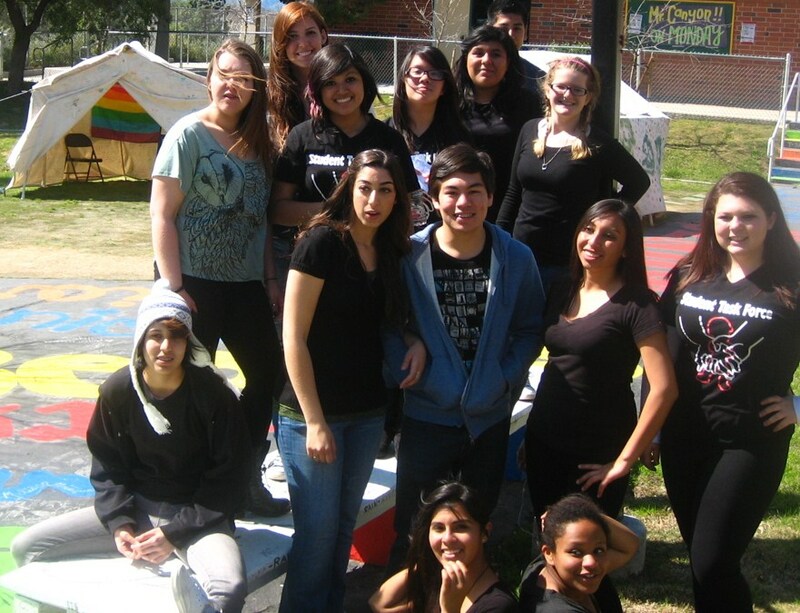 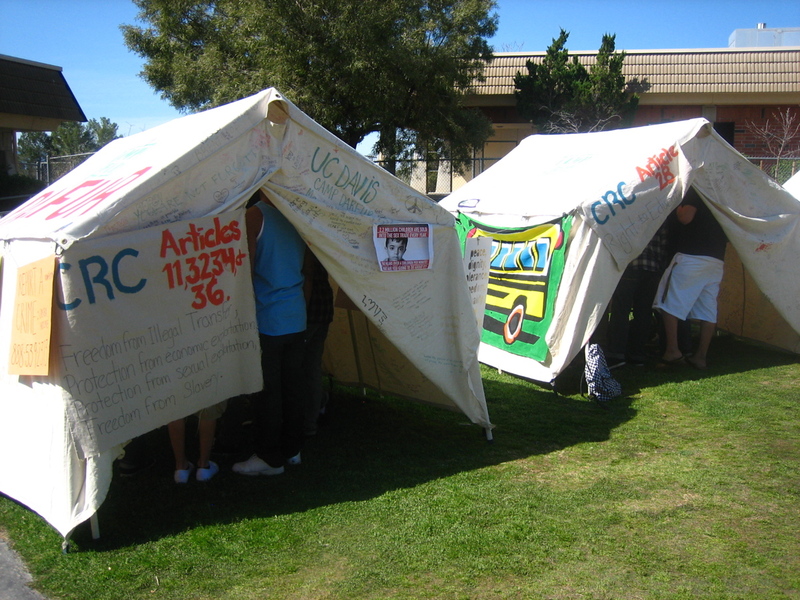 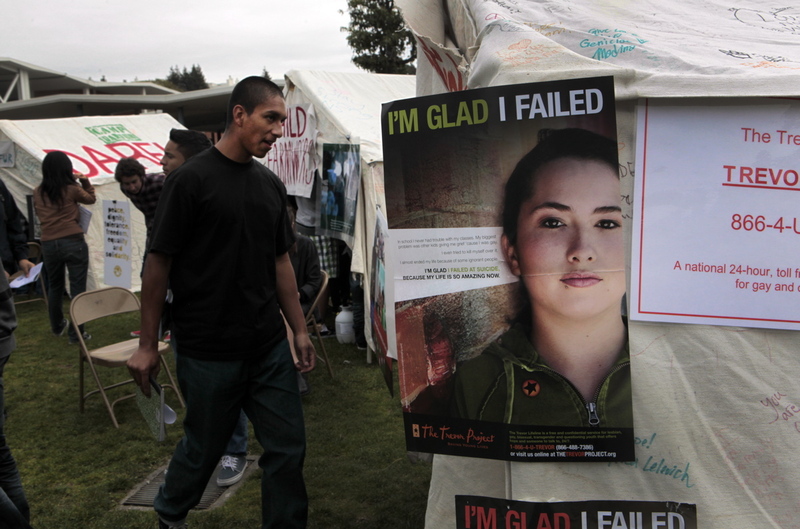 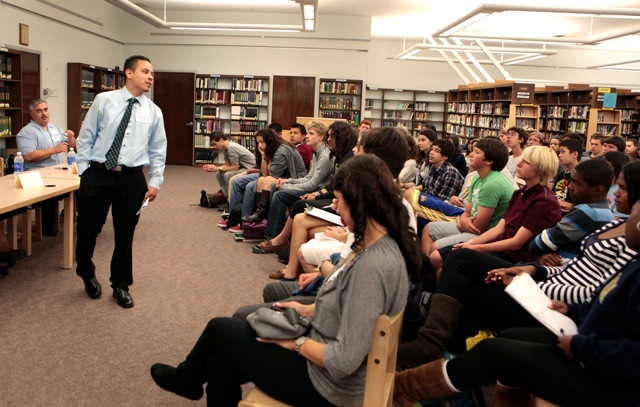 February 24, 2011: The Valencia High School STF Chapter hosted the Children’s Rights Camp. 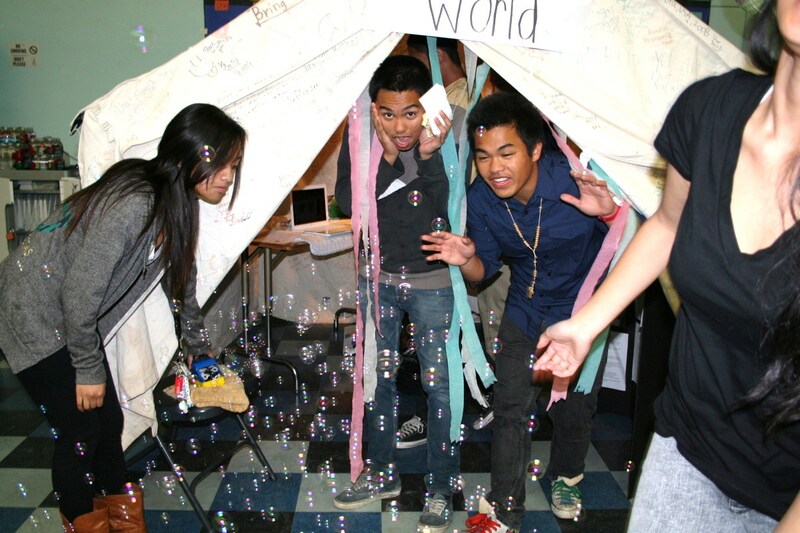 With the leadership of seniors and STF Presidents Audrey and Laurent Abergel and Nancy Medina, over 450 students attended the Camp from grades 9-12. 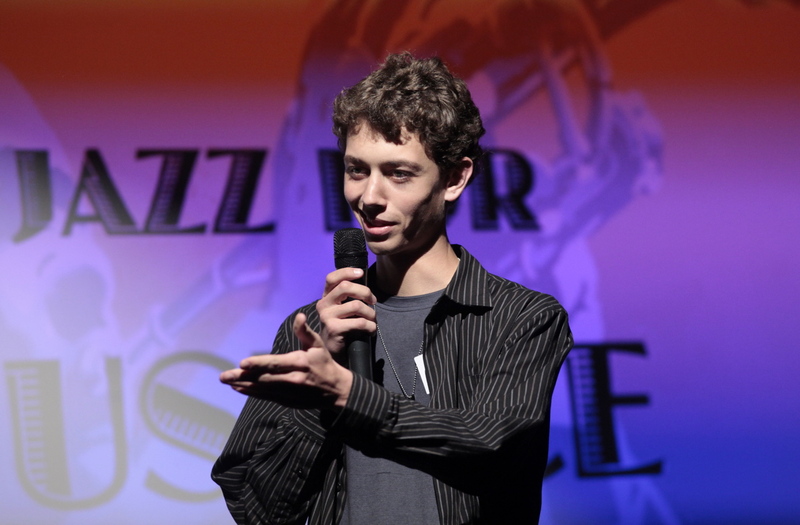 Human Rights Watch Student Task Force Jazz For Justice evening workshop. 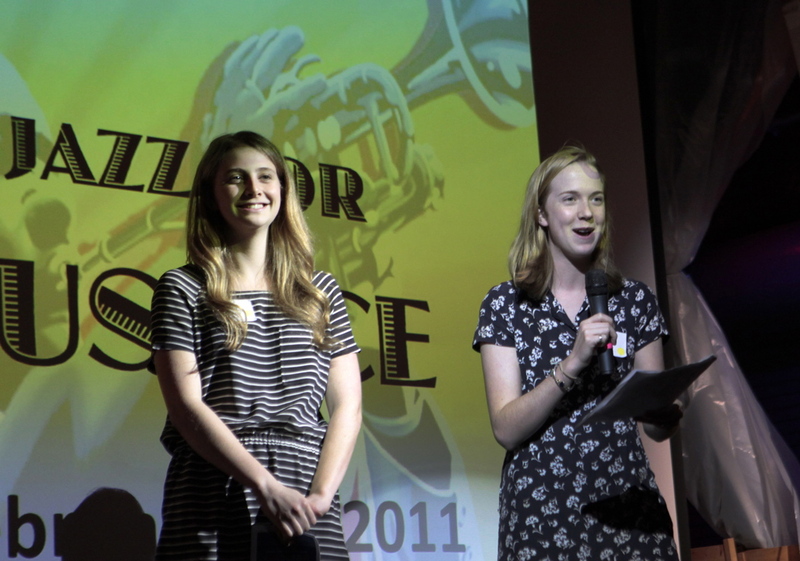 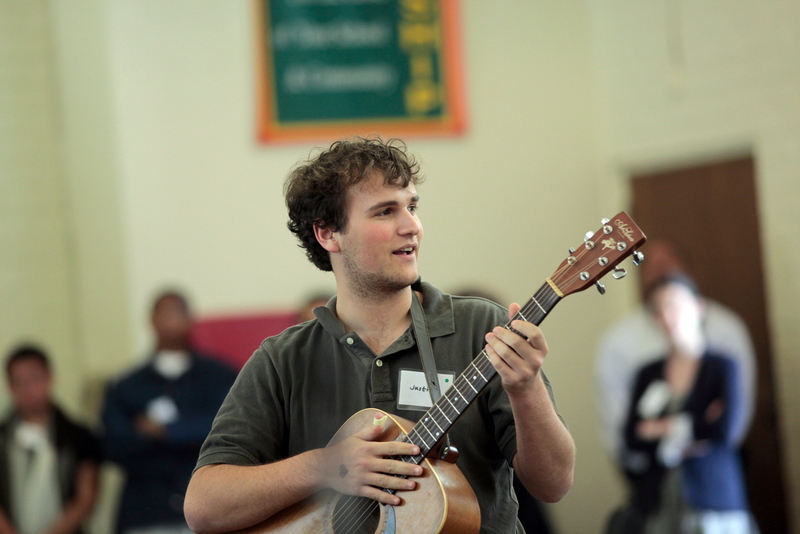 February 11, 2011: For the 2nd consecutive year, over 130 students from STF, local high schools, family members and professionals working directly with convicted youth gathered for Jazz for Justice at Wildwood School. 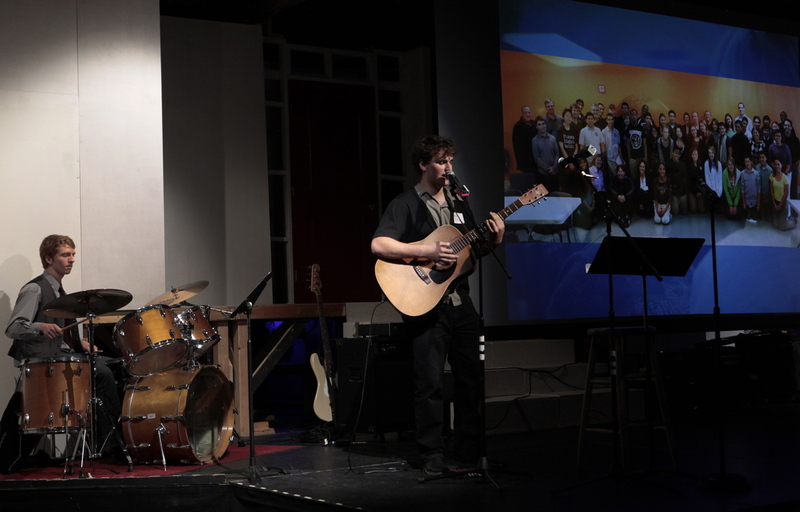 Building on STF’s visit with incarcerated youth on February 7 (below), the night featured music, food, guest speakers and advocacy planning as STF continues its campaign for fair sentencing for youth. 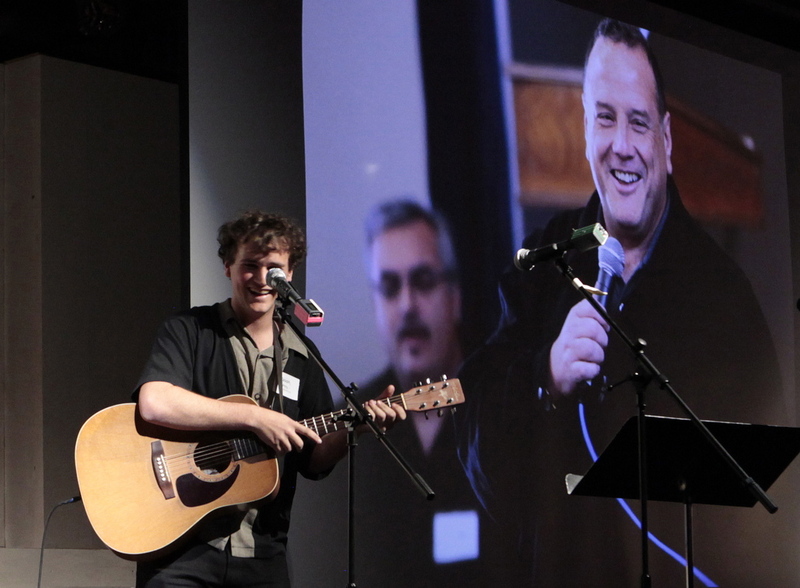 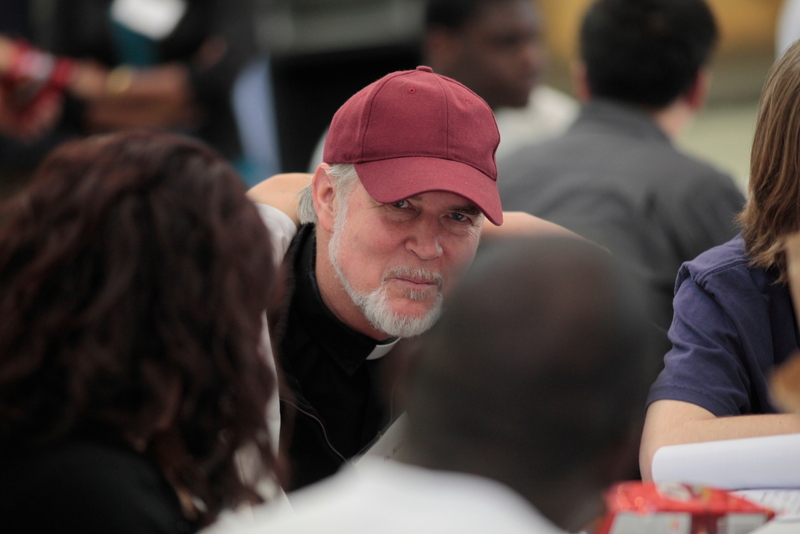 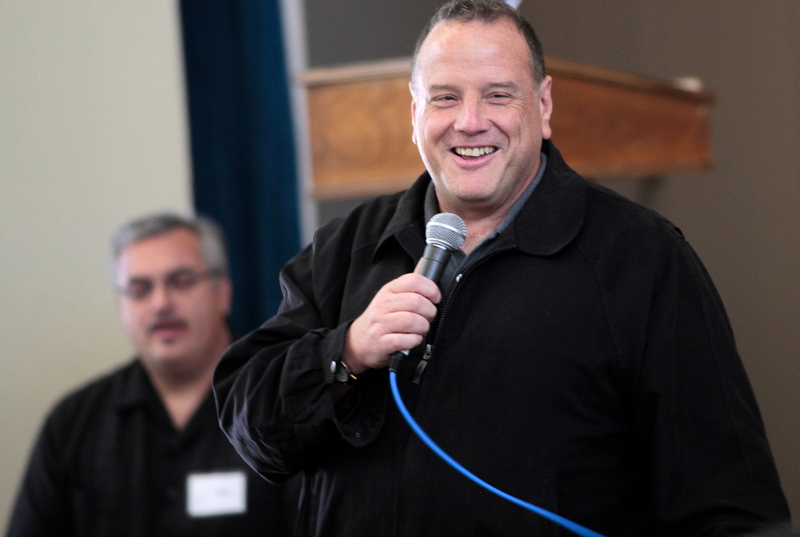 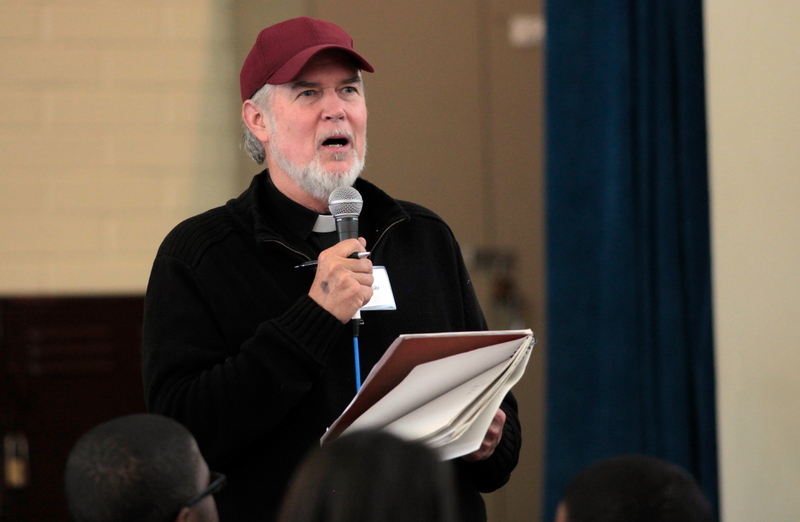 Guest speakers included Javier Stauring, Director of Detention Ministry for the Archdiocese of Los Angeles; and Brian Warth, the youngest life-without-parole prisoner to reverse his sentence in California. 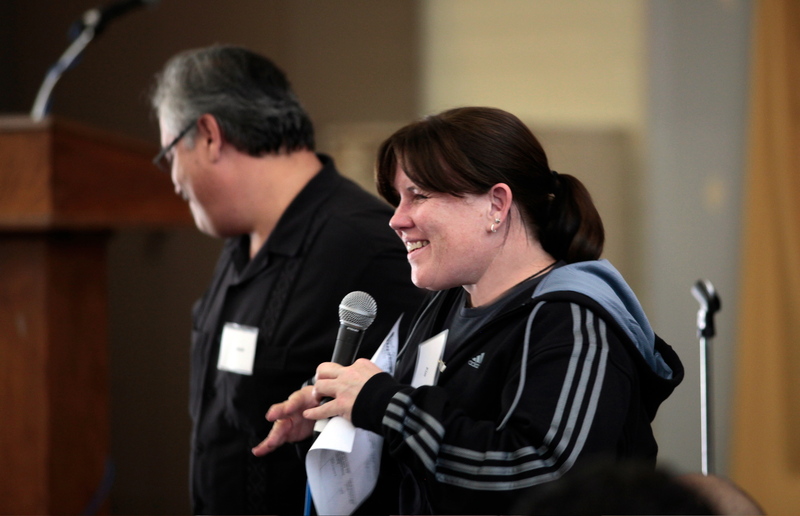 Jazz for Justice is the second major STF event in a series leading up to Juvenile Justice Week of Faith and Healing, March 7 to 11, to raise awareness and support for youth serving extreme sentences in California. 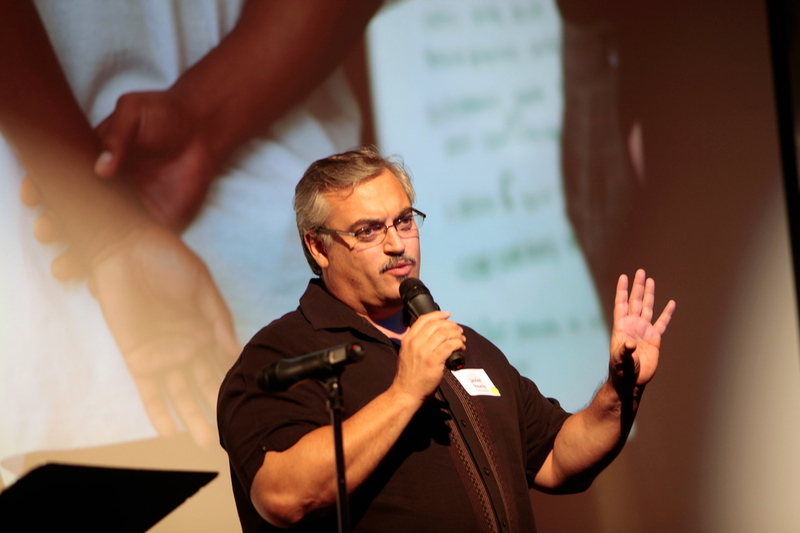 a poem featured at Jazz for Justice by R.M. 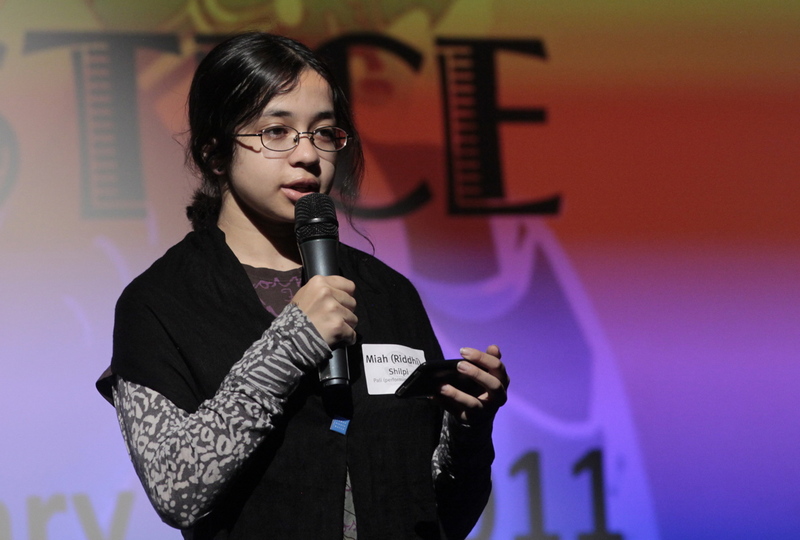 Shilpi. 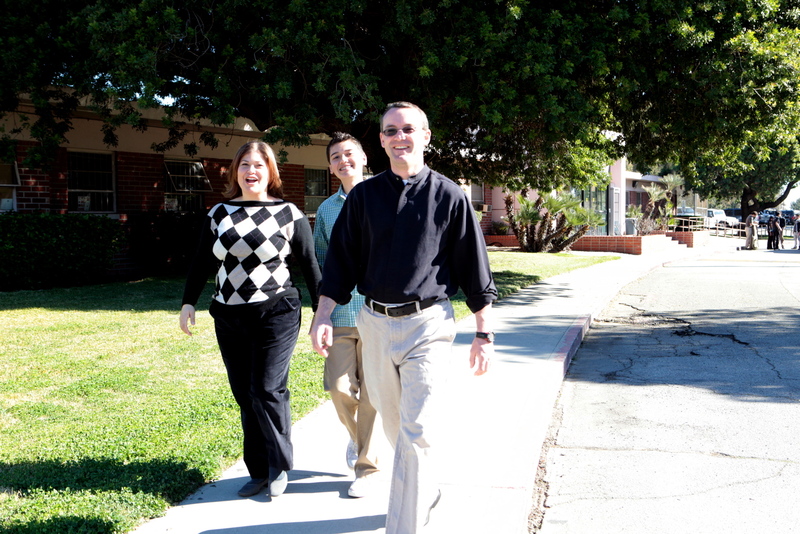 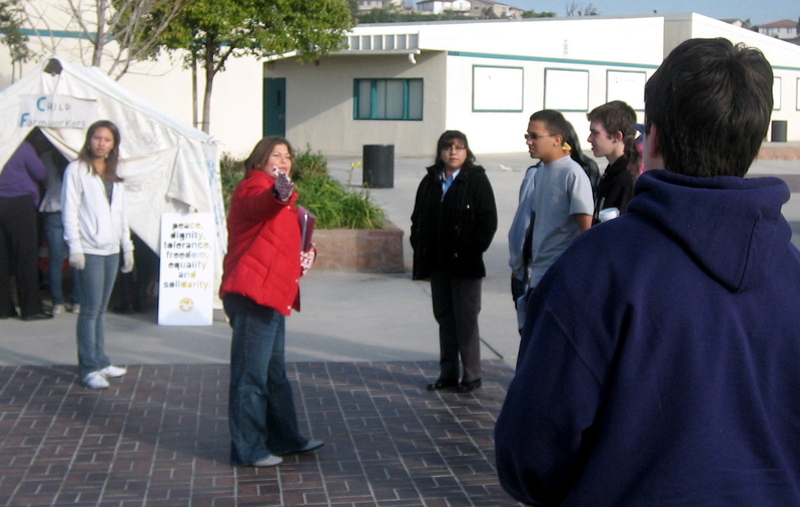 February 7, 2011: Representatives from ten STF chapters visited youth at the Southern Youth Correctional Reception Center and Clinic in Norwalk, CA. 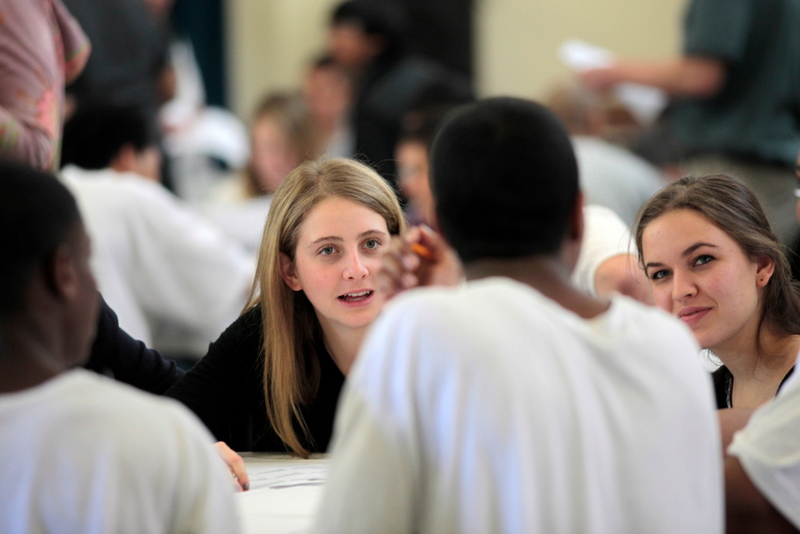 This state facility houses youth convicted of felonies, including those serving juvenile life-without-parole sentences. 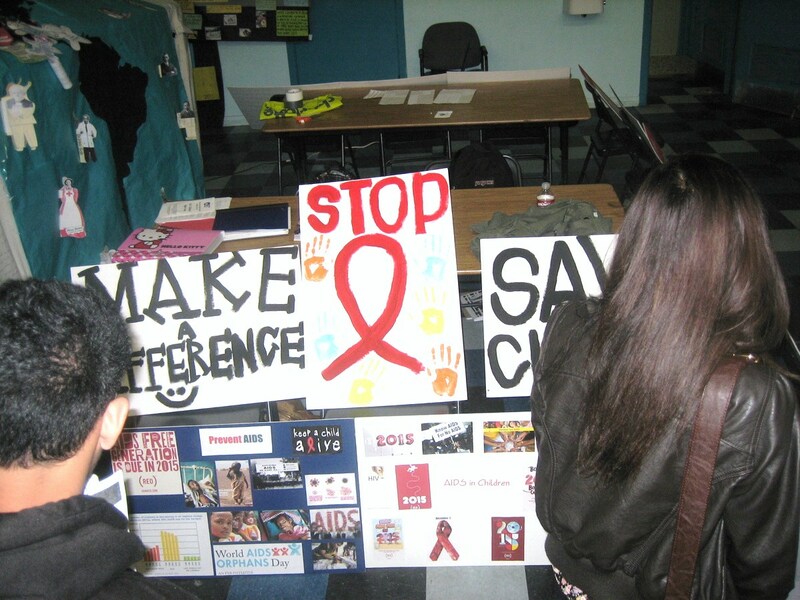 Our meeting was the first of its kind between “inside” and “outside” youth addressing the causes and impact of juvenile crime for the victim, offender and the community. 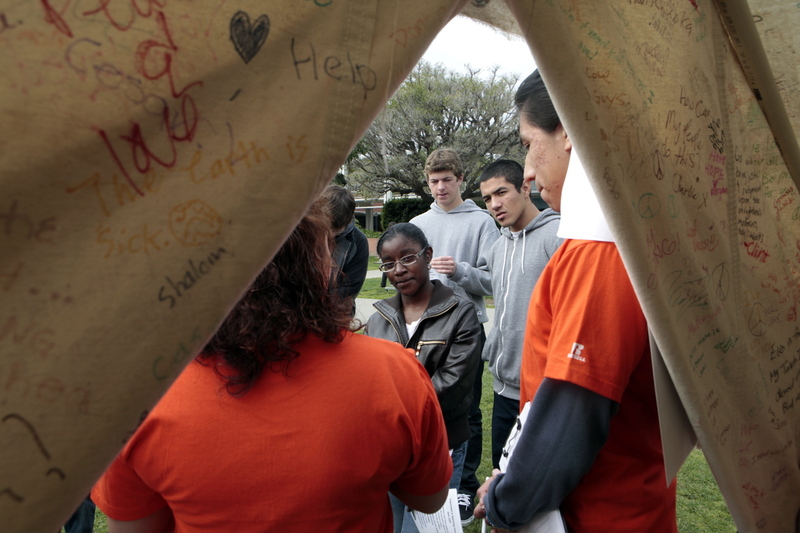 Together, youth inside and out will organize events during the Week of Faith and Healing, March 7 to 11, to raise awareness of extreme sentencing for youth, while advocating for increased support and rehabilitation programs for detained youth. 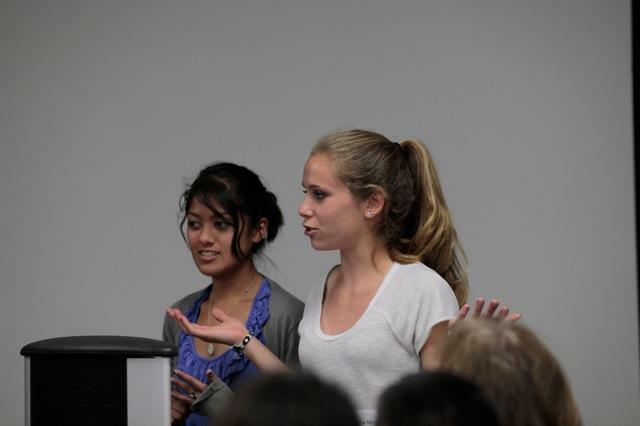 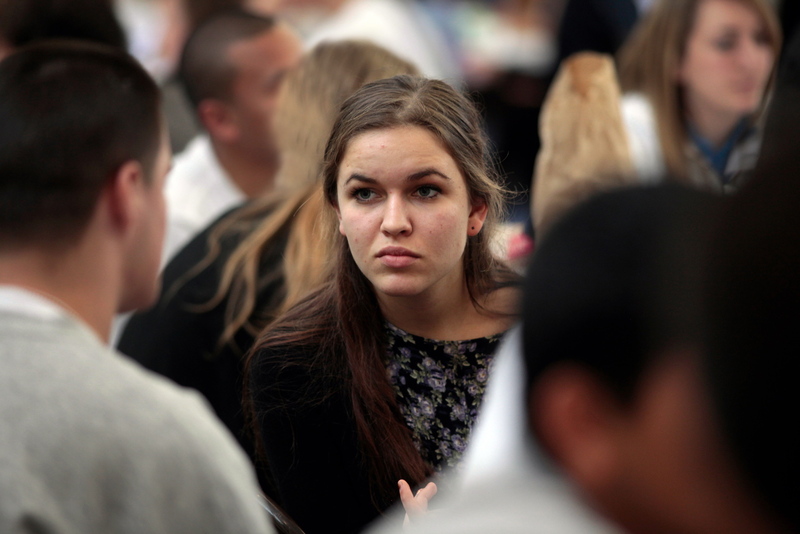 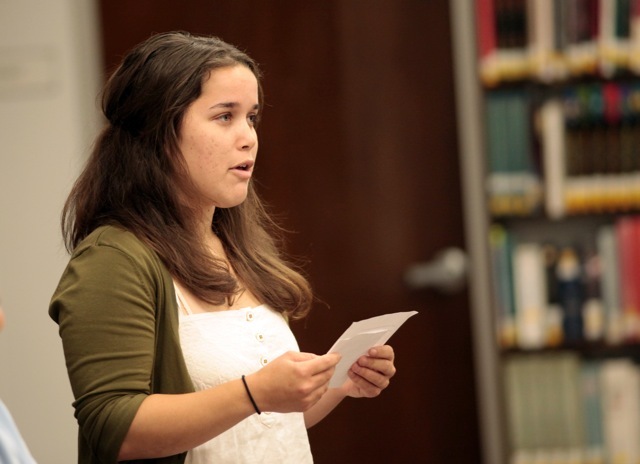 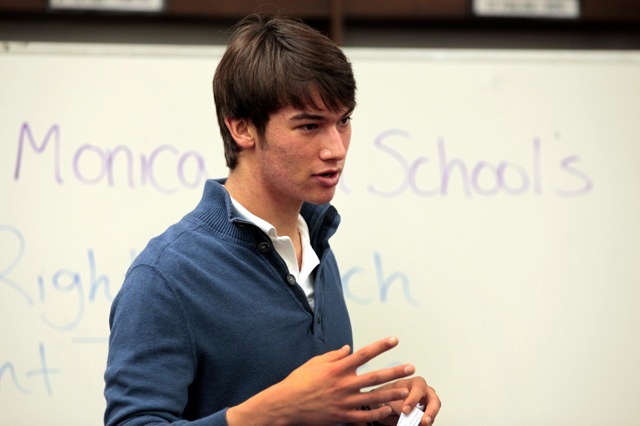 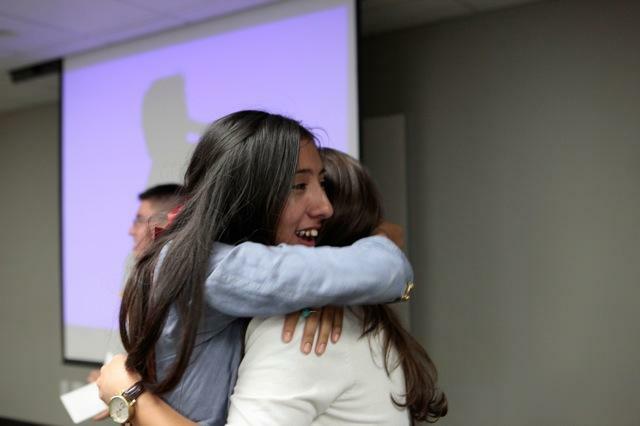 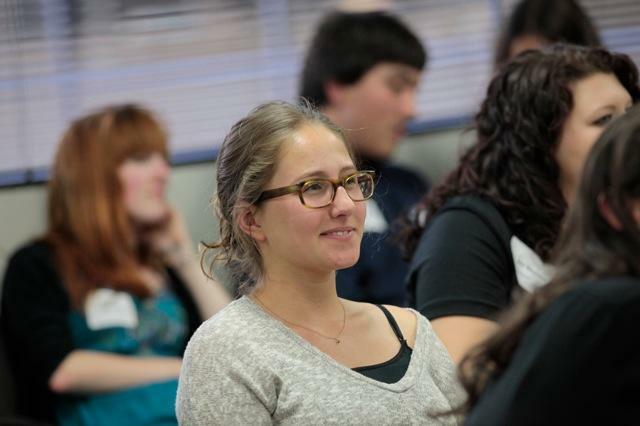 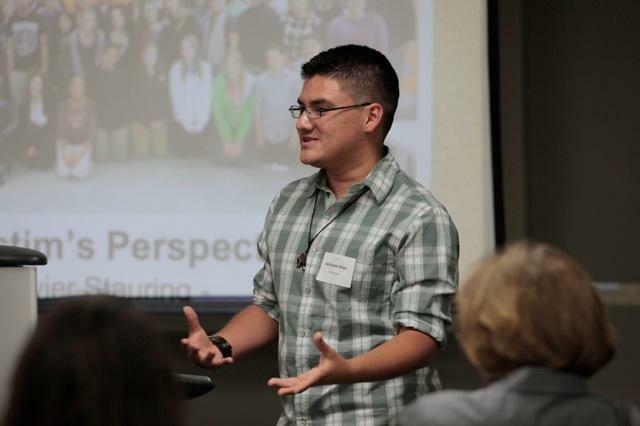 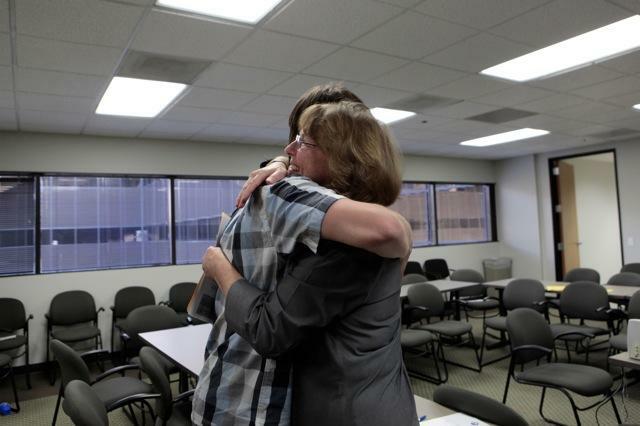 Read a full Op-Ed on our visit in the Santa Clarita Valley Signal, written by two STF students. 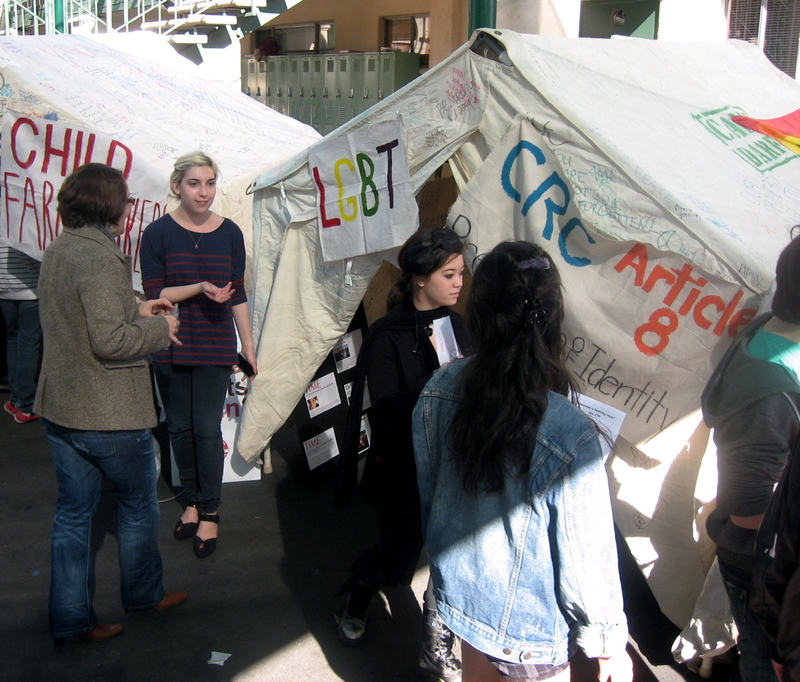 February 2, 2011: Oakwood STF launched their spring semester by hosting the Children’s Rights Camp (CRCamp). 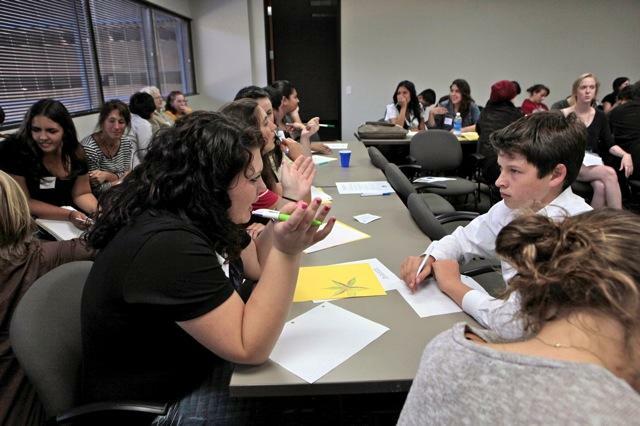 Open to all students, grades 7-12, the CRCamp continued to build awareness of children’s rights in the Los Angeles area and abroad. 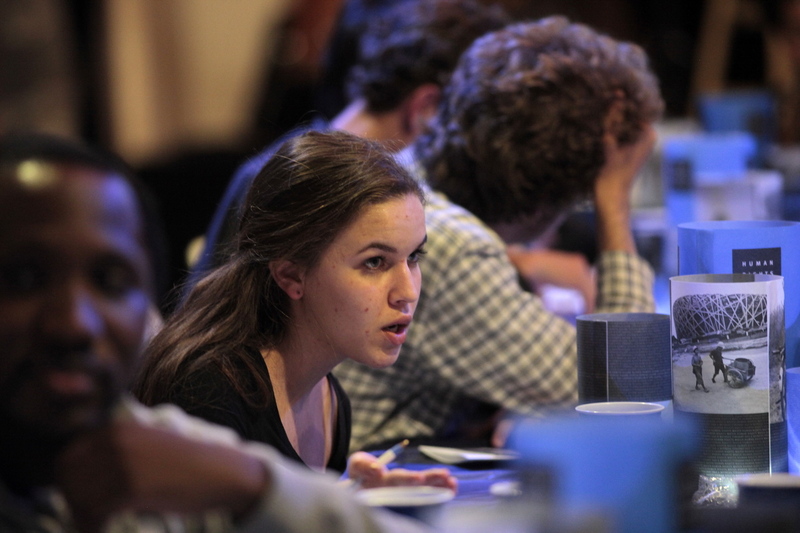 Additionally, STF leaders shared live updates and reports on the condition of children’s rights in South Sudan, following the country’s recent referendum. 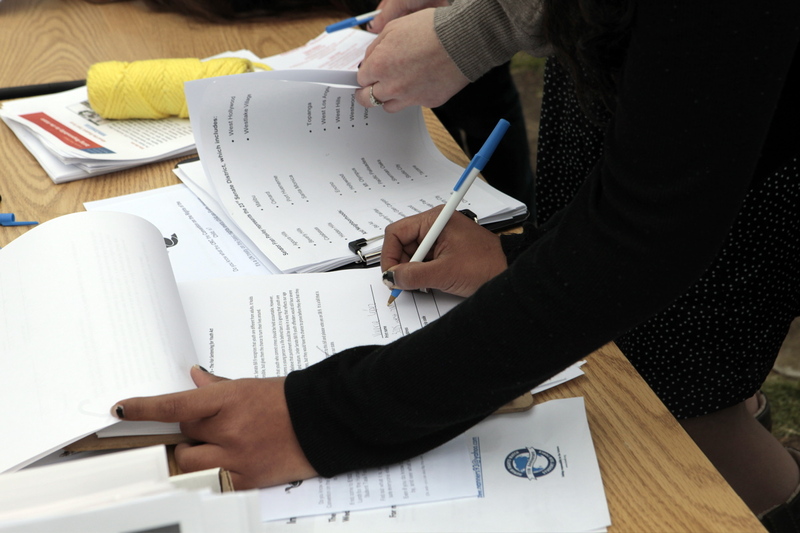 Students signed letters to United Nations Secretary-General Ban Ki Moon, urging the UN to provide extra support and protection of human rights in Sudan. 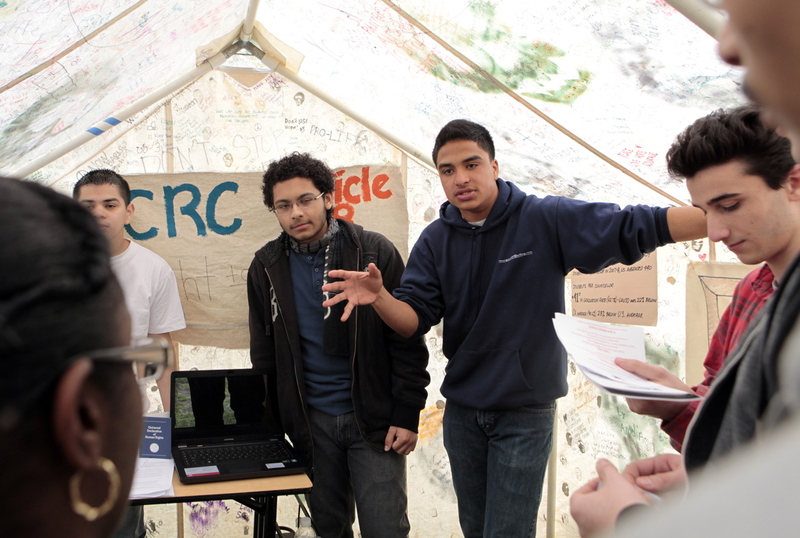 Crossroads students increase support for child farmworker rights in the U.S.
January 20, 2011: Crossroads STF successfully hosted their second tent of the Children’s Rights Camp series. 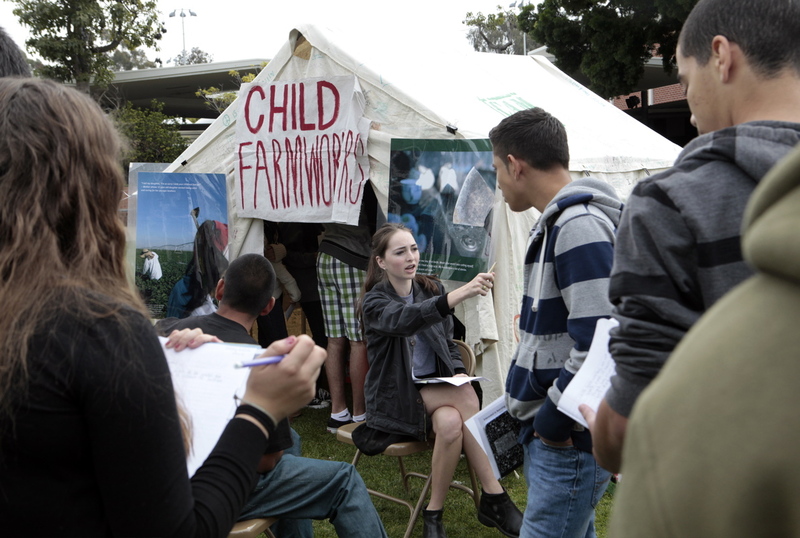 This month’s topic was child farmworkers, and students from grades four through twelve visited the tent throughout the day. 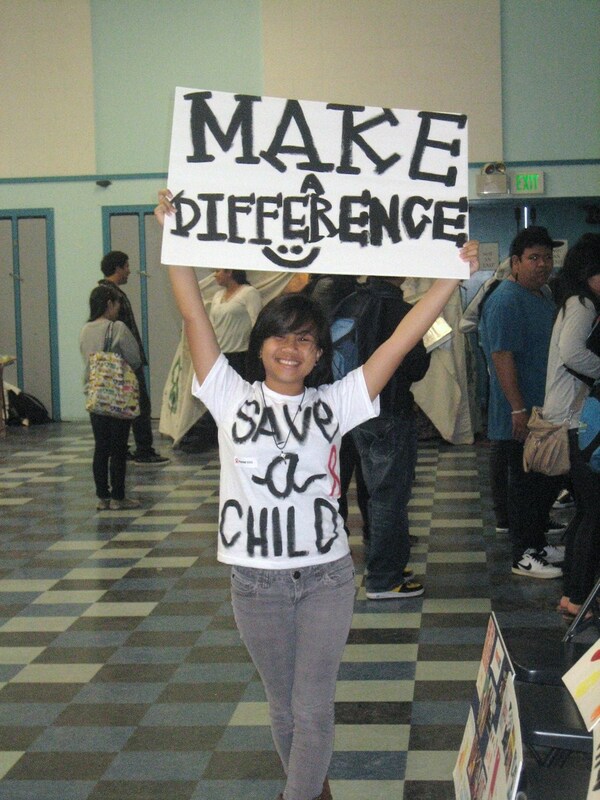 The elementary school had just begun a unit on child labor, allowing the STF event to enhance their curriculum! 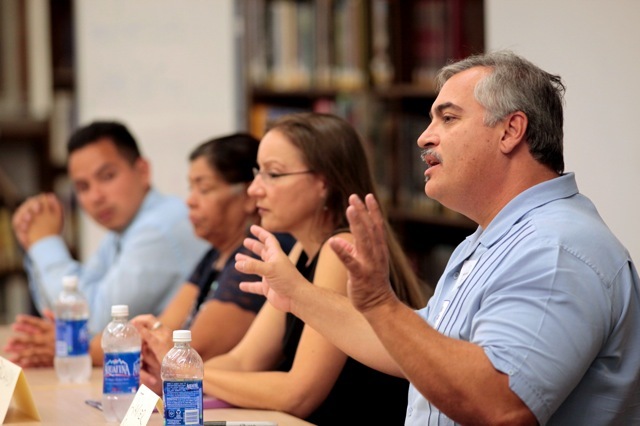 There was such a high demand for time slots, that many of the teachers requested STF members to present in their classrooms. 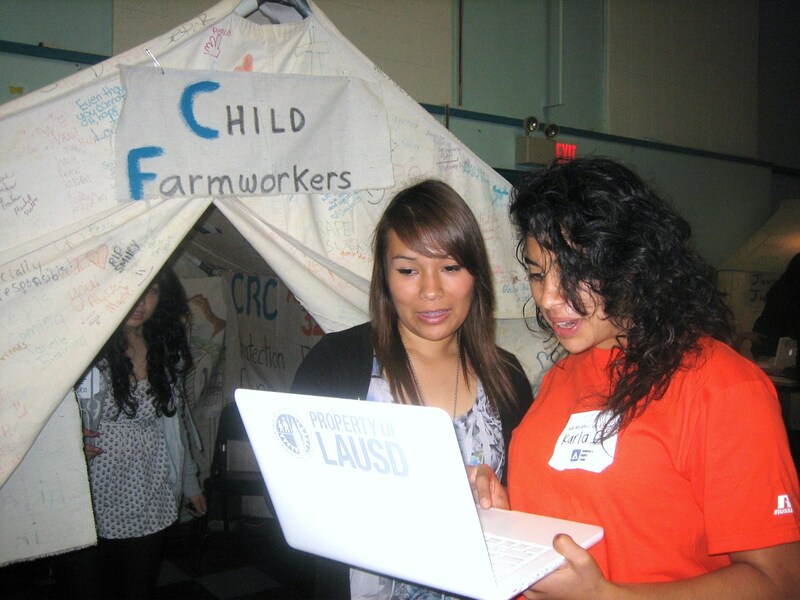 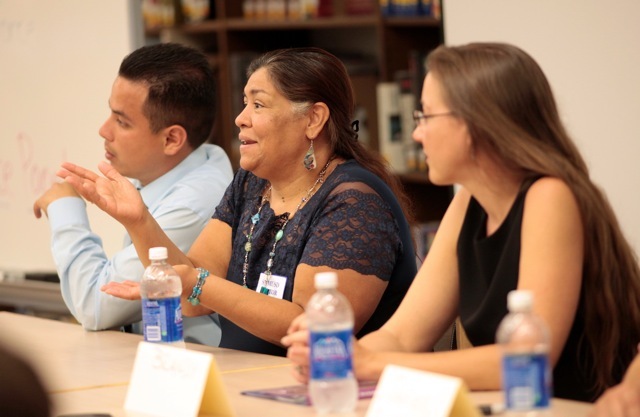 Visiting students were educated on the history and current implications of child labor laws in the United States, with specific regard to child farmworkers. 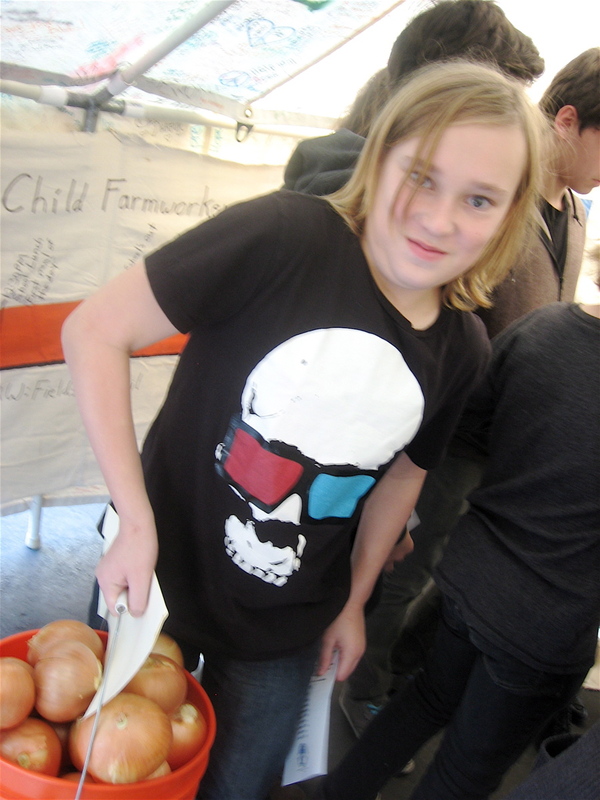 Many of the students were suprised to hear that children their own age were working up to twelve hours a day on commercial farms, often at the expense of their health and education. 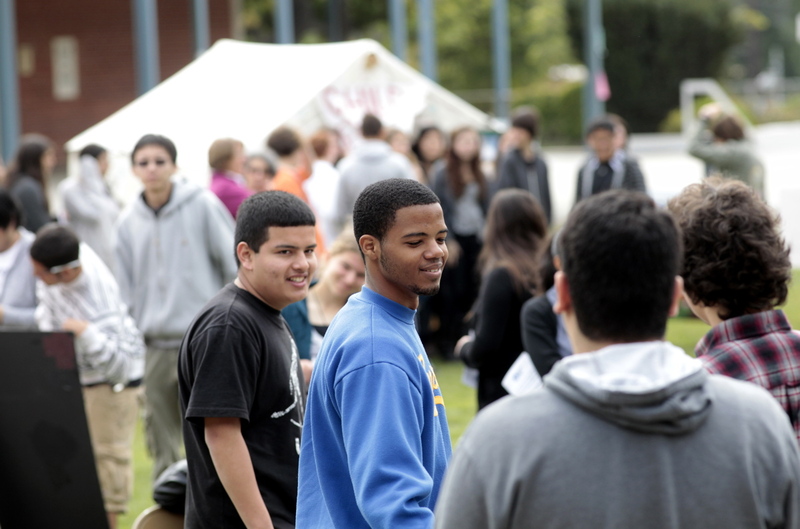 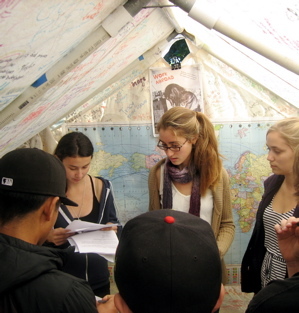 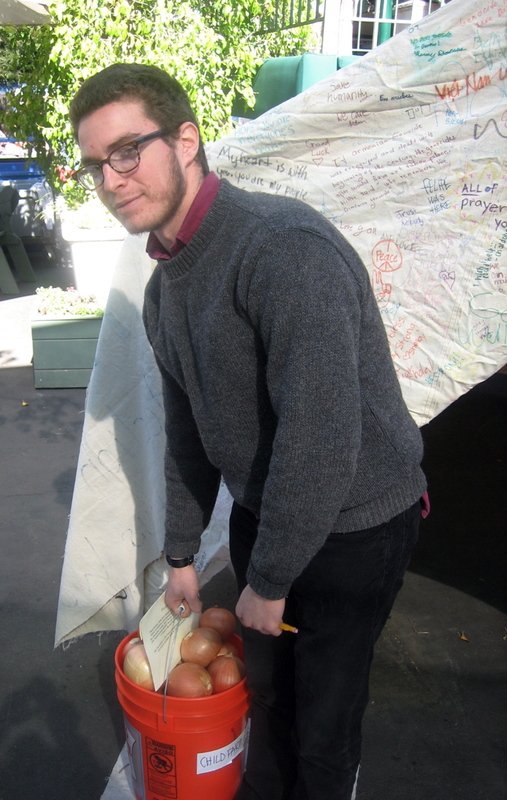 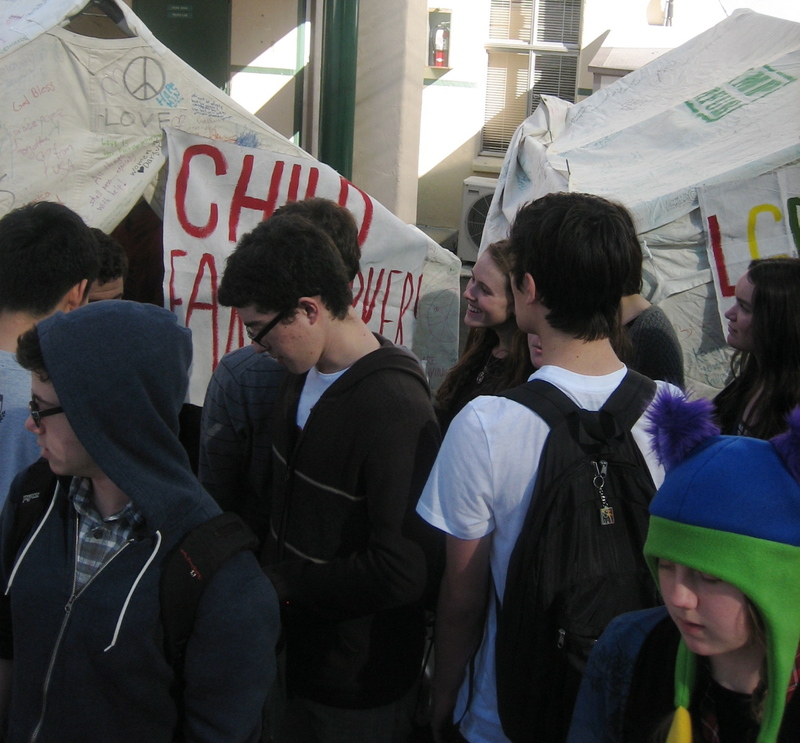 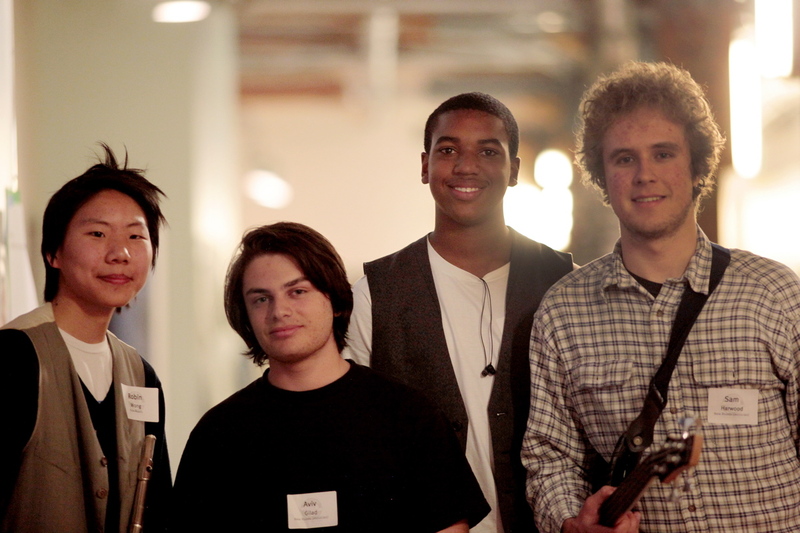 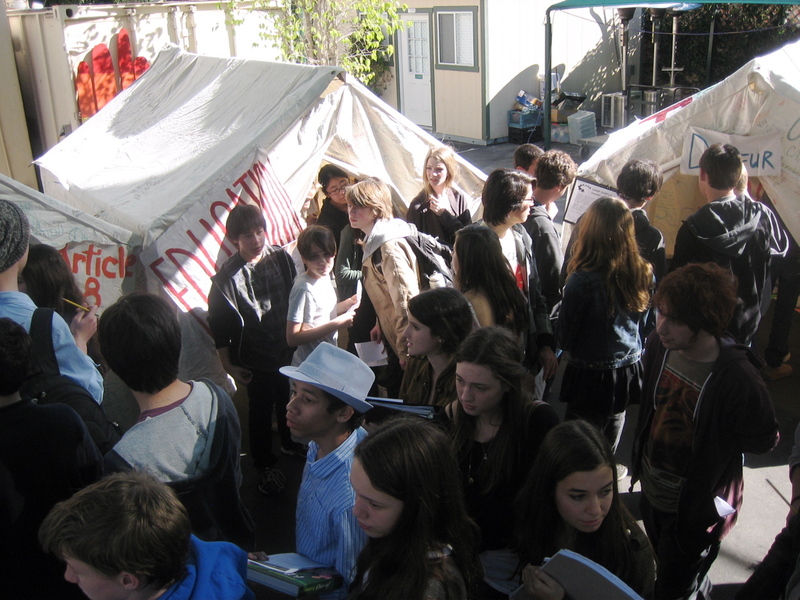 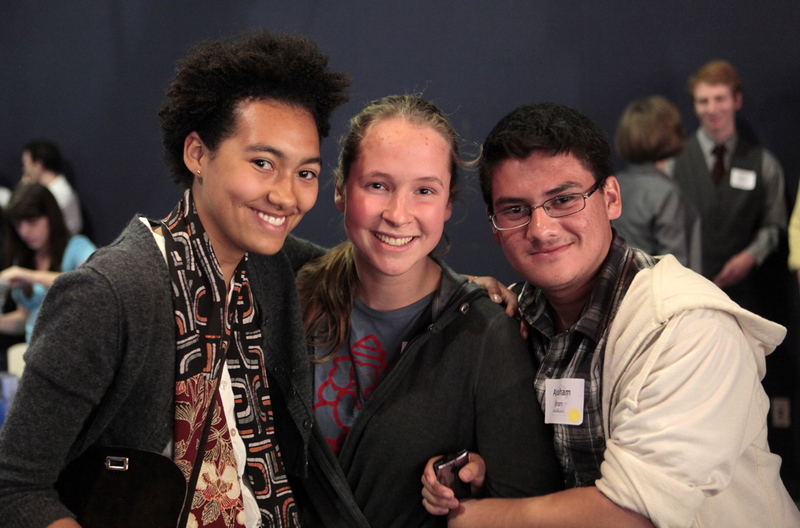 December 6, 2010: Despite rumors of rain, the skies cleared, and the Santa Monica High School (SAMOHI) Student Task Force successfully hosted the Children’s Rights Camp reaching out to the entire school. 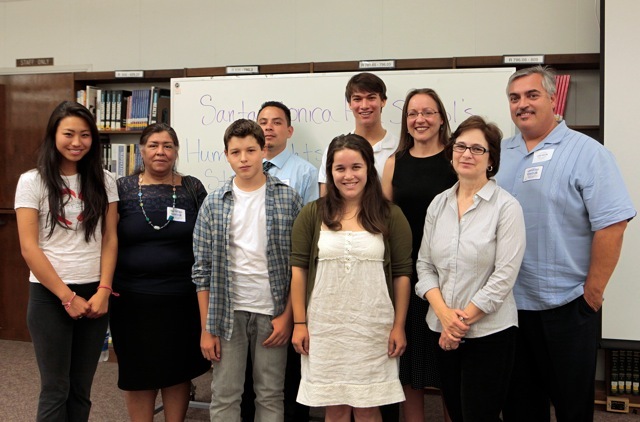 Members of SAMOHI’s STF presented on six children’s rights violations prevalent in our communities. 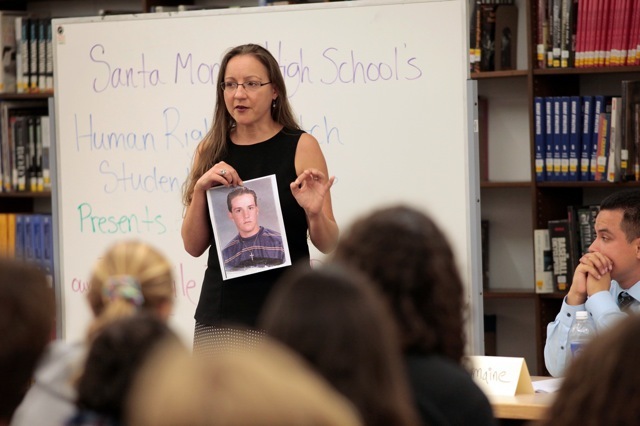 Topics included the use of child farmworkers, juvenile justice reform, child homelessness, LGBT discrimination at school, child trafficking and children’s rights violations in Darfur. 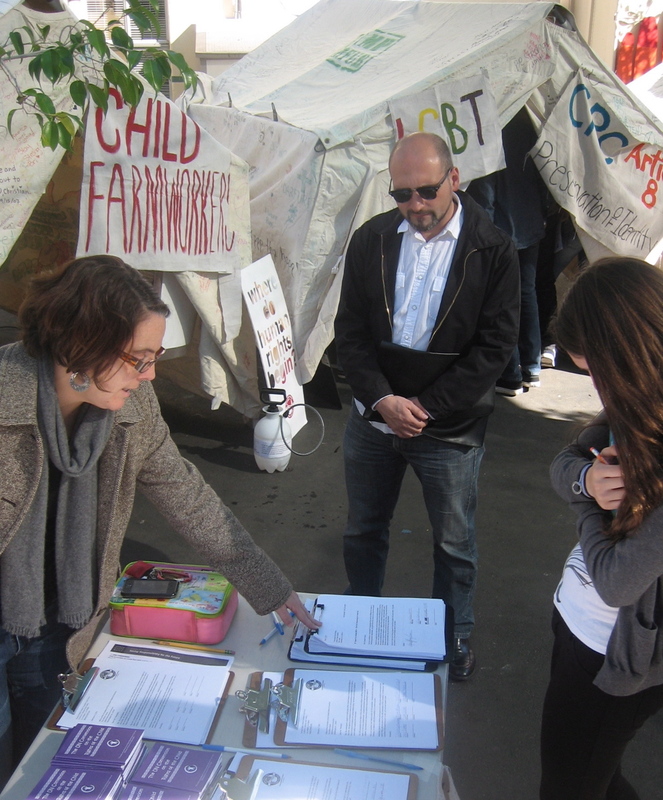 STF connected each topic to the Convention on the Rights of the Child (CRC) and signed petition challenging President Obama to support US ratification of the CRC. 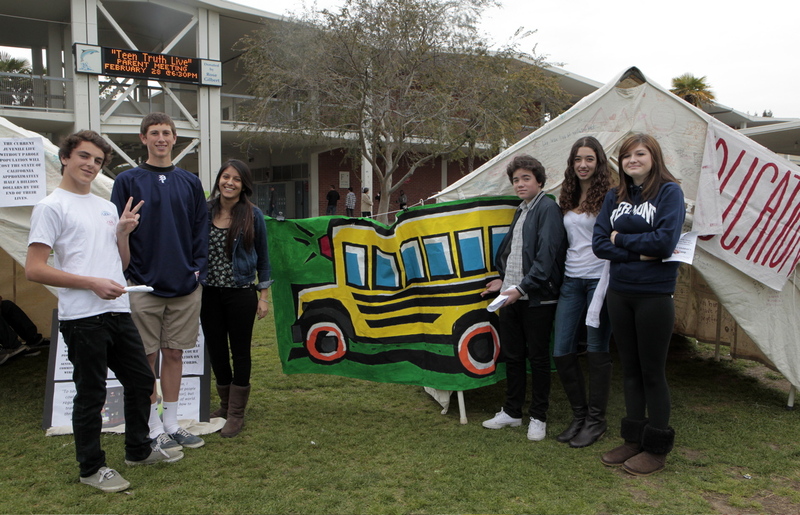 Congratulations to the SAMOHI chapter for a wonderful event! 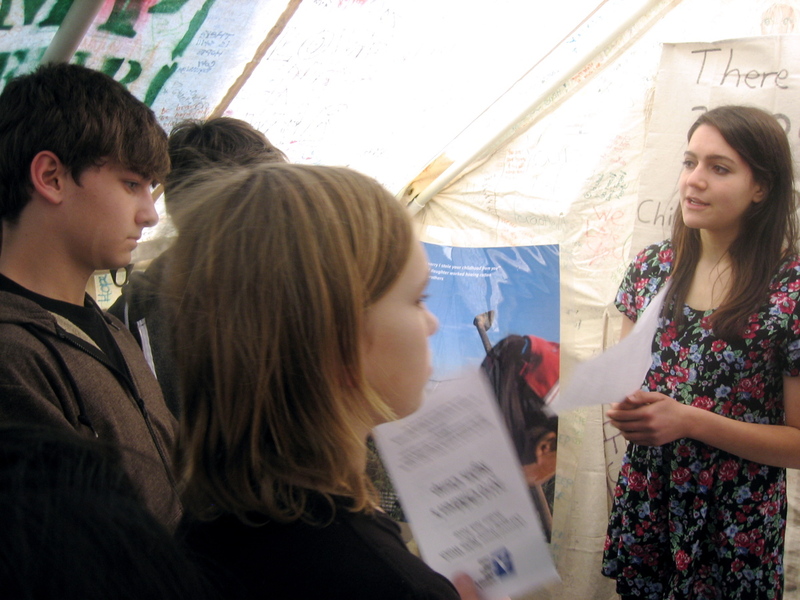 December 1, 2010: On a cold, crisp December morning, the 25 student activists who make up the New Roads STF chapter gathered to construct the fourth Children’s Rights Camp of the 2010-11 school year. 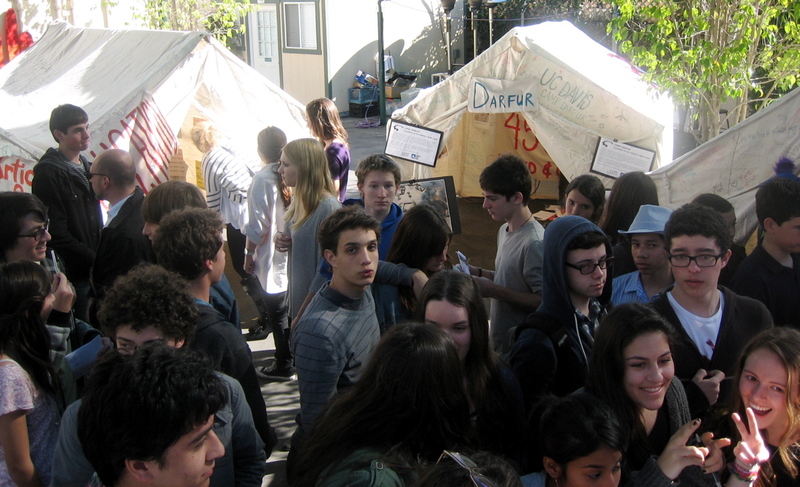 Students representing grades 9-12 visited the Camp throughout the day. 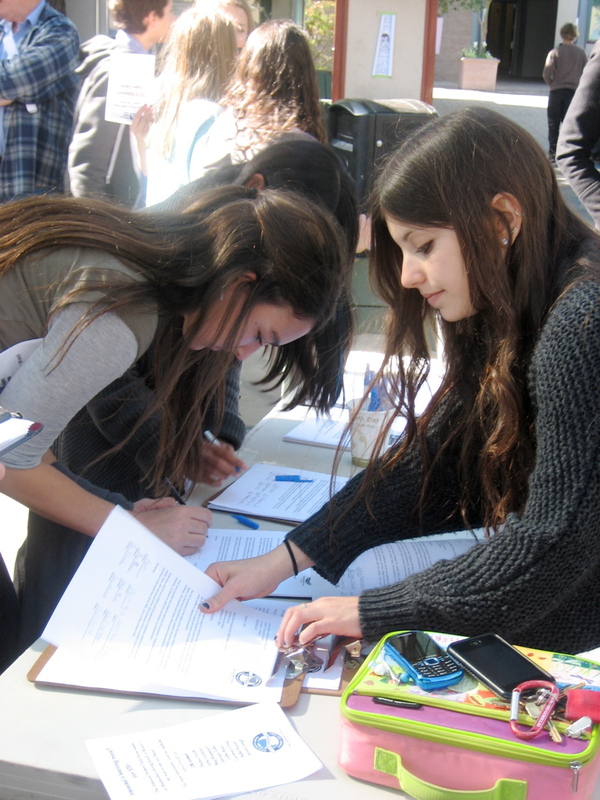 In addition, STF students gathered hundreds of signatures urging President Obama to set the United States on the path to ratify the Convention on the Rights of the Child (CRC) to protect the rights of children in the US and abroad. 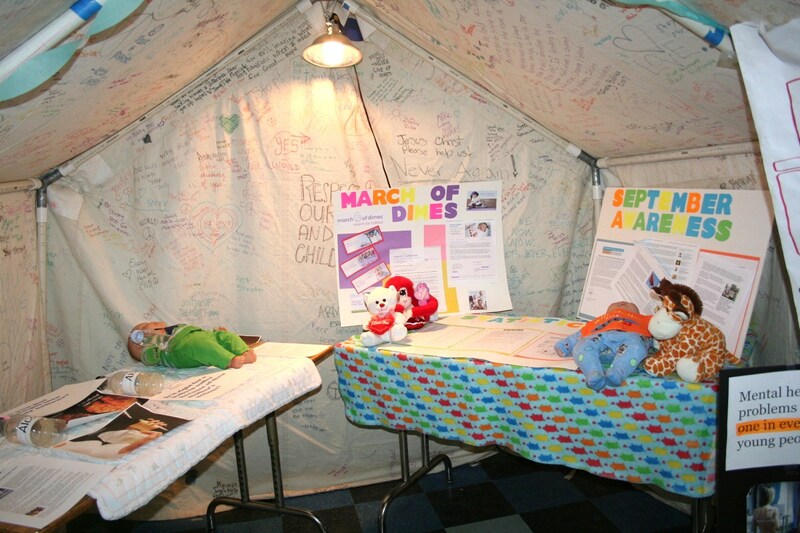 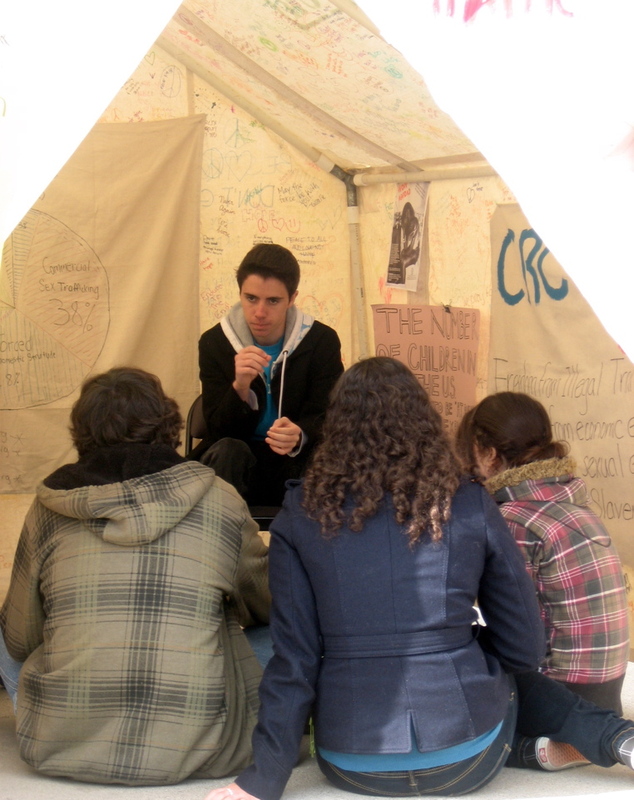 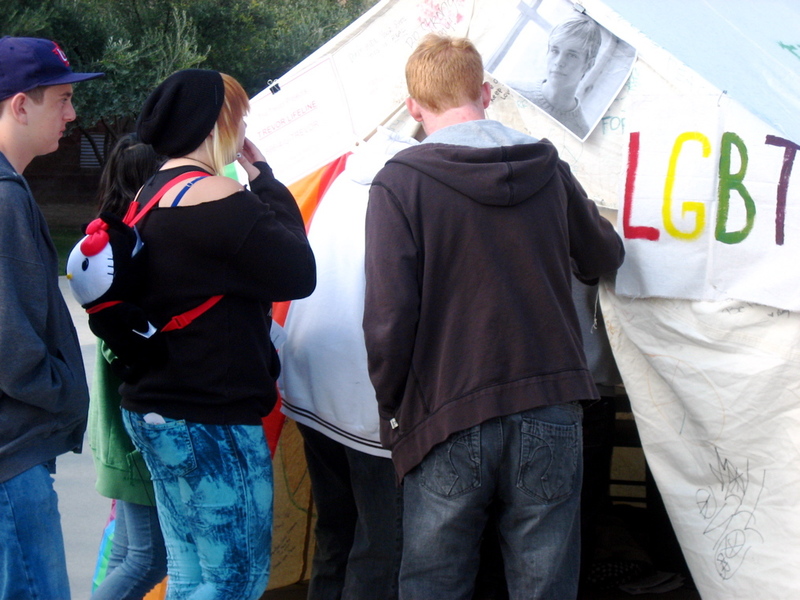 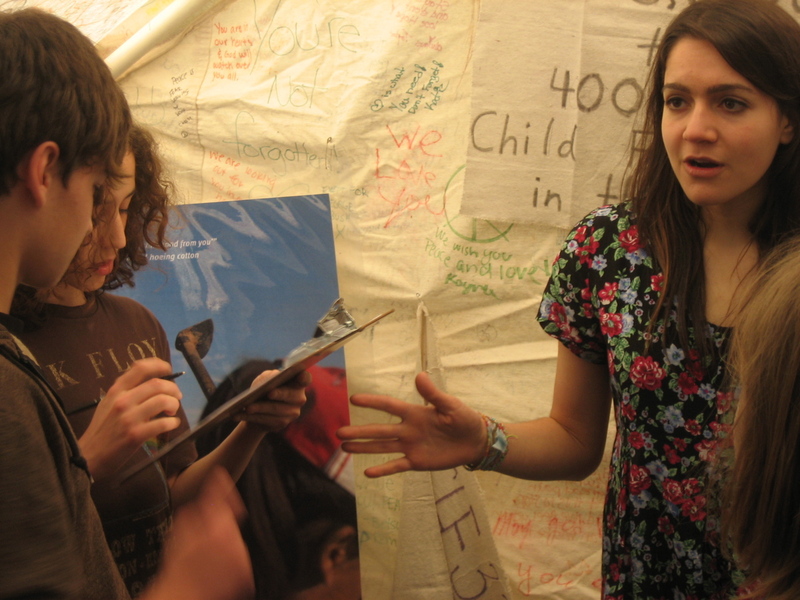 November 30, 2010: The Crossroads STF launched a series of tents to explore one critical children’s rights issue per month. 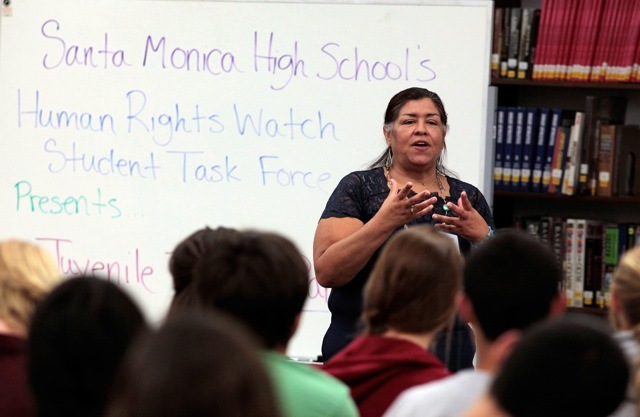 This month, the Crossroads STF educated middle school and high schoolers on rights, rules and anti-discrimination laws that are in place for lesbian, gay, bisexual, and transgender (LGBT) youth in school. 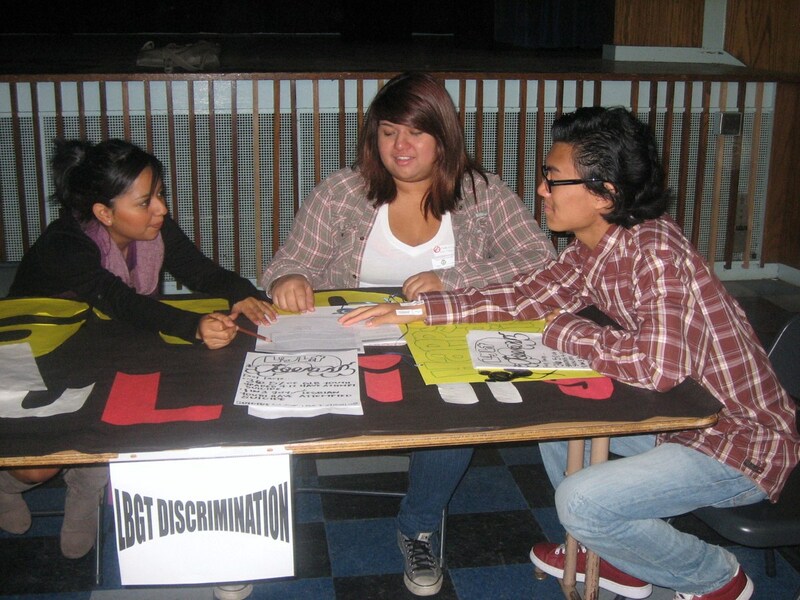 Students discussed the recent deaths from bullying and suicide in the LGBT community, while highlighting support services available to LGBT youth. 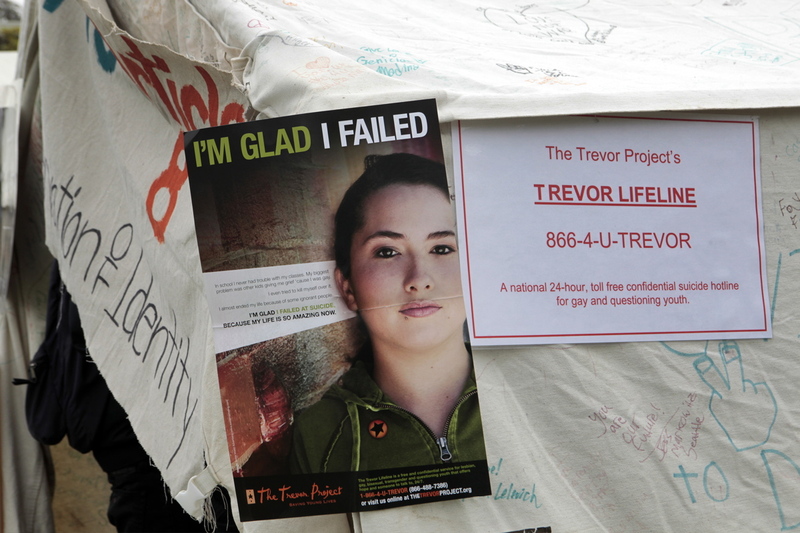 Featured support services include The Trevor Projectand the California Teen Line – both provide 24/7 hotlines for LGBT youth. 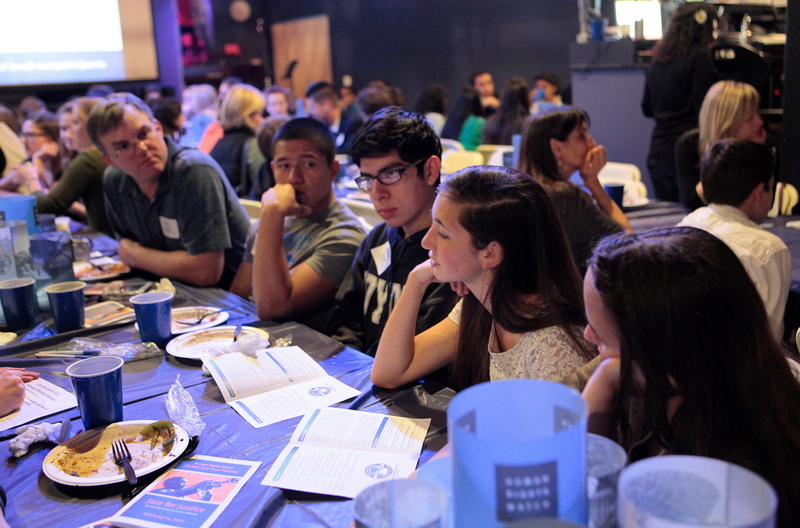 The Student Task Force partnered with the Human Rights Watch California Committee South at the HRW Annual Dinner to highlight our work on the rights of children locally. 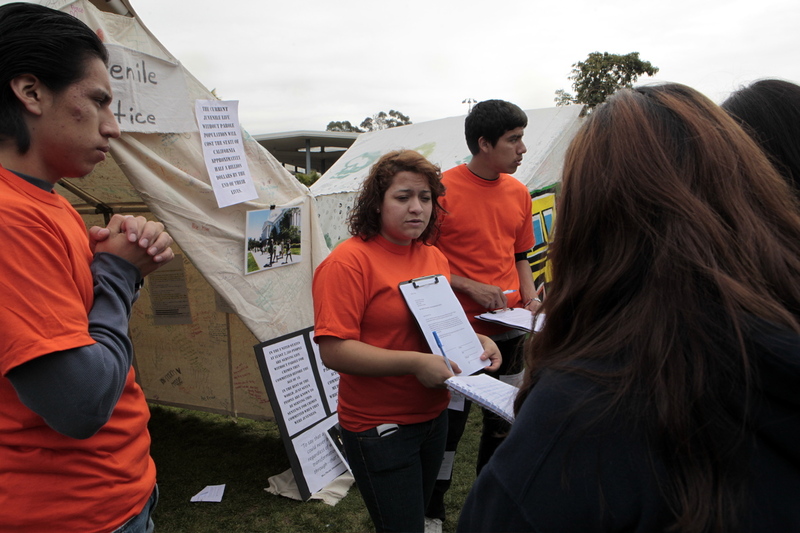 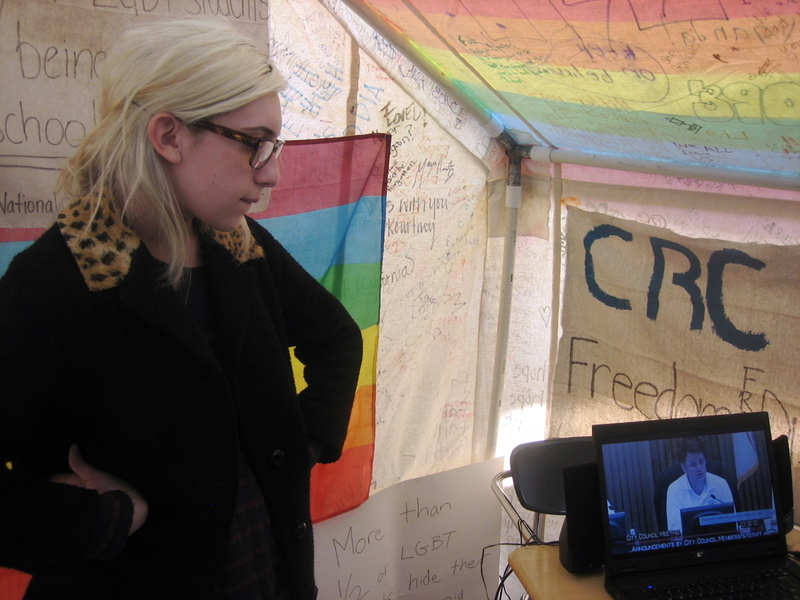 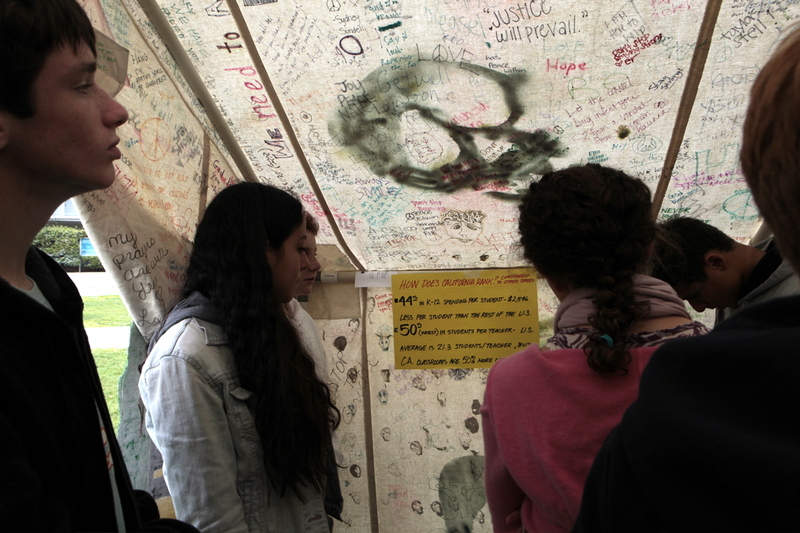 With the continued support of HRW staff and local donors, over 50 students and teacher advisors represented STF as we featured three tents from our Children’s Rights Camp – Juvenile Justice, LGBT Rights, and Child Farmworkers. 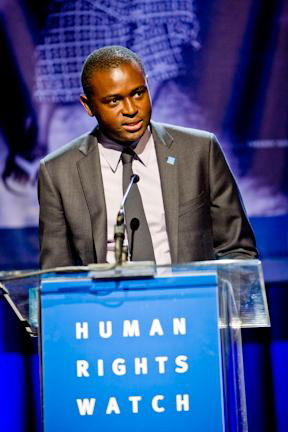 In addition, STF leaders met directly with awarded HRW Defenders Dr. Steave Nemande of Cameroon, and Tong Yi, representative of Liu Xiaobo of China. 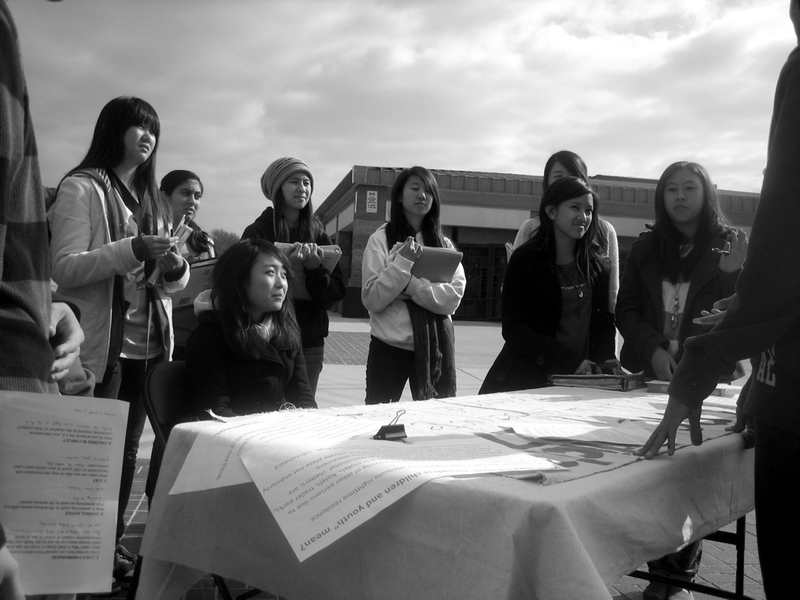 Tong Yi shared her reflections as a student during the 1989 Tiananmen Square incident and the continuing need for freedom of speech and basic rights in a quickly-growing China. 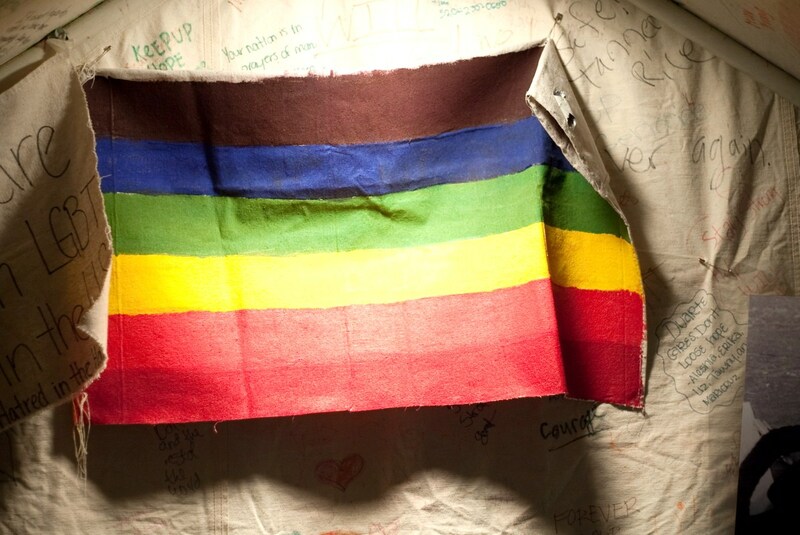 Dr. Nemande expressed his hopes for the LGBT community in Cameroon to not be abused but to be understood, accepted and provided for in society. 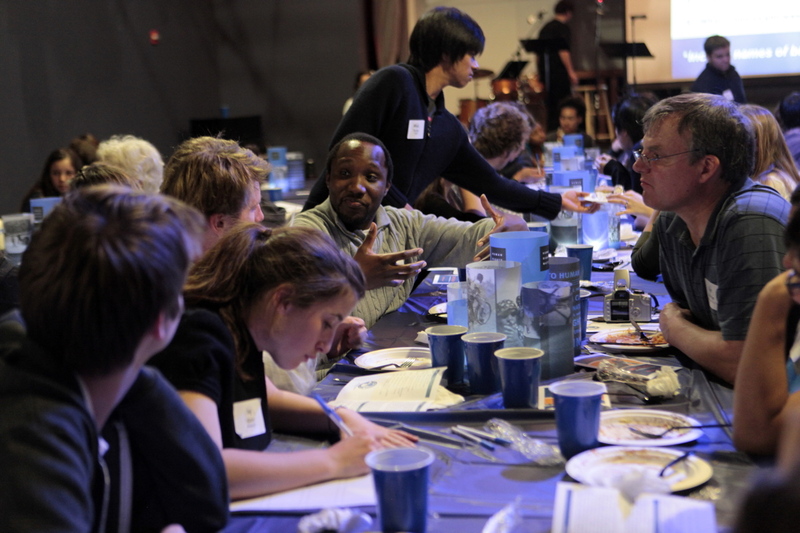 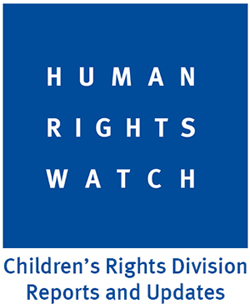 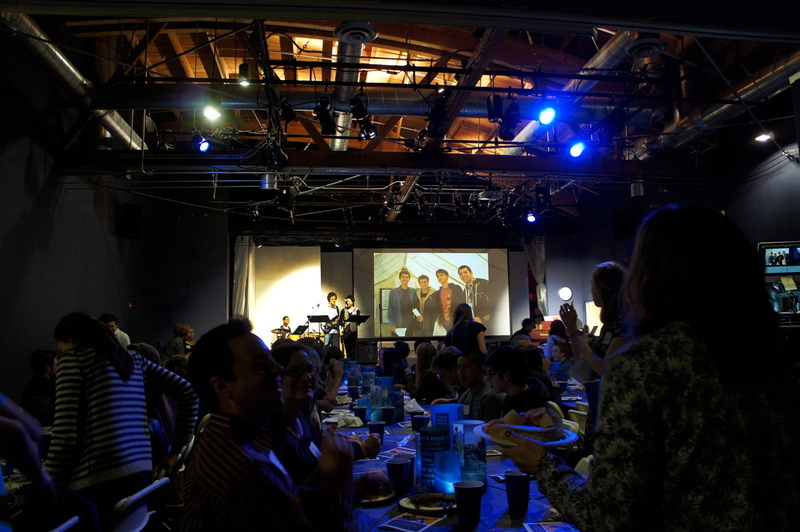 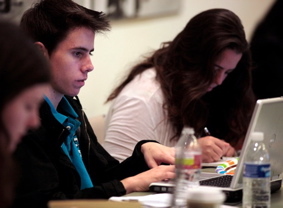 November 15, 2010: The Student Task Force partnered with the Human Rights Watch California Committee South at the HRW Annual Dinner to highlight our work on the rights of children locally. 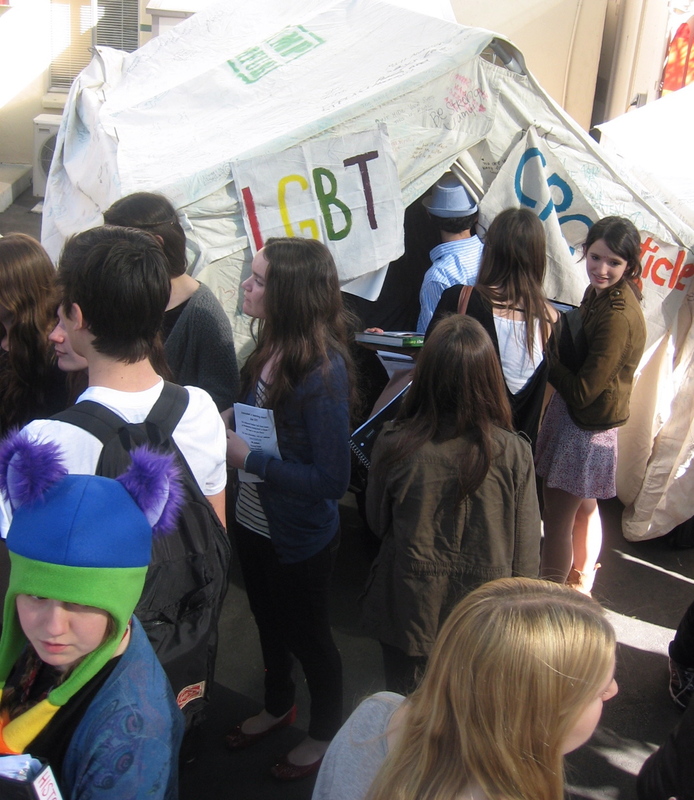 With the continued support of HRW staff and local donors, over 50 students and teacher advisors represented STF as we featured three tents from our Children’s Rights Camp – Juvenile Justice, LGBT Rights, and Child Farmworkers. 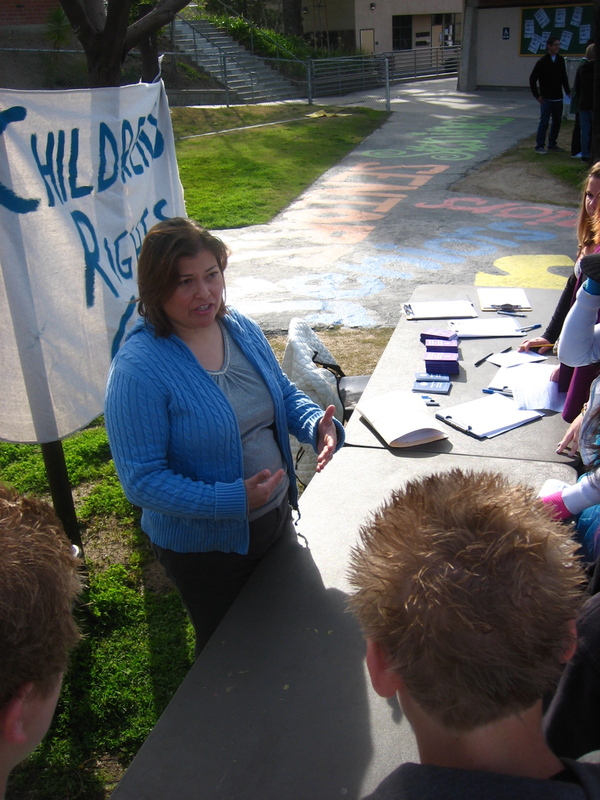 November 12, 2010: Wildwood STF students host the first 2010 Children’s Rights Camp. 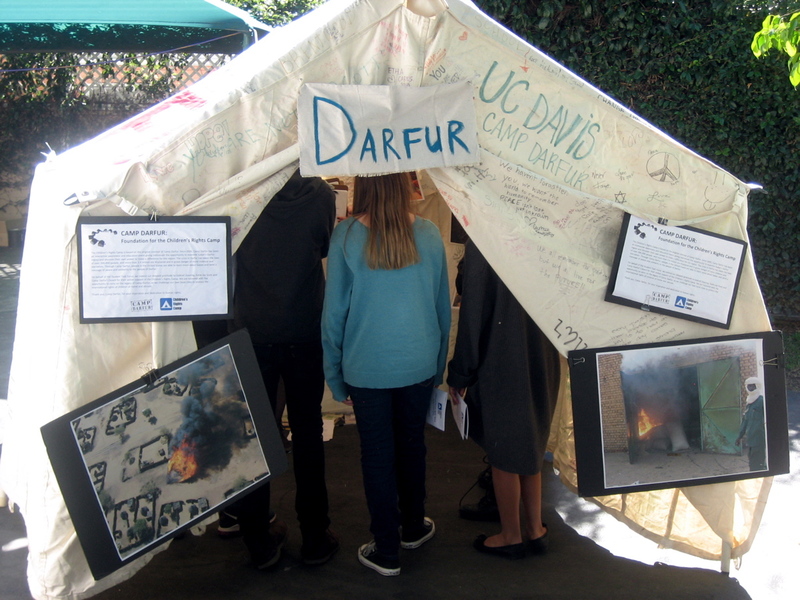 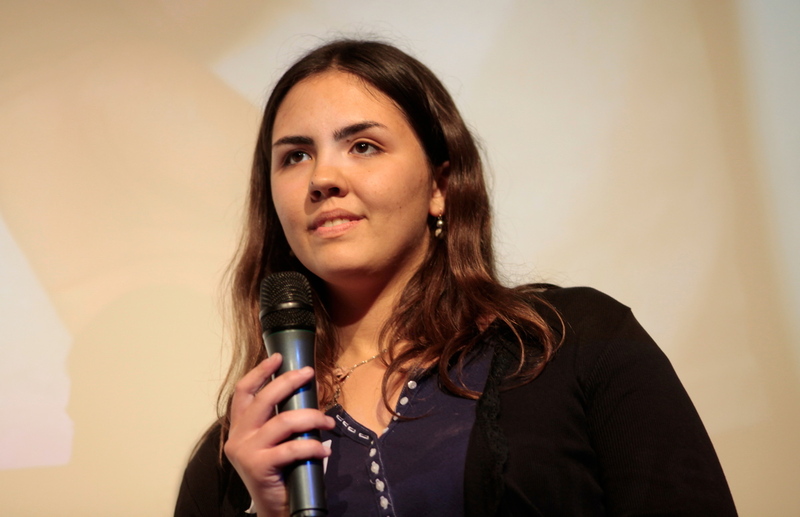 With seven tents, STF presented to ovr 250 students during the day and over 40 parents in the evening where featured guest speaker, Senita Slipac, presented her work on children’s access to education in Bosnia, Afghanistan and other conflict areas. 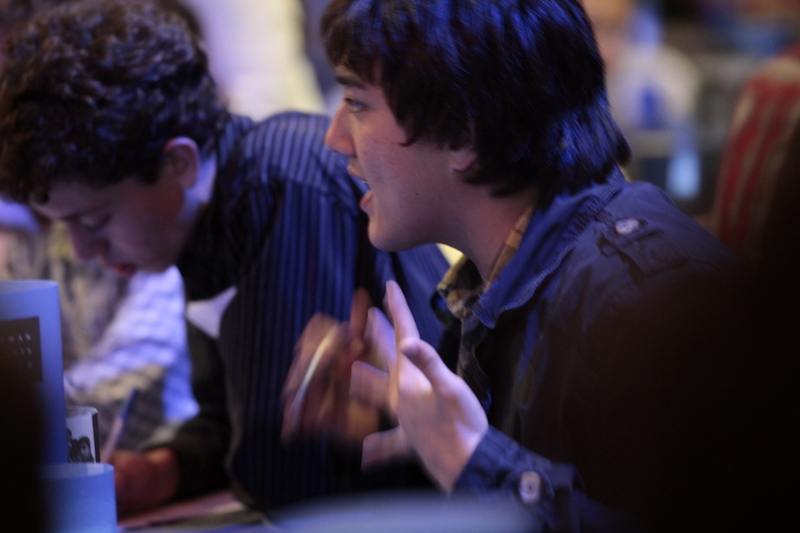 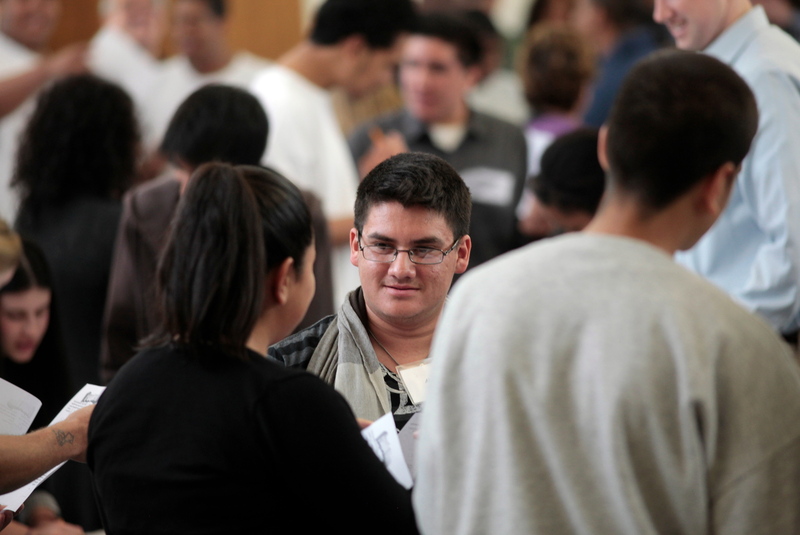 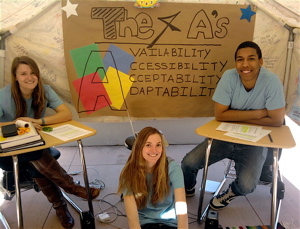 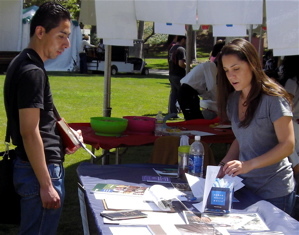 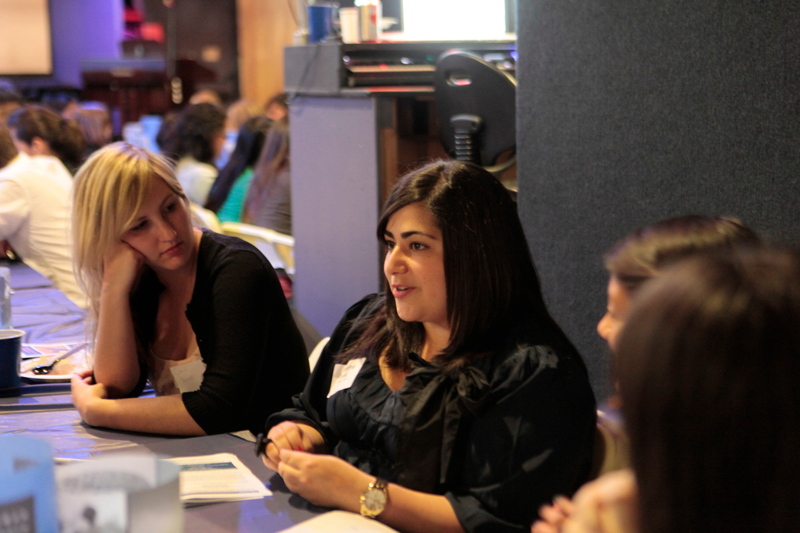 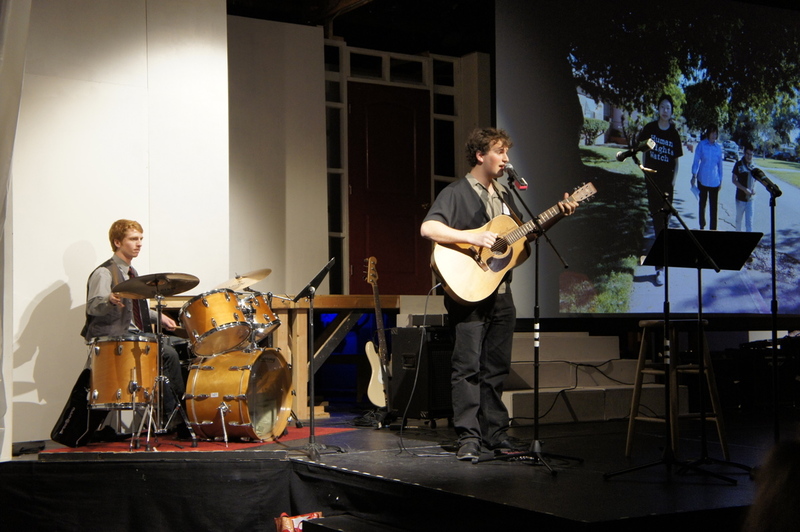 November 9, 2010: The Carson STF held Mix-It-Up, an annual event encouraging students to mingle outside of their regular hangout spots to meet new students and support a cause. 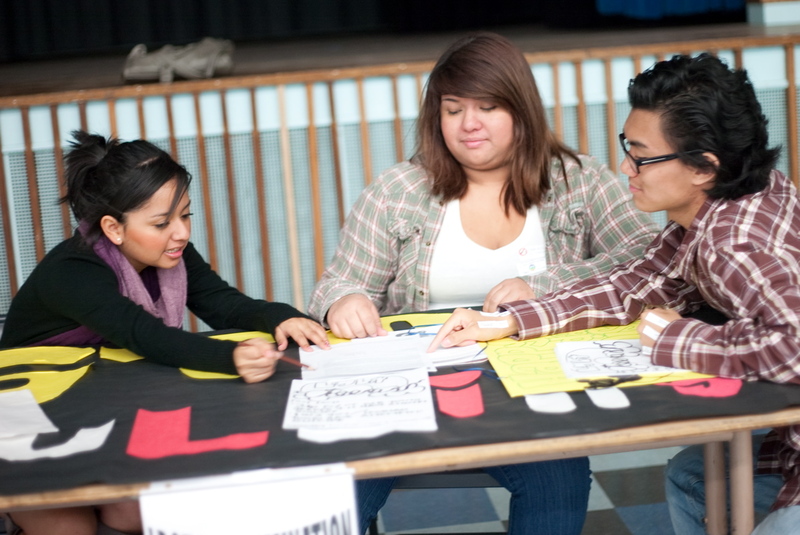 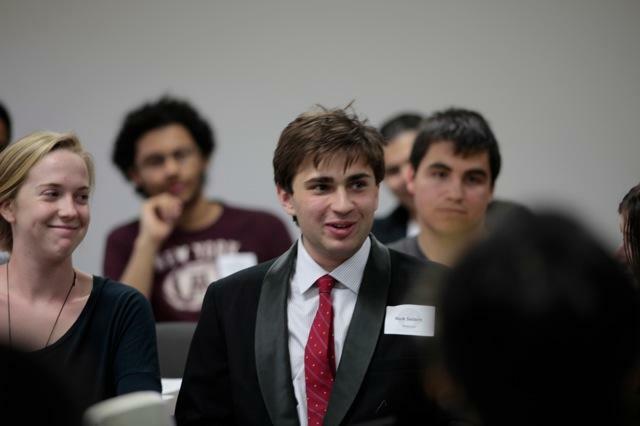 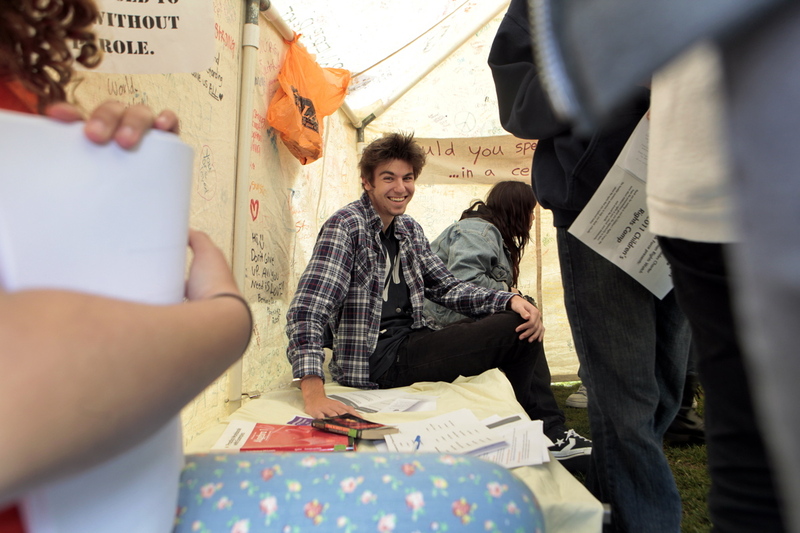 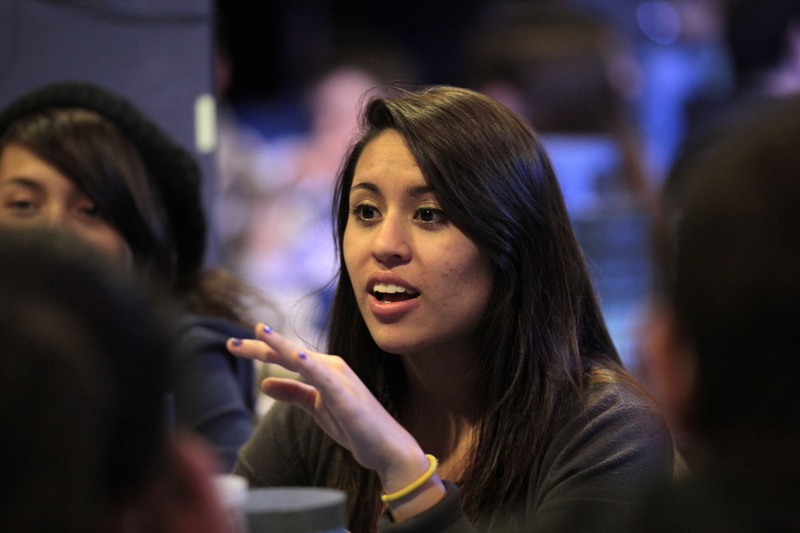 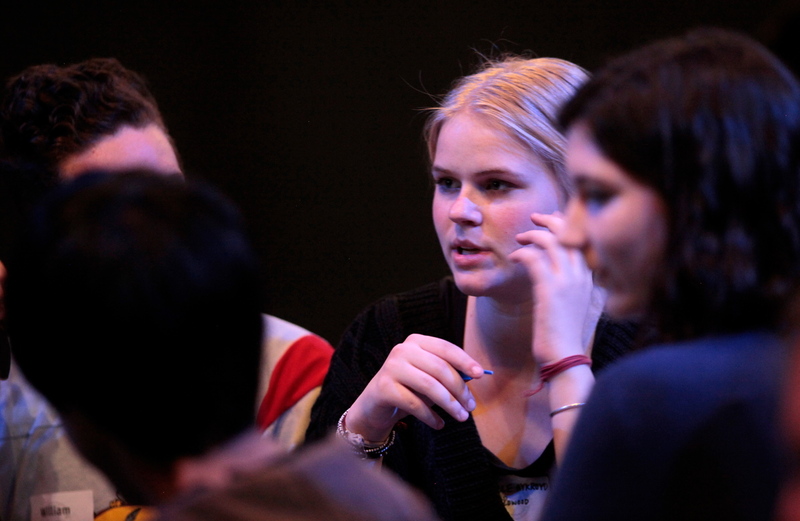 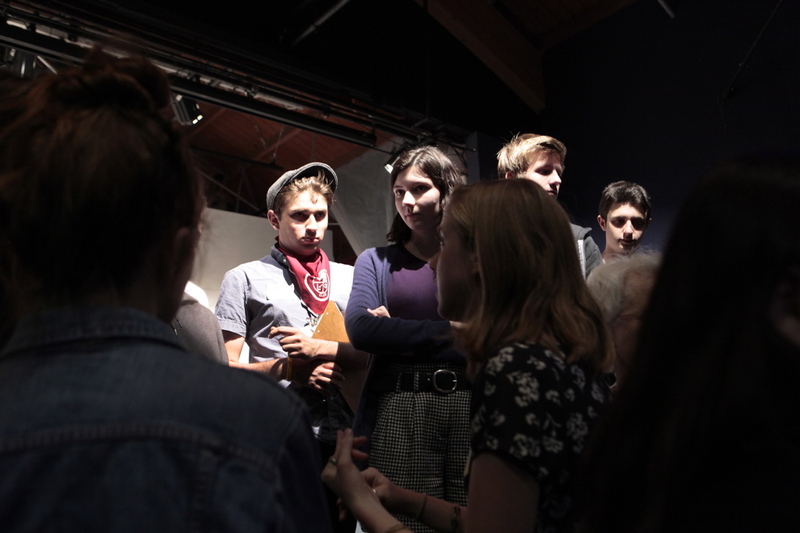 During the event, students were asked to identify a rights-based issue that is important to them. 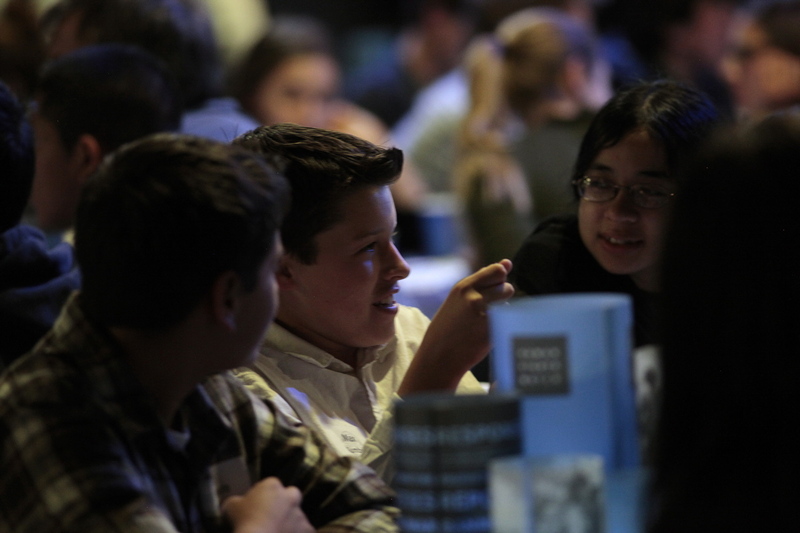 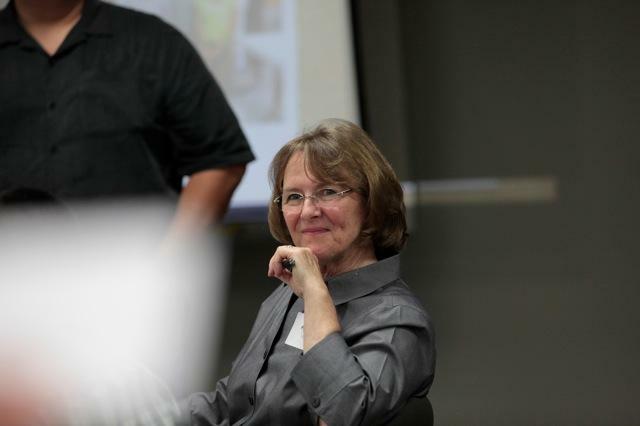 “Every year, I’m so pleased on seeing the turn-out and it always makes me realize that when Carson students are given the opportunity, they like to mix-it-up and work together,” said STF Advisor Merri Weir. 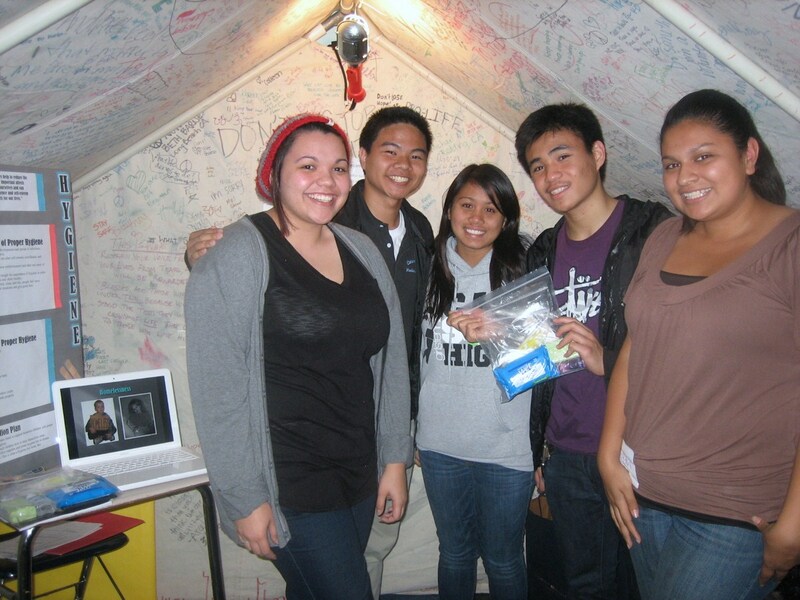 November 4, 2010: STF leaders from Canyon and Valencia High Schools attended the Human Rights Conference at Vaughn International Studies Academy in San Fernando. 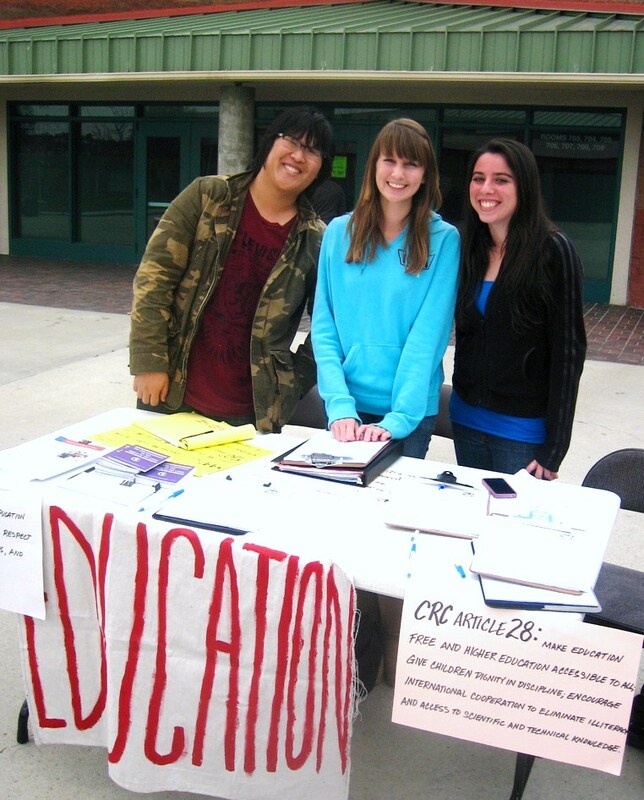 STF program advisor, Nancy Medina, Canyon Co-President Shanley Newman, and Valencia Co-Presidents Laurent and Audrey Abergel ran a booth during the convention informing students about the CARE Act and the overall work of STF. 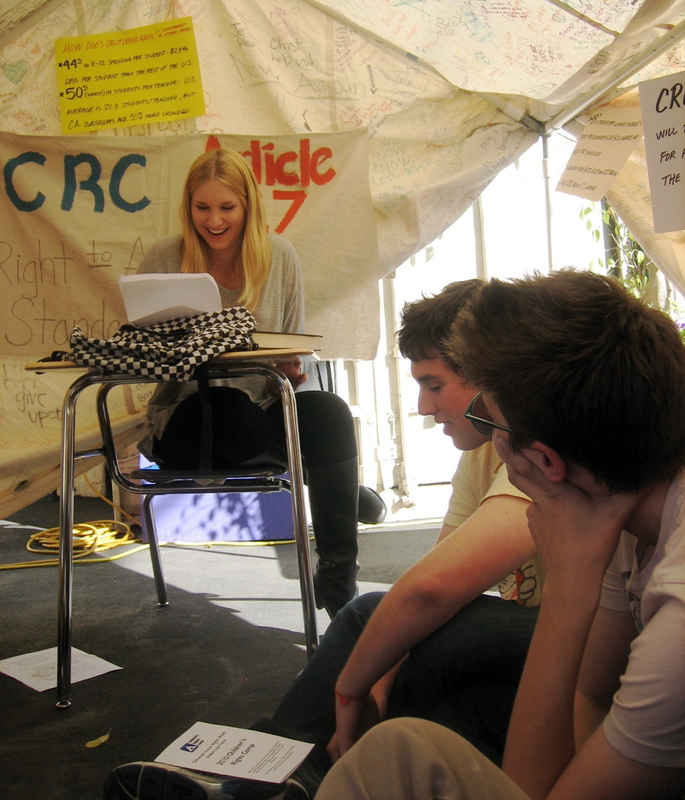 Presentations and group discussions about the Convention on the Rights of the Child (CRC) were held during Break Out Sessions between the leaders and VISA students. 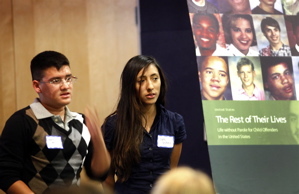 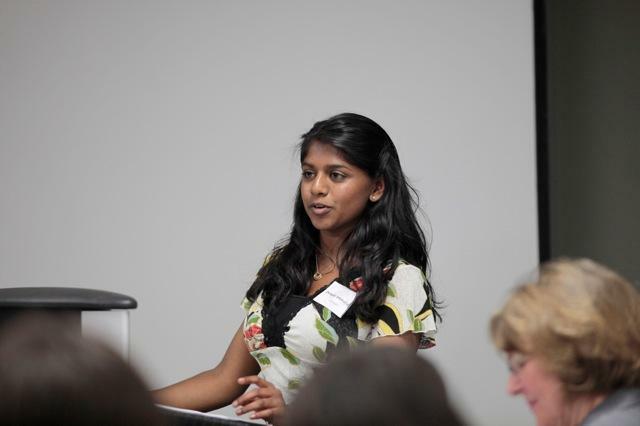 October 16, 2010: STF student presidents from Wildwood School and intern Deepti Immaraju presented to over 50 students at the fall workshop of YouThink, an organization that trains students in Los Angeles public schools and universities to become leaders and effective advocates for social change. 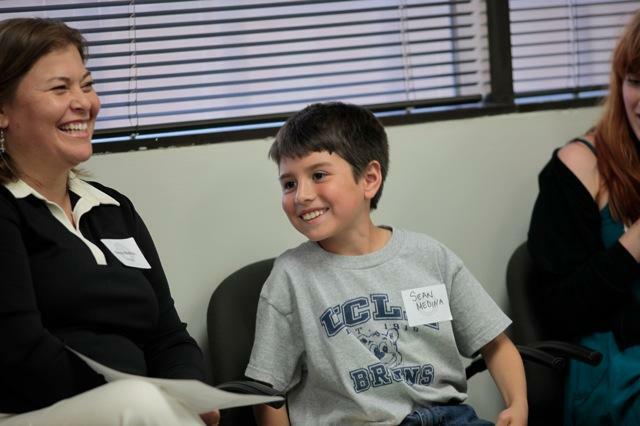 STF introduced the Convention on the Rights of the Child and led a discussion on the protection of children’s rights in Los Angeles and around the world. 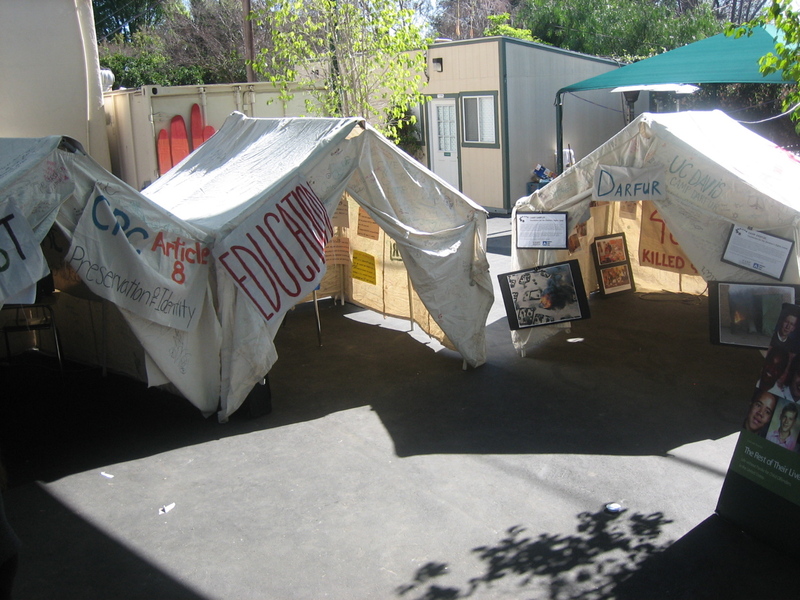 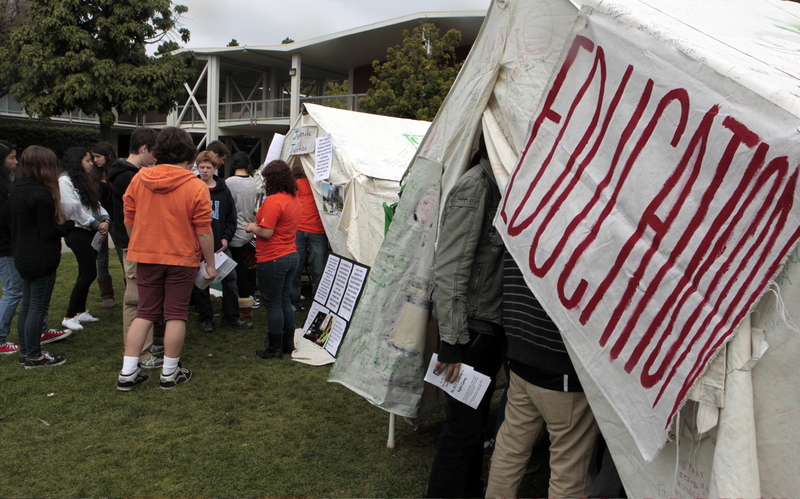 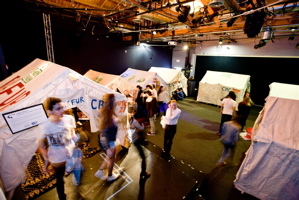 YouThink students had an opportunity to look at one of the Children’s Rights Camp tents to plan their campaign to advocate for access to education in their schools. 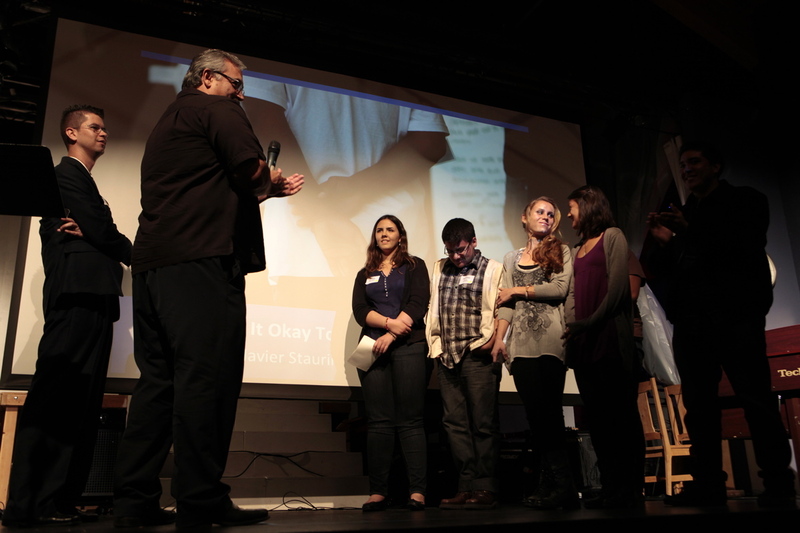 We are excited to partner with YouThink in our education efforts this year! 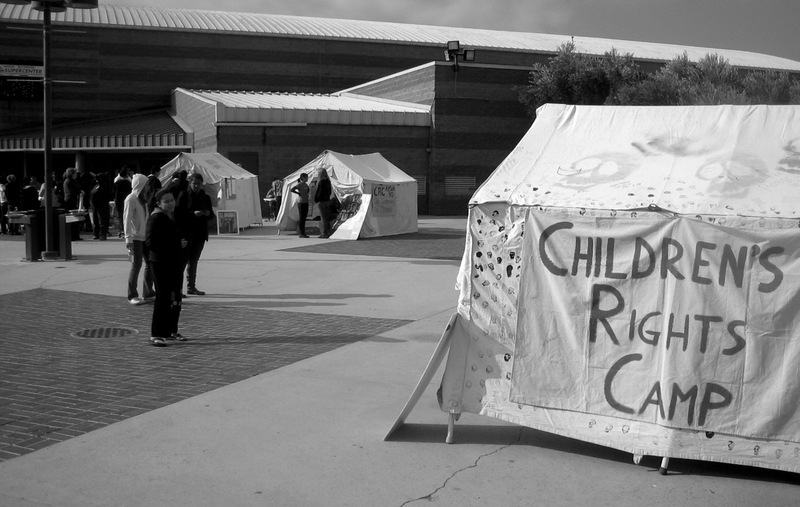 View the presentation on the Convention on the Rights of the Child. 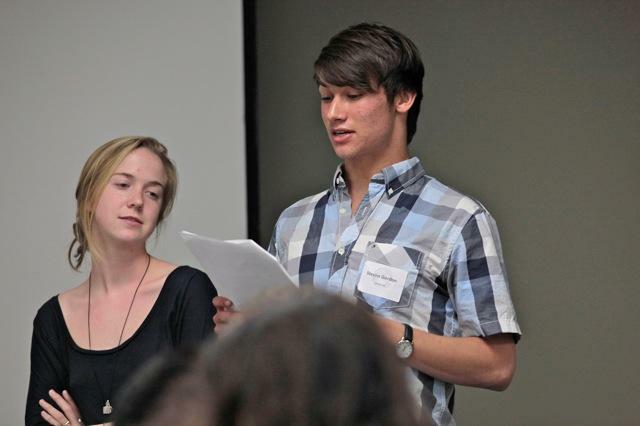 October 7, 2010: A delegation of Student Task Force leaders presented to 20 educators and human rights activists at the Facing History & Ourselves Teachers Workshop on October 7. 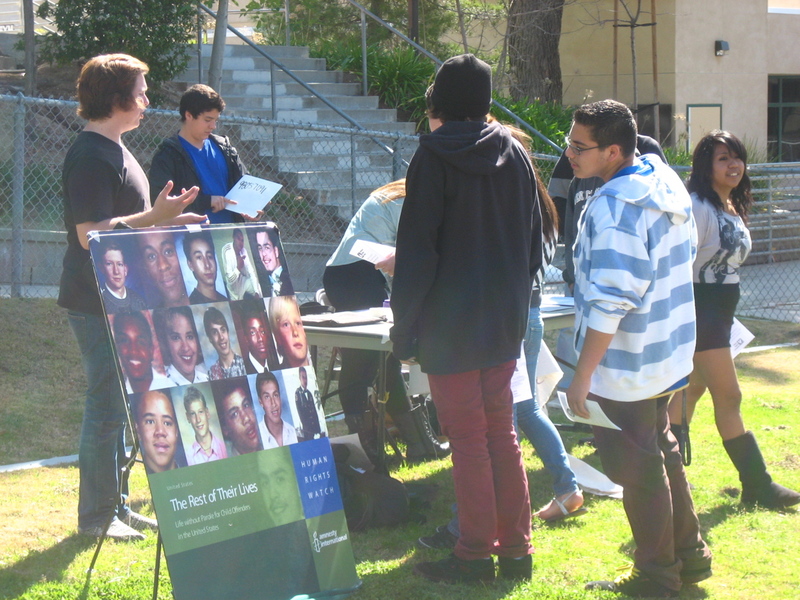 Students demonstrated how human rights education leads to action by highlighting their recent campaign work on the Fair Sentencing for Youth Act (SB 399) and Juvenile Justice reform in California. 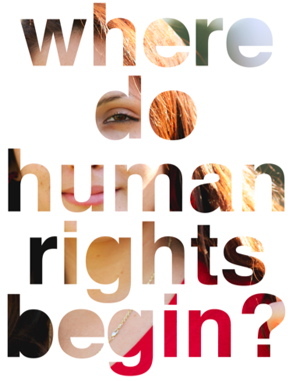 View our Human Rights Education page. 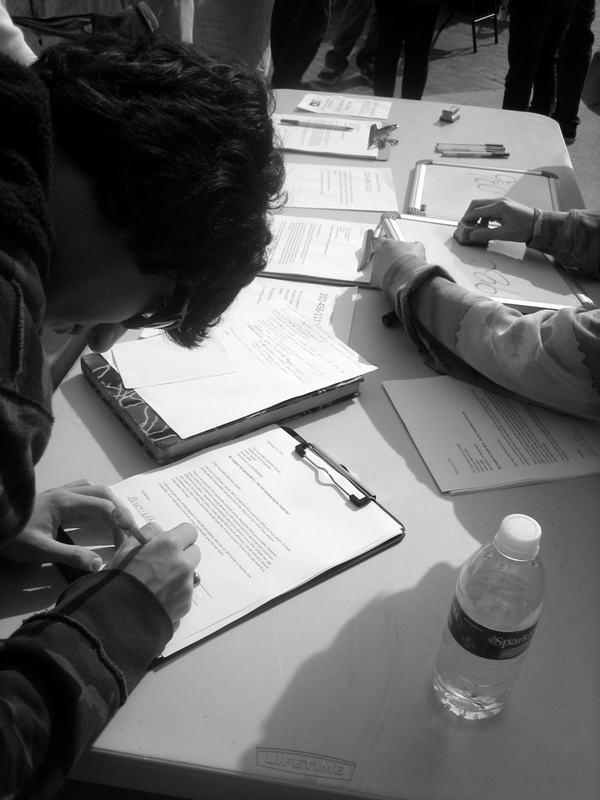 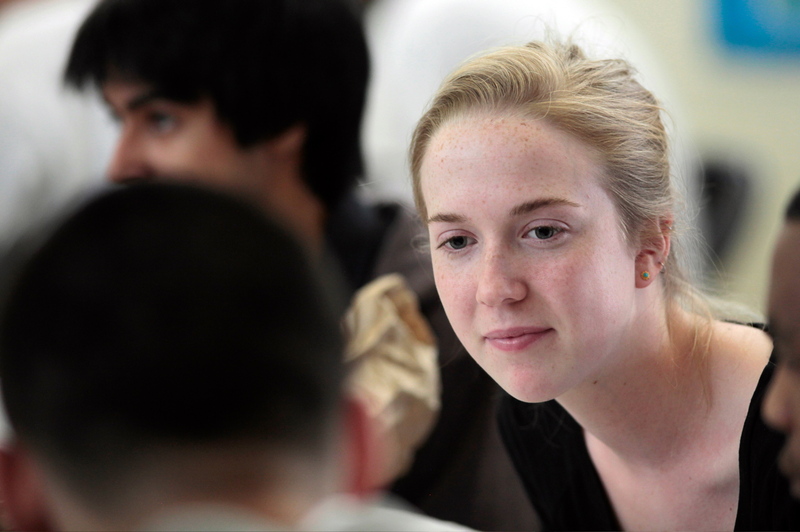 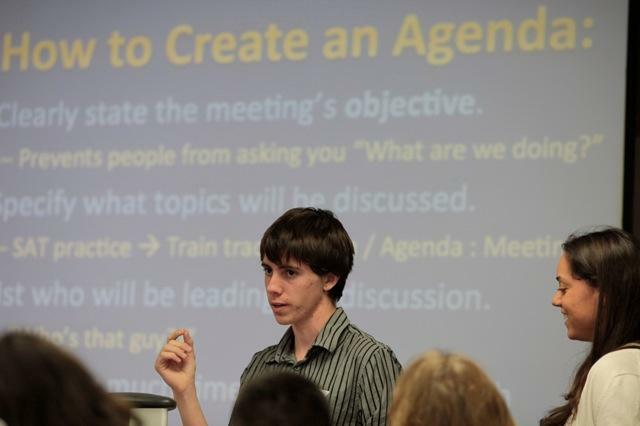 September 25, 2010: The Student Task Force launched its 2010-11 school year at the annual Fall Leadership Workshop. 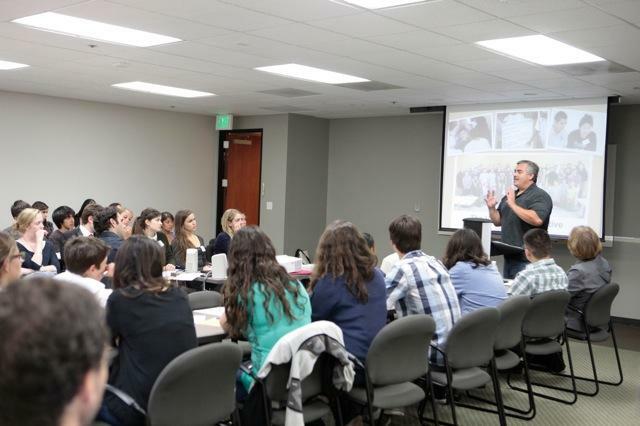 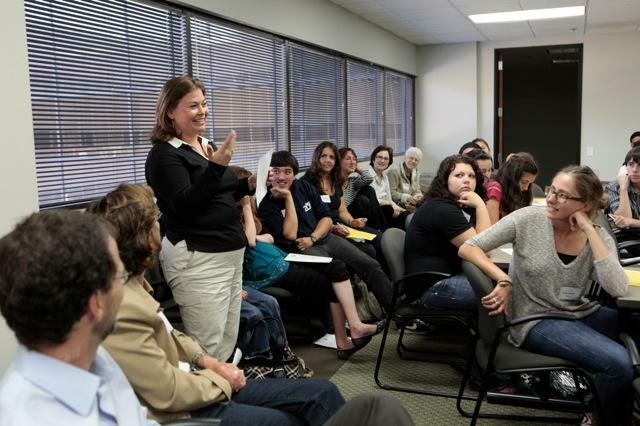 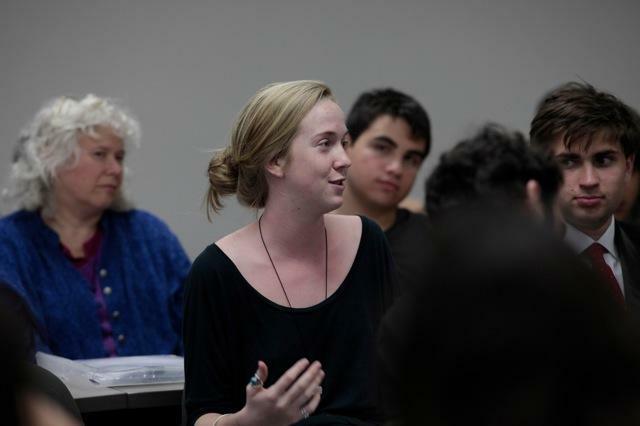 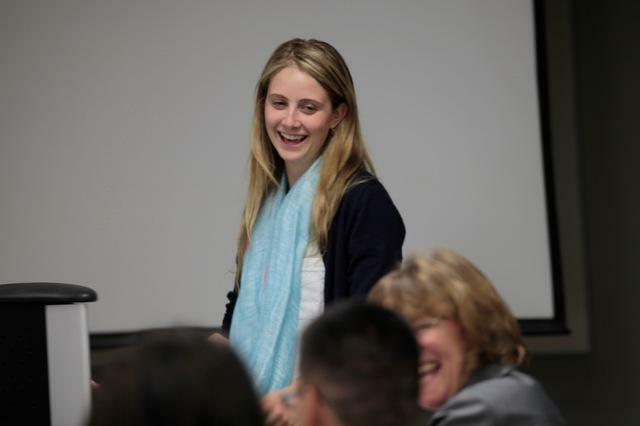 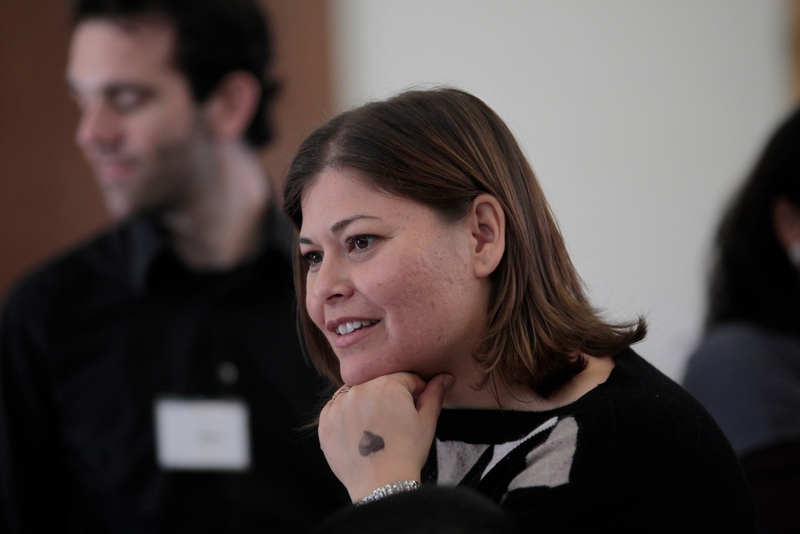 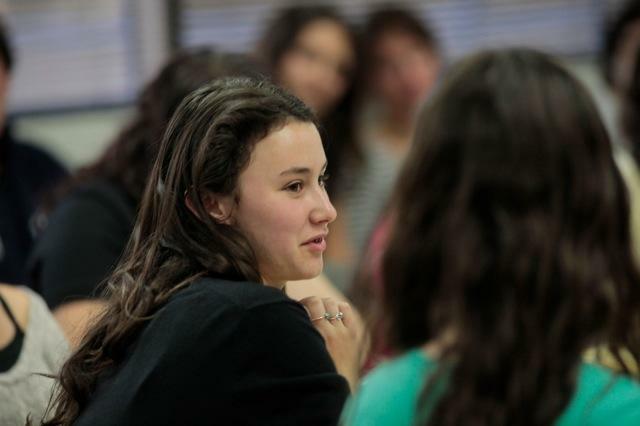 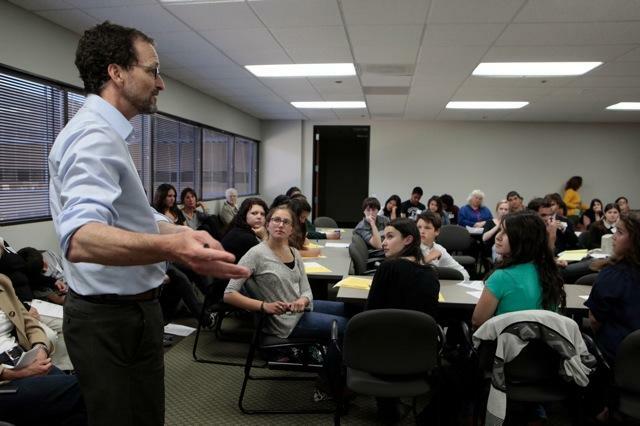 Co-hosted by the UCLA Visiting Fulbright program, over 50 students and teachers representing 10 public and private schools joined international scholars to create strategies that promote and protect children’s rights in Los Angeles. 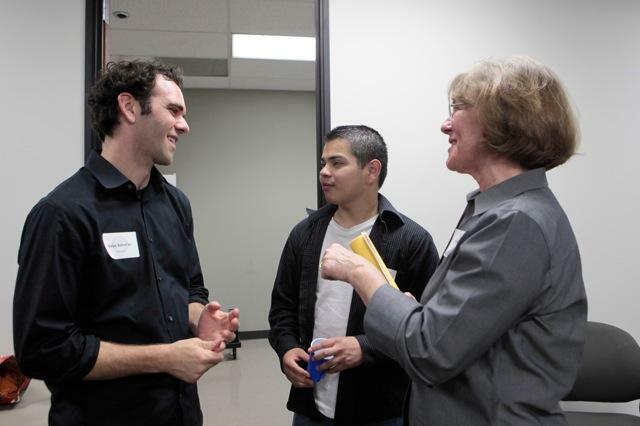 Guest speakers included Los Angeles City Council President Eric Garcetti and online media consultant Justin Connolly – together they identified practical steps to educate others, hold local governments accountable, and ultimately challenge the U.S. to ratify the Convention on the Rights of the Child (CRC).In March 2010, the cities of Los Angeles, Santa Monica, and Santa Clarita passed resolutions affirming support for the CRC. 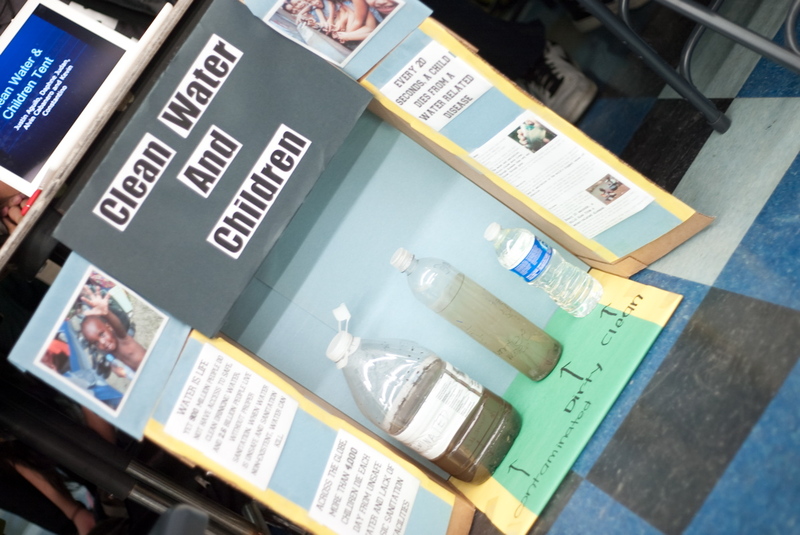 Read student R.M. 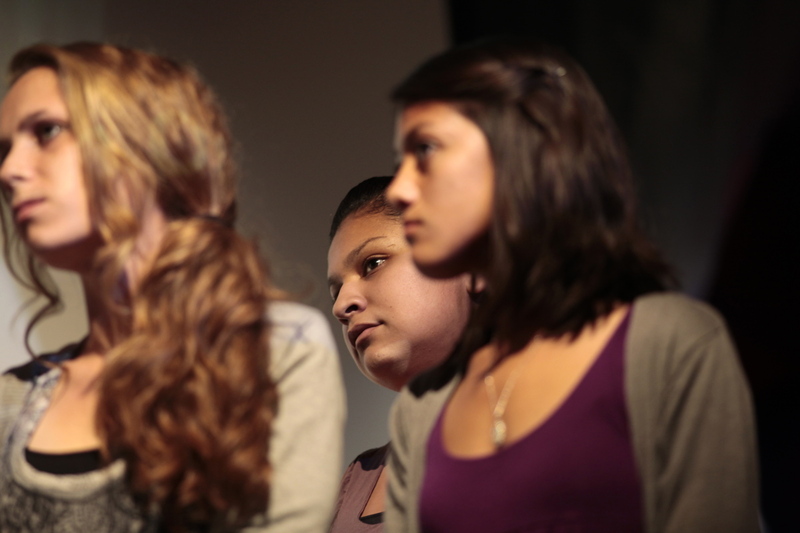 Shilpi’s reaction to the workshop in her poem, A Strange Species. 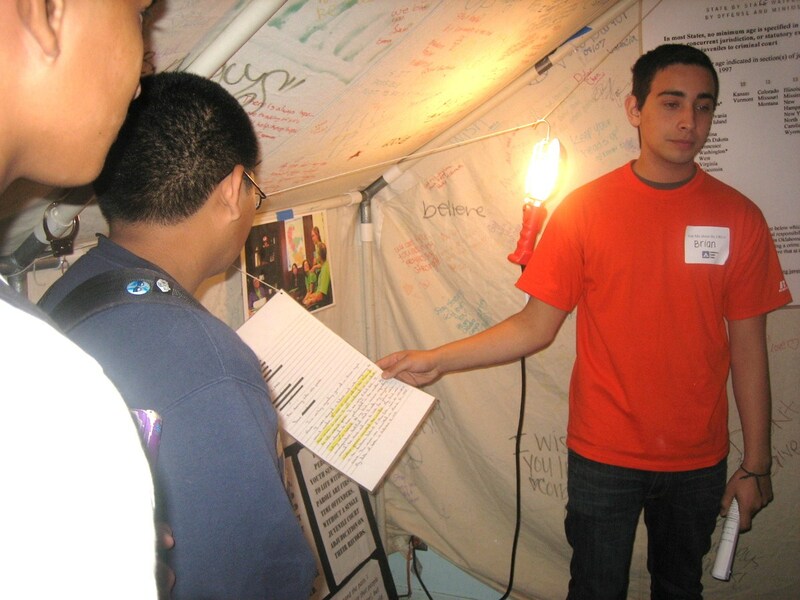 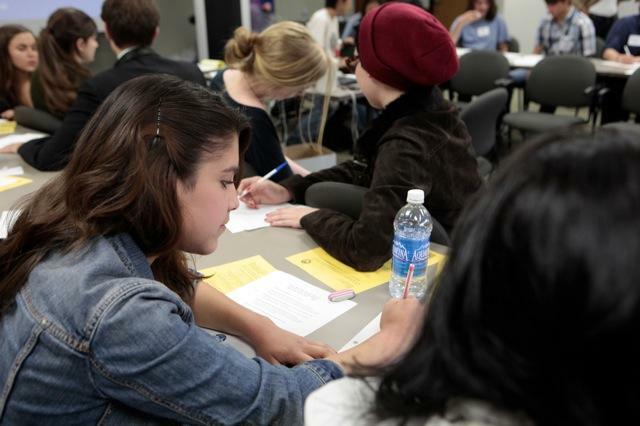 August 10, 2010: (Sacramento, CA) STF students partnered with the HRW Children’s Rights Division and the Youth Justice Coalition to raise awareness among CA Assembly members for the Fair Sentencing for Youth Act (SB 399). 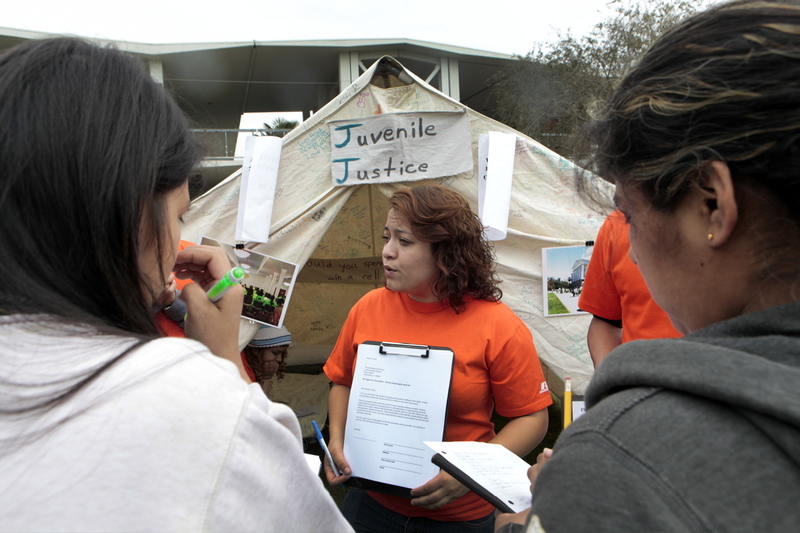 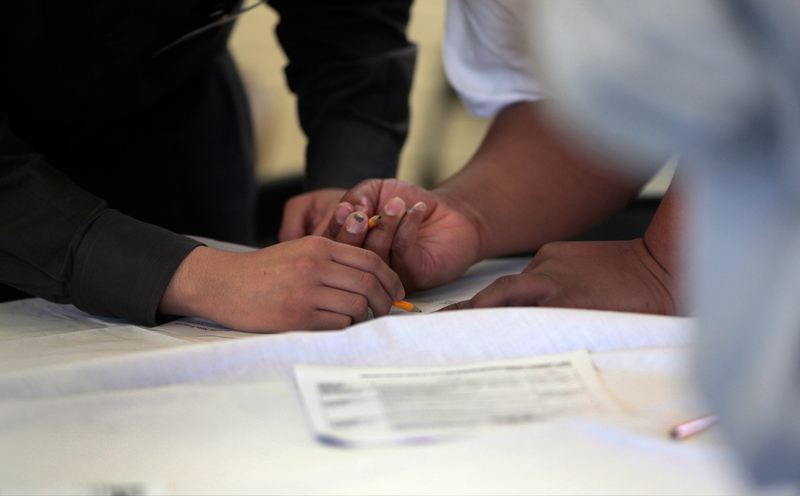 Together, STF students, families of incarcerated youth, and even wrongfully-convicted [now released] youth shared stories of inequities in the CA juvenile justice system with Assembly members. 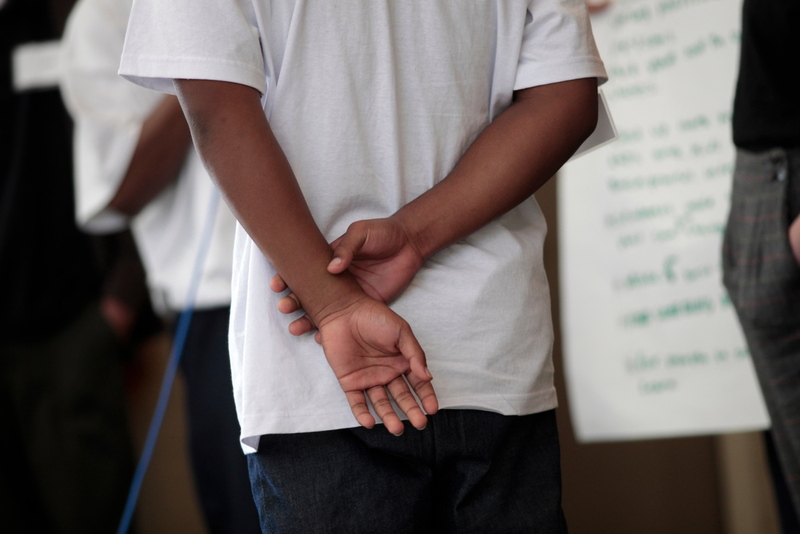 Although SB 399 was narrowly defeated by a 36-38 vote with 41 votes needed on August 30, 2010, STF will continue to educate on the need for Juvenile Justice. 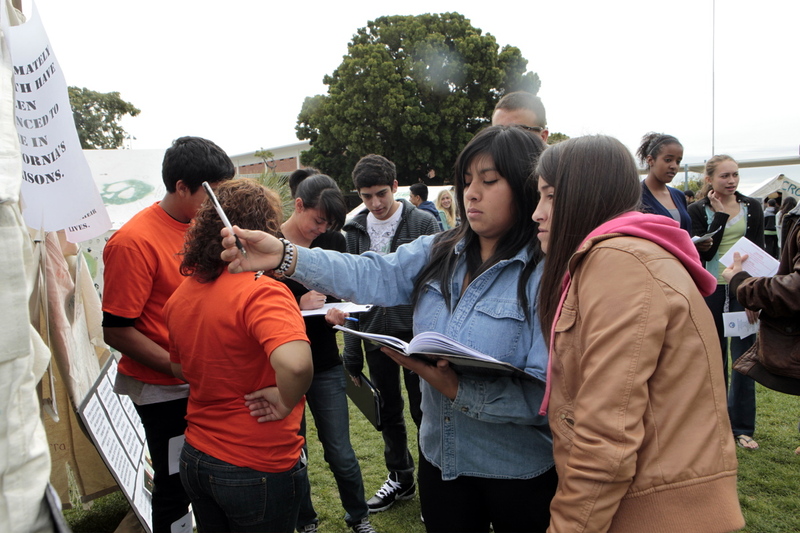 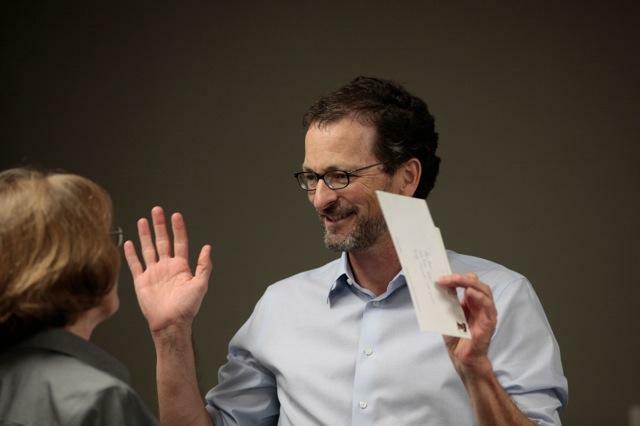 For more information on SB 399, please read the Los Angeles Times article.